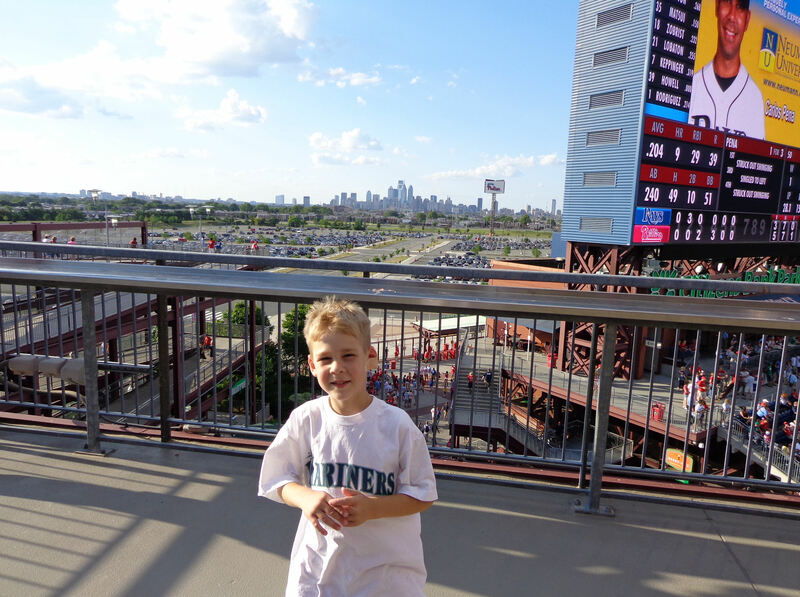 In our continuing effort to have Kellan see all 30 MLB teams play a game live, on July 13, 2013, we planned to attend the Phillies game vs. the Chicago White Sox. As American League teams go, the White Sox are right up at the top of the “Teams I Never Watch or Think About” list. So it was practically like we were all going to see them play for the first time. The game started with a little confusion. It was scheduled as a 4:10 Saturday afternoon start. But the Friday night game the day before was rained out. So our game was turned into Game 1 of a Separate Admission Doubleheader (the worst kind of doubleheader). 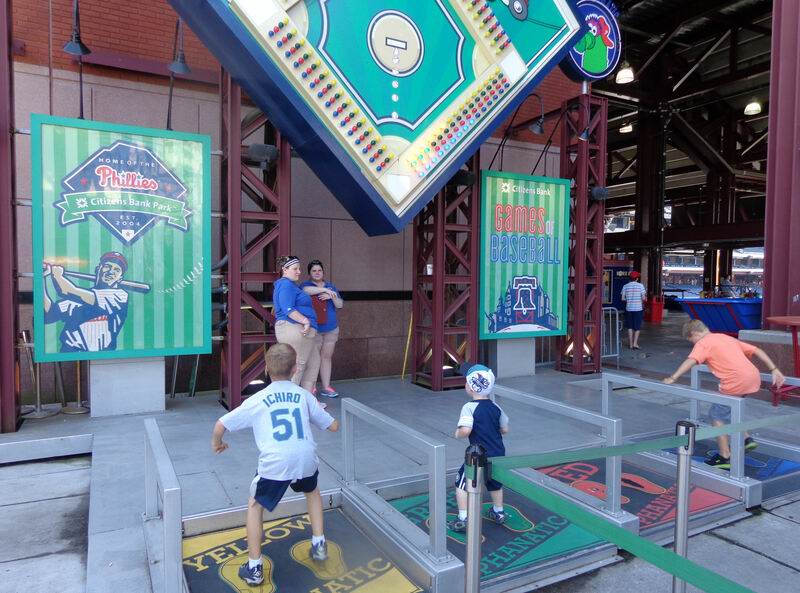 The problem was figuring out what time the game would start and the gates would open. 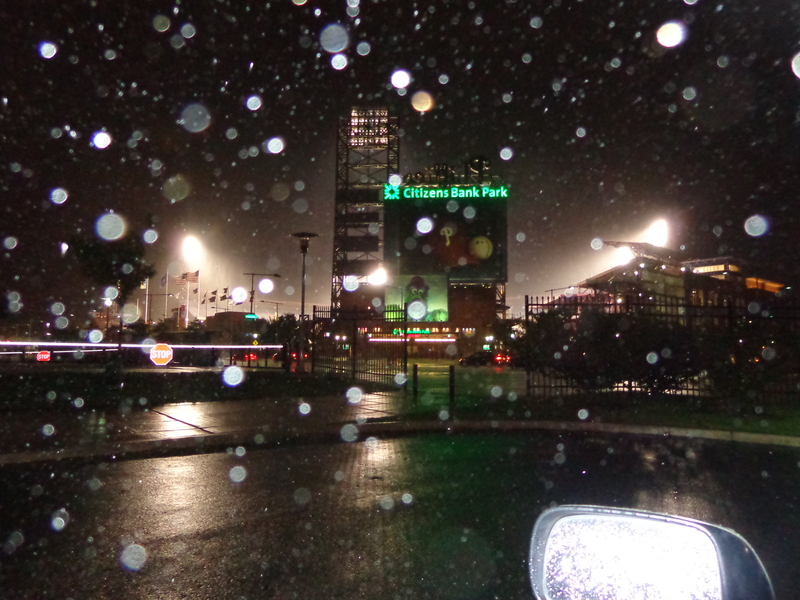 Late Friday night, I pulled up an article about the rain out on the Phillies website. But what I didn’t realize at the time that the Phillies’ website linked me to the White Sox website, which is based in the Central Time zone. When I read the game was going to be played at 2:00 on Saturday, I didn’t realize it was 2:00 p.m. Central, or 3:00 p.m. Eastern. The Phillies twitter account was thoroughly unhelpful I might effort to figure the situation out. Harrison Tishler, however, had all of the answers (and once I realized I had read a Central time zone-based article, I finally believed all of Harrison’s answers). …, normally they would open at 12:40 for a 3:10 game. 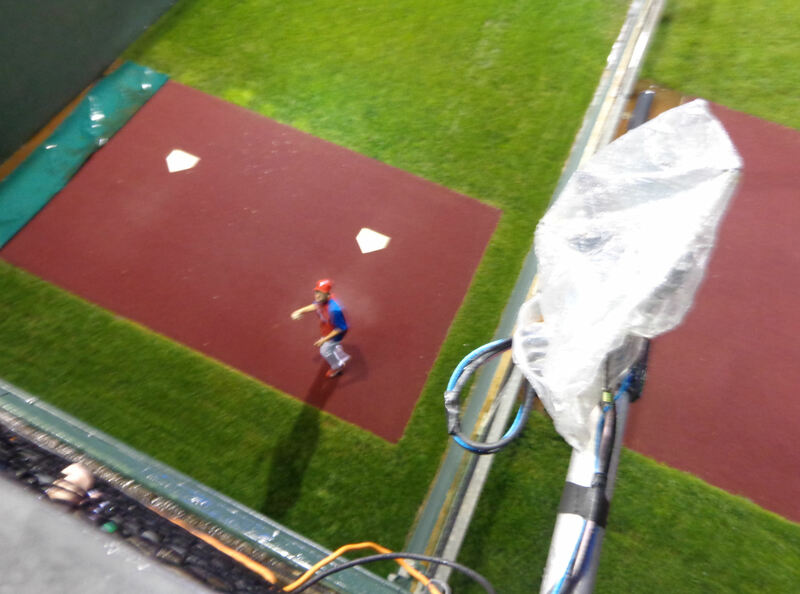 When we set up in the pizza wedge, there were two groundskeepers working on the Phillies mound in the bullpen (which is pretty standard two hours before game time at Citizens Bank Park). Very soon, Harrison and Seth Tishler arrived on the scene. 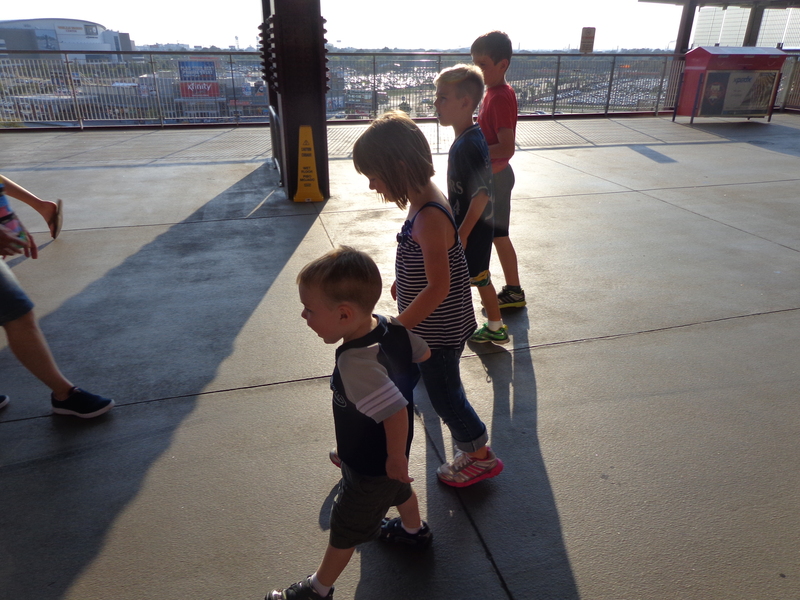 I asked Seth (and he agreed) to watch the boys for a minute while I ran up to the concourse to fill our water bottle at the drinking fountain. 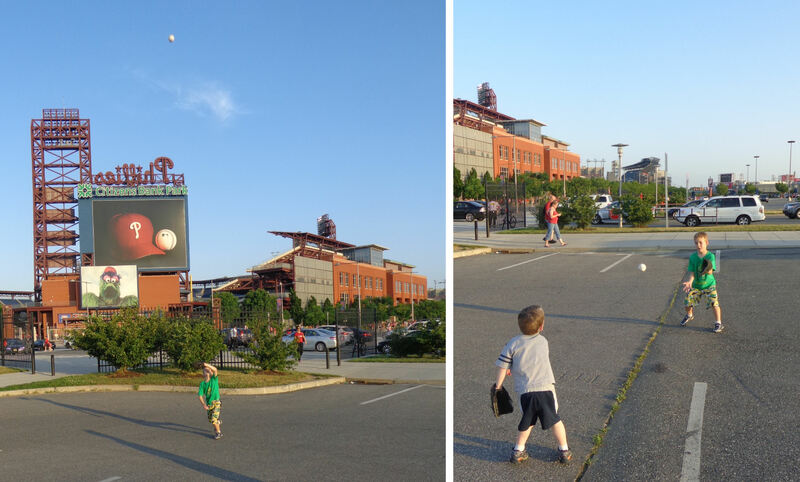 When I returned to the pizza wedge approximately 60 seconds later, Kellan had a baseball in hand. 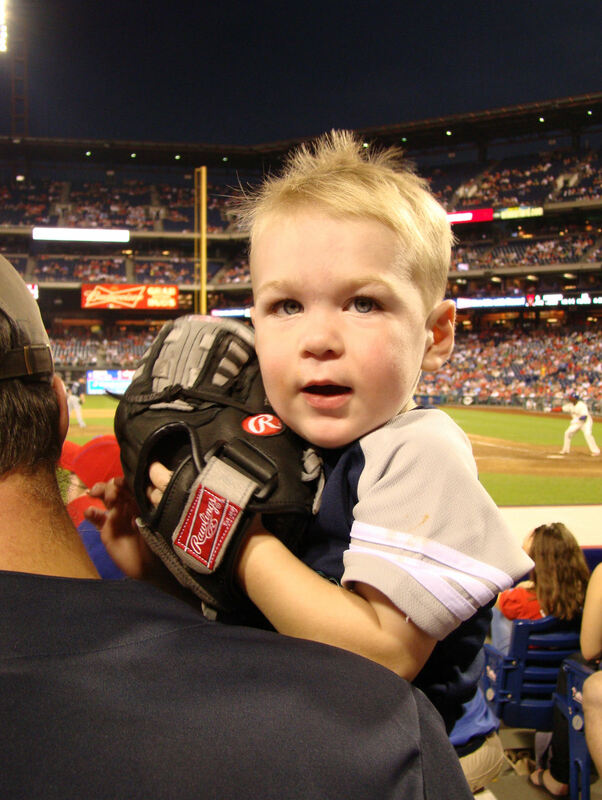 Turns out that Kellan dropped his glove into the Phillies bullpen. One of the groundskeepers retrieved it and tossed it up to Tim. 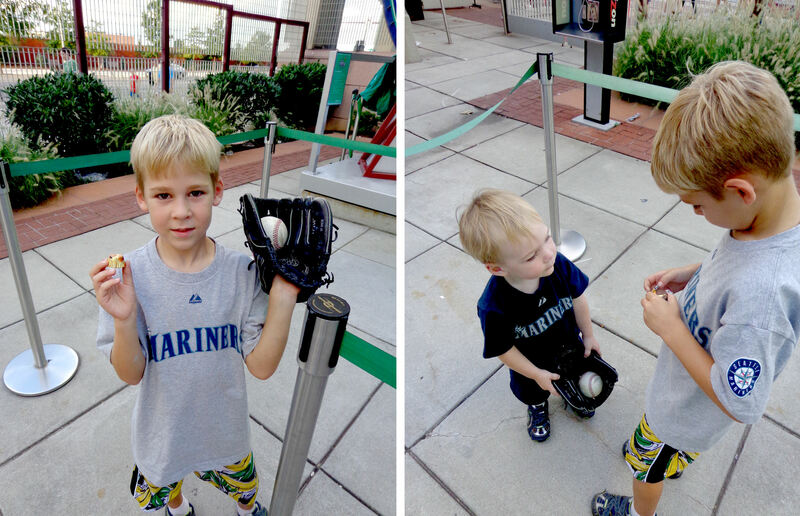 When Tim caught Kellan’s glove, this baseball was tucked inside Kellan’s glove. The Tishlers went off on their own as White Sox BP was set to get started. Shortly, Father and Son Orange Shirt showed up on the scene. See the empty seat in front of Kellan in the phone above? That’s seat number 3 in the pizza wedge. 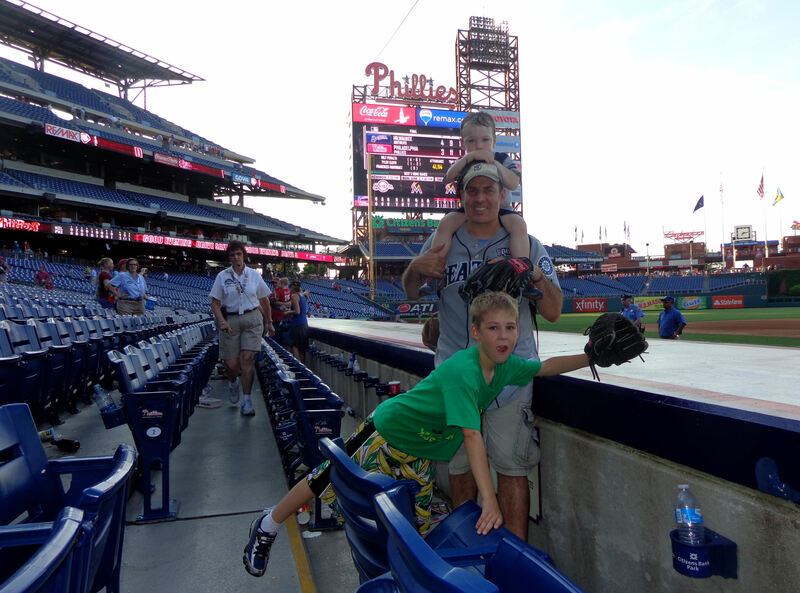 Tim, Kellan and I were taking up the corner spot plus seats 1-3 (our standard operating procedure at BP at CBP). There were zero other people in section 101. There was hardly anyone in all of RF. 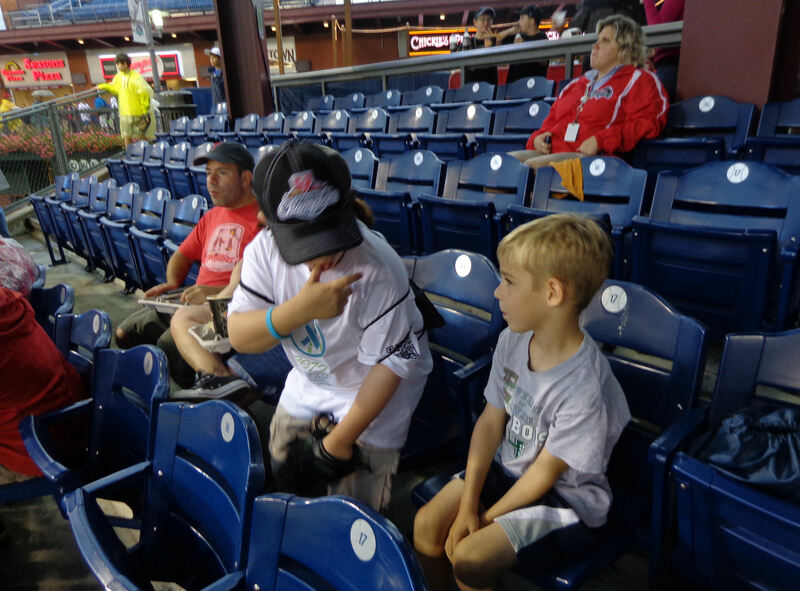 But these guys came in an camped out in seats 4-5. They were nice enough folks. We chatted a bunch. But I was not a fan of getting crowded in the corner when the rest of RF was essentially empty. 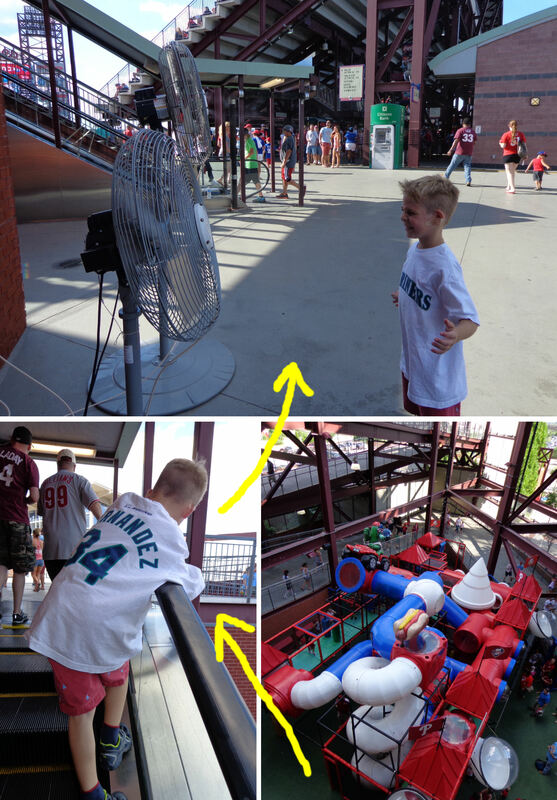 But the dad was gung­­-ho about getting his son a baseball from the bullpen (I explained that no one would be in the bullpen until around half hour before game time). Anyway, eventually Daryl Boston wandered out to RF. 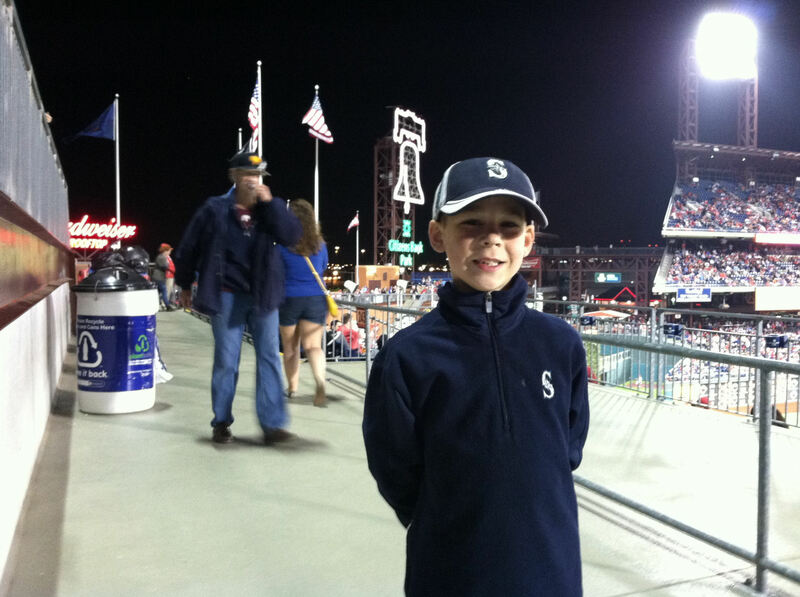 He was in front of section 102 or 103 and he was hitting baseballs against the OF wall with a fungo bat. I could see his “17” on his back. 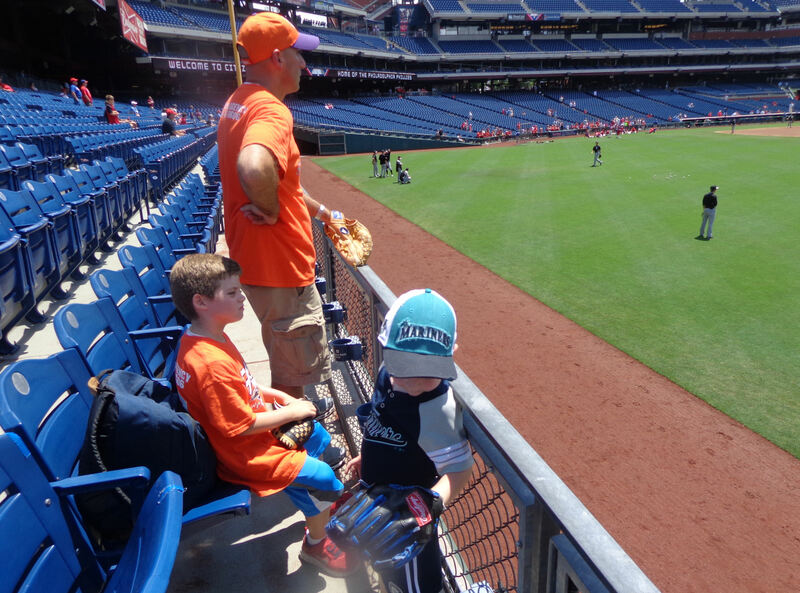 Just then, the Dad in the Orange Shirt was flipping through one of the little booklets that lots of MLB teams give out that are full of info about the team and the current series, etc. It looked, to me, that he was looking at the White Sox roster. I looked over at the booklet (yeah, in an empty OF, the guy was so close that I could read the booklet in his hands) and scanned the “coaches” portion of the roster. There it was: No. 17 = Ron Wotus. [FYI, Ron Wotus is a coach for the San Francisco Giants, something I did not learn until much later]. As “Wotus” started walking toward LF, I called out, “Hey, Ron, Fungo!” and I flapped my glove. “Ron” immediately tossed a baseball into the air and tried to delicately fungo the ball to me. But it fell short. He tried again. It fell short again. Then he walked over and picked up one of the balls and tossed it up to us. As you can imagine, Boston’s reaction to my “Hey, Ron, fungo!” request did nothing to dispel my thinking that Boston was Ron Wotus. Later, Matt Lindstrom walked by and I told him about “Ron” hitting the fungo into the elevator. He tried to get it for us, but the elevator was locked! Number 40 is Ramon Troncoso. 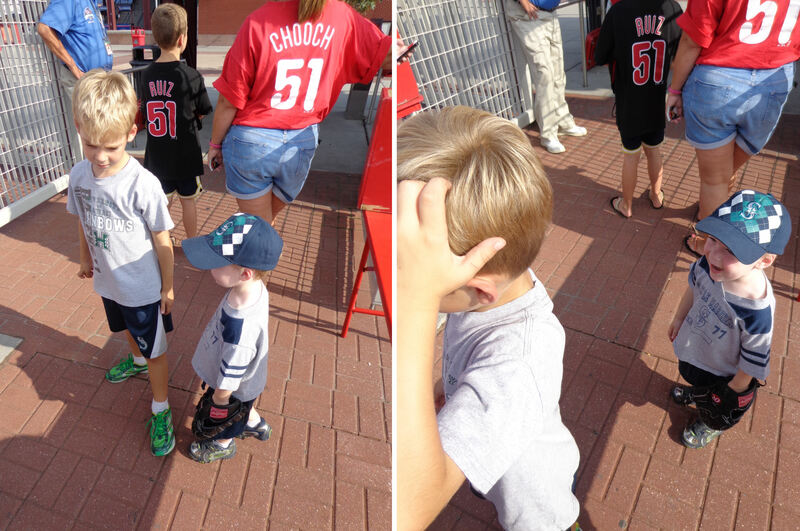 He was the only guy out in LCF not hiding his jersey with a pullover so he was the only person whose name I knew. The other guy? No clue who he is. 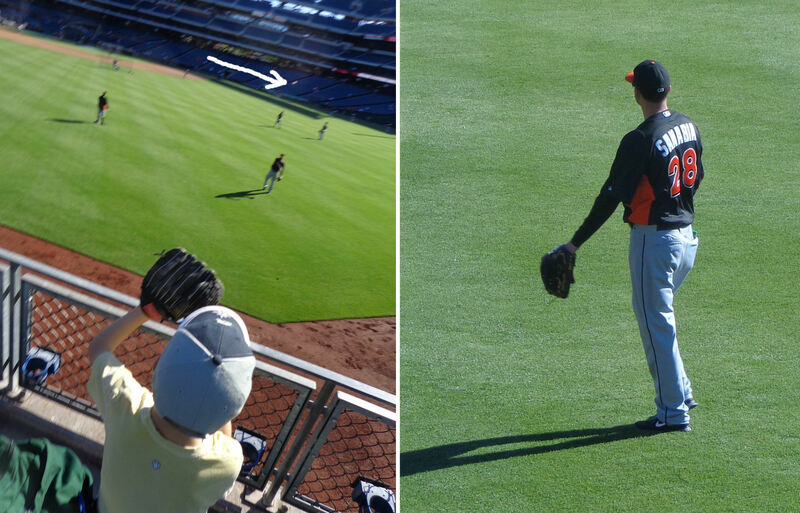 Eventually, I decided we should try to get a ball for the Kid in Orange. 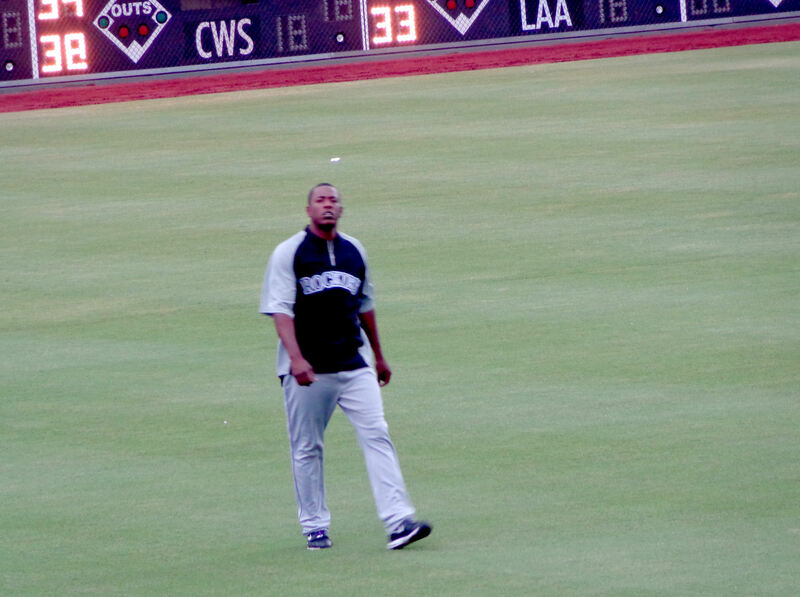 I ended up calling out “Ramon!” when he fielded a ball near us and, when he looked up at me, I pointed at the little guy. 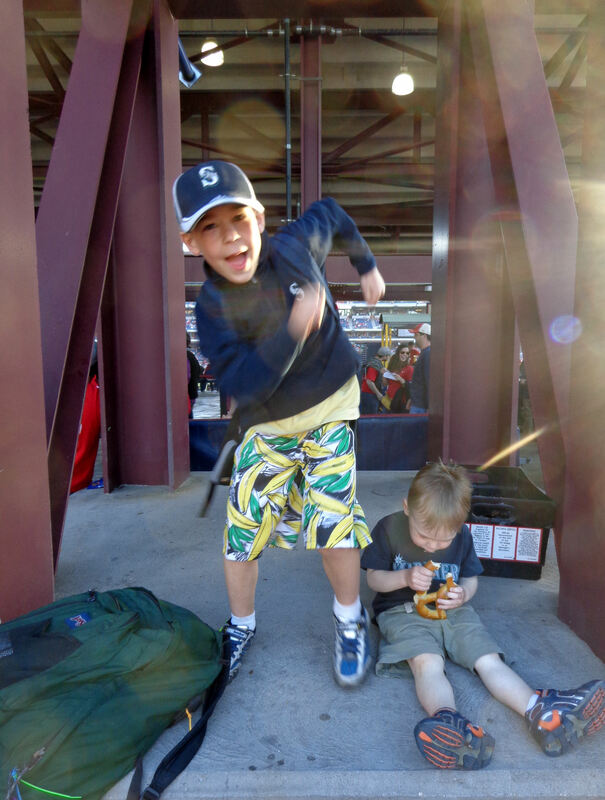 Ramon tried to toss the ball to the kid’s dad, but he tossed it too high. It sailed over him and I caught it and handled it over to the Orange Guys. 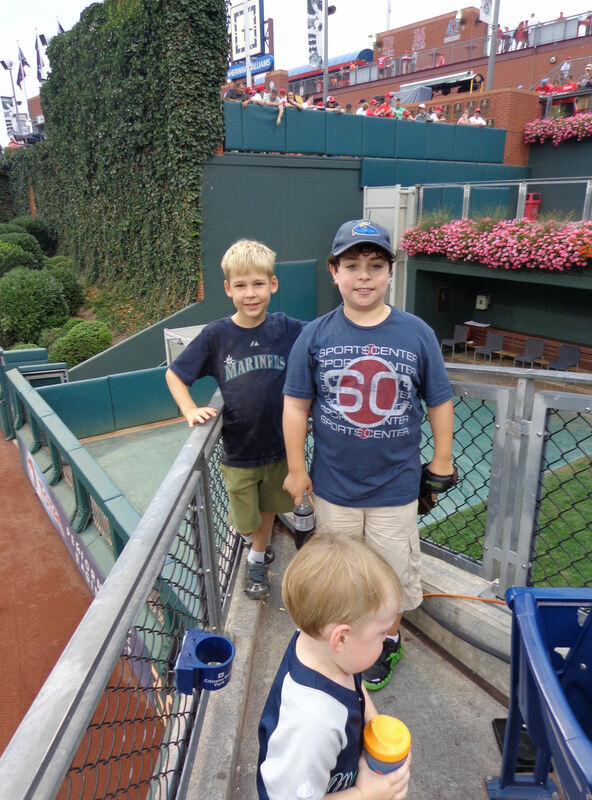 A few minutes later, the other guy in the picture above tried to toss a ball to us, but threw it over us and the Dad in Orange caught it and handed it to us. Then I proposed something that seemed quite logical to me: I caught the ball from Ramon Troncoso, the Guy in Orange caught the ball from the other guy, why don’t we switch balls so we have the ball I caught and the Orange Folks have the ball they caught? He thought my logical was sound. And so we switch balls. And we ended up with the ball I’d previously caught from Ramon. So, thanks, Ramon…and other guy. 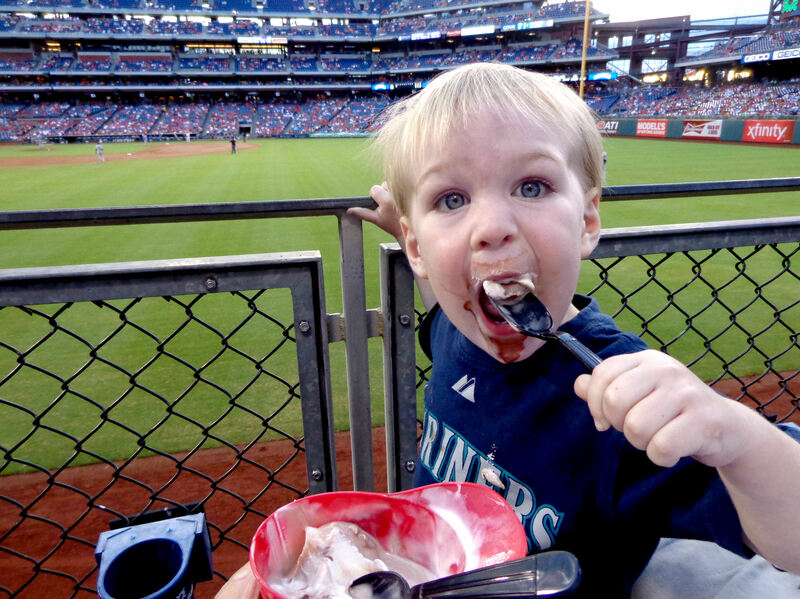 …and Tiamo couldn’t resist those two Mariners fans’ cute little faces. 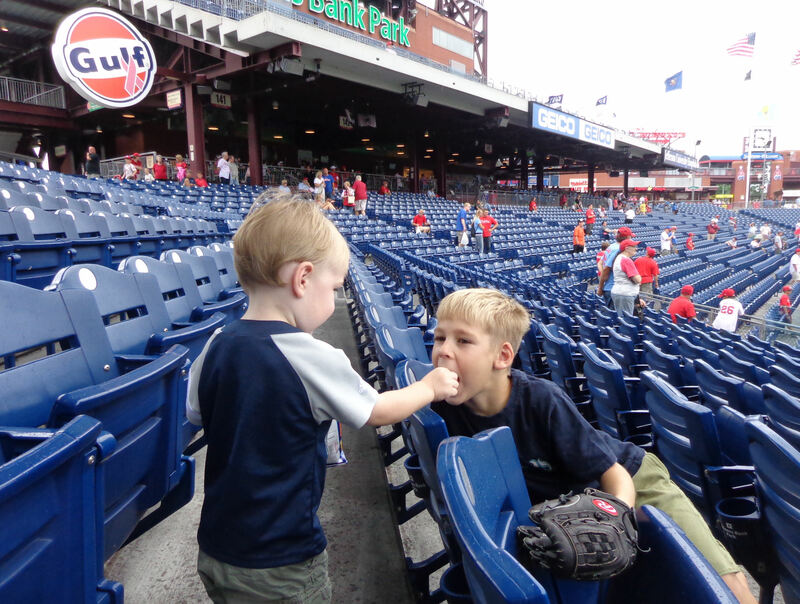 He went and grabbed another baseball and tossed it to Tim. That’s White Sox catcher Josh Phegley standing at the top of the stairs in the visitors’ bullpen. 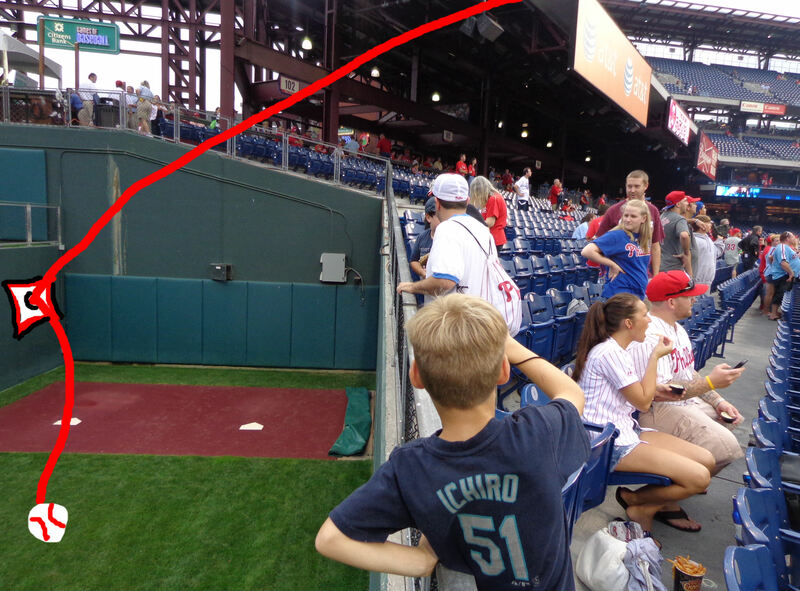 Right after Jesus tossed the ball to Tim, Phegley headed down the stairs from the visitors bullpen to the Phillies bullpen. 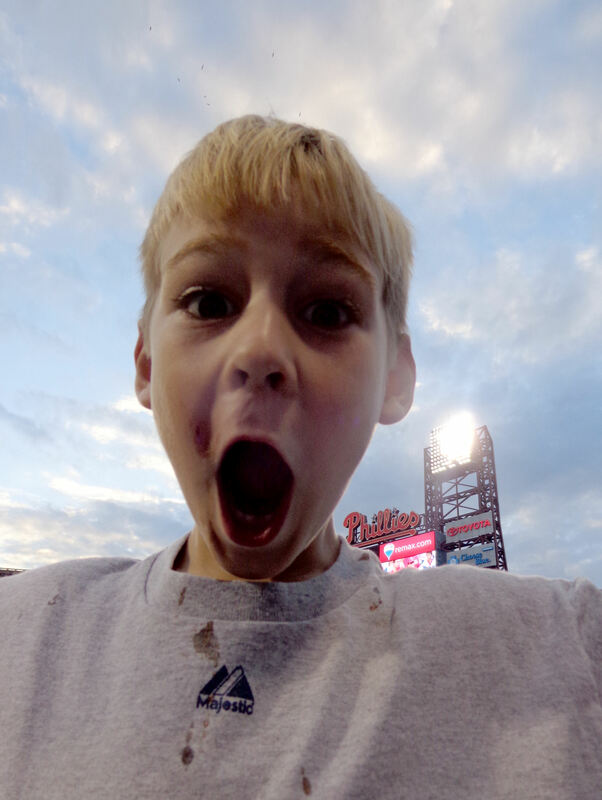 When he hit the landing at the Phillies bullpen, he called out to us, and he tossed us a baseball. 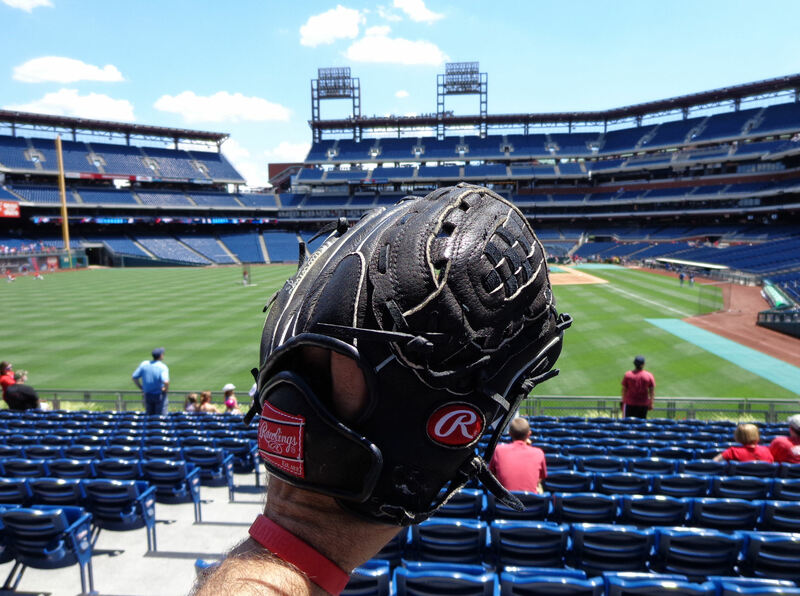 In the picture above, you can see this baseball in Phegley’s right hand! This is the only game we’ve ever seen this thing at in Philadelphia. It’s a good idea. The kids loved it. Not sure why it wasn’t there more often. Well, I was wrong. Our banana split featured TWENTY-ONE cherries! 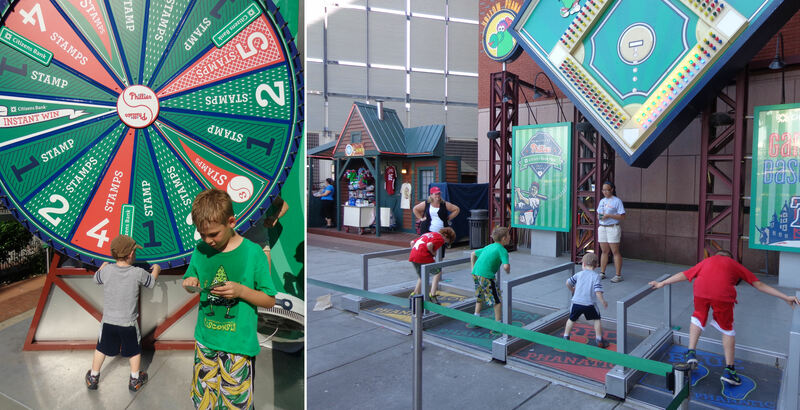 The game started while we were out in the RCF concourse eating ice cream and then playing more Games of Baseball. 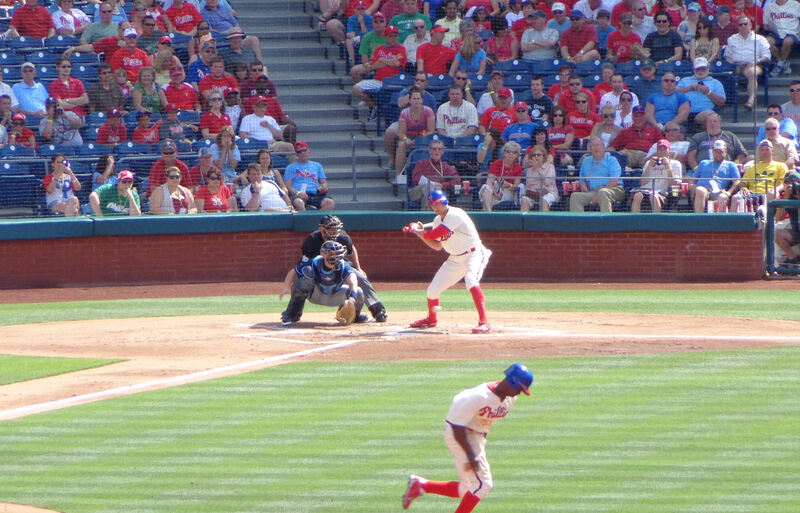 The Phils jumped on the White Sox early, scoring two runs in the bottom of the first inning. And check out those great seats! I should note that this game was our last game before Kellan turned 3-years-old. 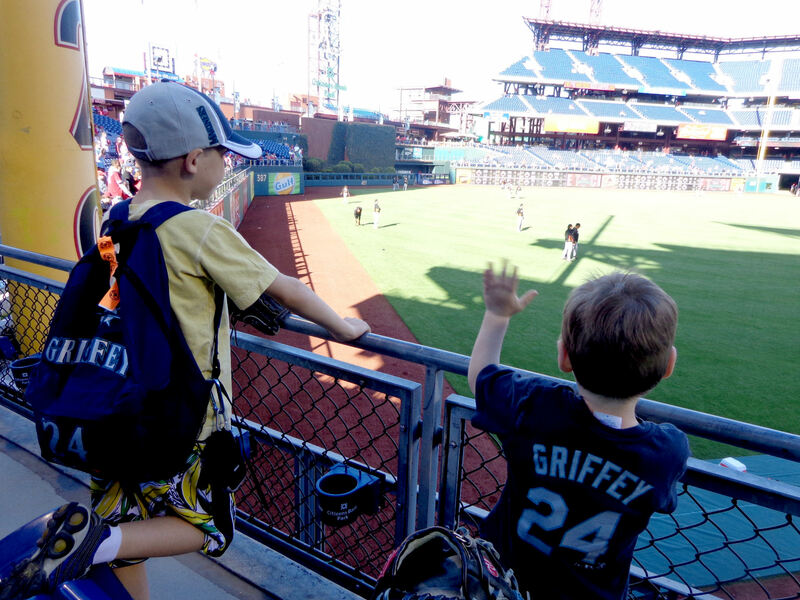 It was his last *free* game at Citizens Bank Park. 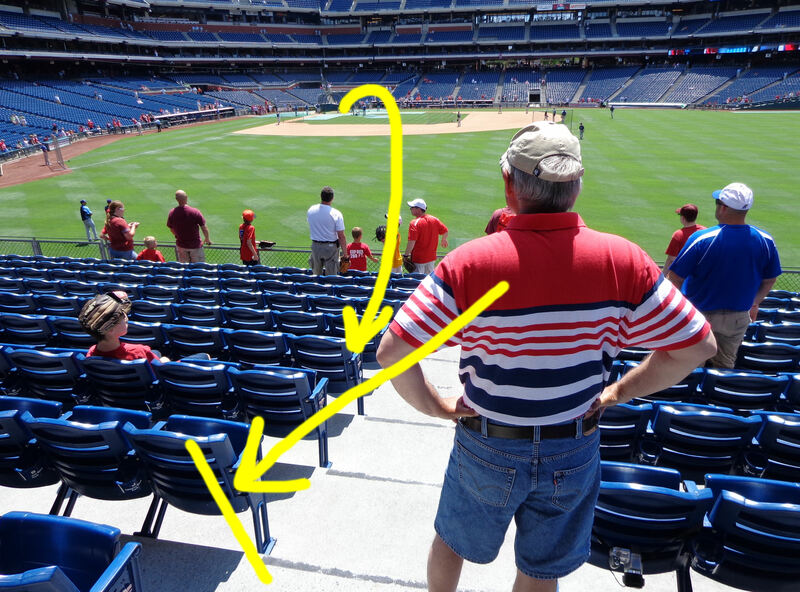 I scooped up these two aisle seats in section 102 on stubhub for cheap the morning of the game. And it ended up that the people with seats 3-6 were missing a seat mate who had to skip the game. So they didn’t mind having one of us sit in seat 3. 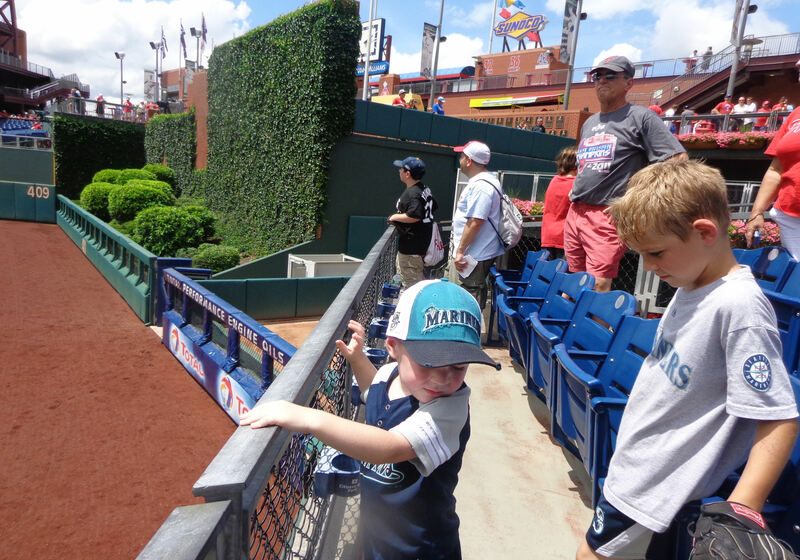 Kellan wanted to hang out in the aisle the whole time, and watch the players in the bullpen. 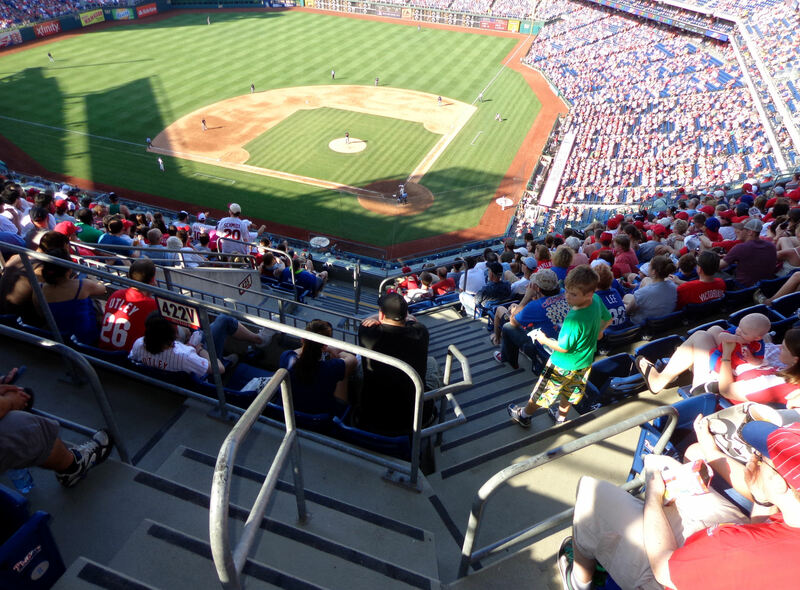 Section 101 and 102 are Citizens Bank Park are some of the coolest seats around. 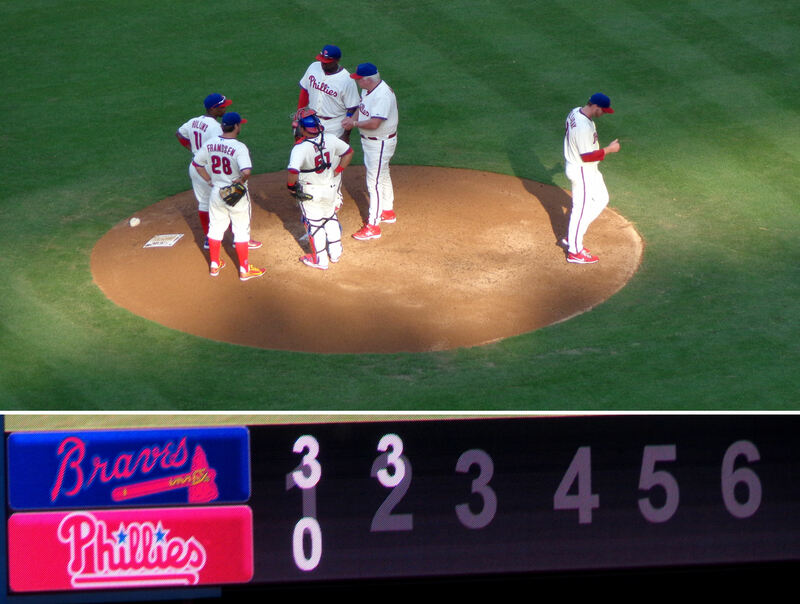 It was the second Phillies hit of the inning, but the White Sox wiggled out of the jam. 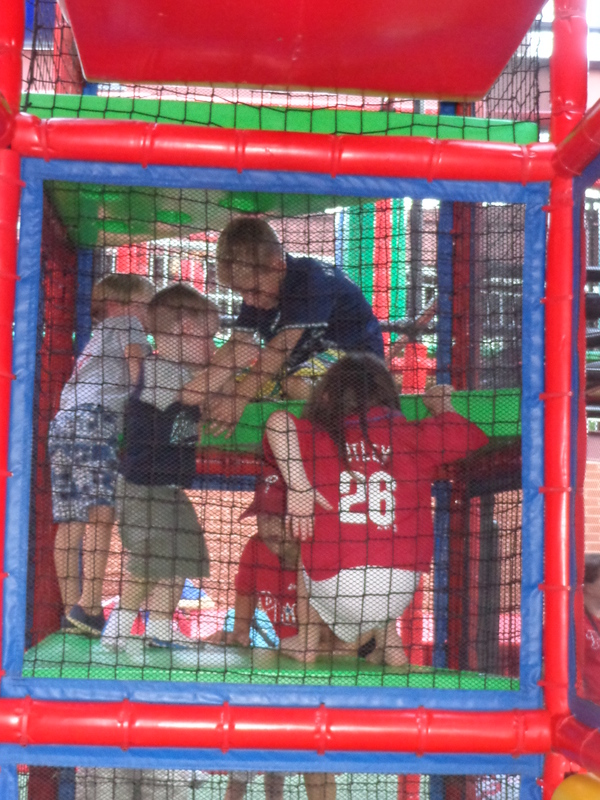 We were in the play area in the fifth inning when Alejandro De Aza hit a 2-run double to tie the game up at 2-2. …and Adam Dunn scored the go-ahead run for the White Sox. There were a whole bunch of nuns up there. …to deeeeeeep CF. That tied the game up at 3-3. See that red arrow up there? That’s pointing at one of the steel beams holding up the light towers along the 3B side of the stadium. 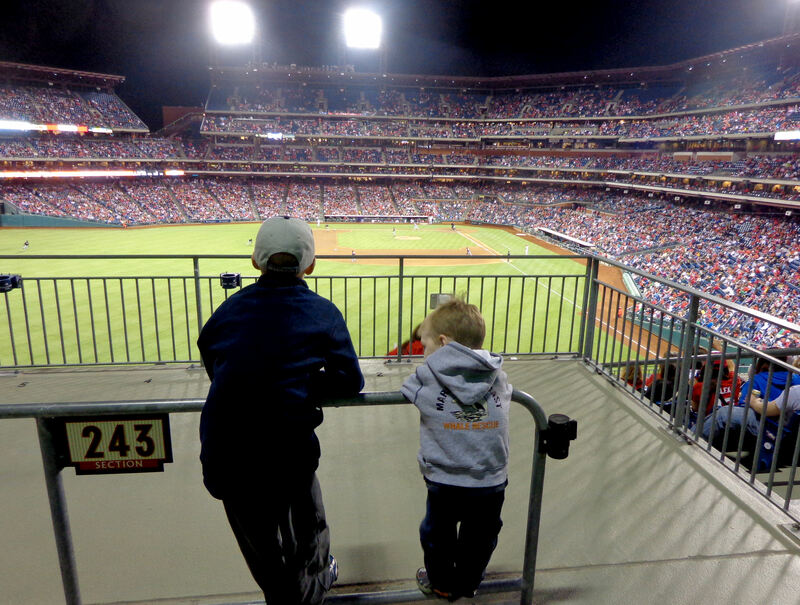 When we are up in section 428, Tim and Kellan often spit seeds down the middle of the light towers. On this day, while doing so, Tim and Kellan found some animal tracks on the beam. We couldn’t tell what kind of animal it was. But the tracks looked like they were the size of maybe a cat or a raccoon. It was pretty odd finding the tracks and imaging animals climbing around inside the stadium. With the score tied in the 8th inning, we decided to head back to our seats in section 102. 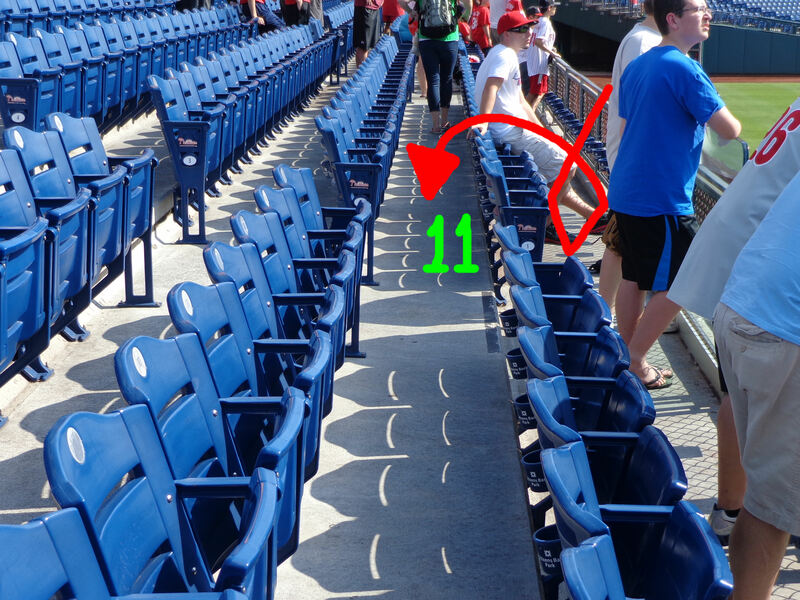 But when we got there, there were a bunch of empty seats in section 101 (the best section in the ballpark). We grabbed some seats in the third row. When an usher standing at the bottom of the stairs saw us, he told us to move up to the front row. So we’ve been listening to a lot of classic Metallica on our game day drives this season – mostly Master of Puppets, some Ride the Lightning too. On the way to this game, we listened to Ride the Lightning. 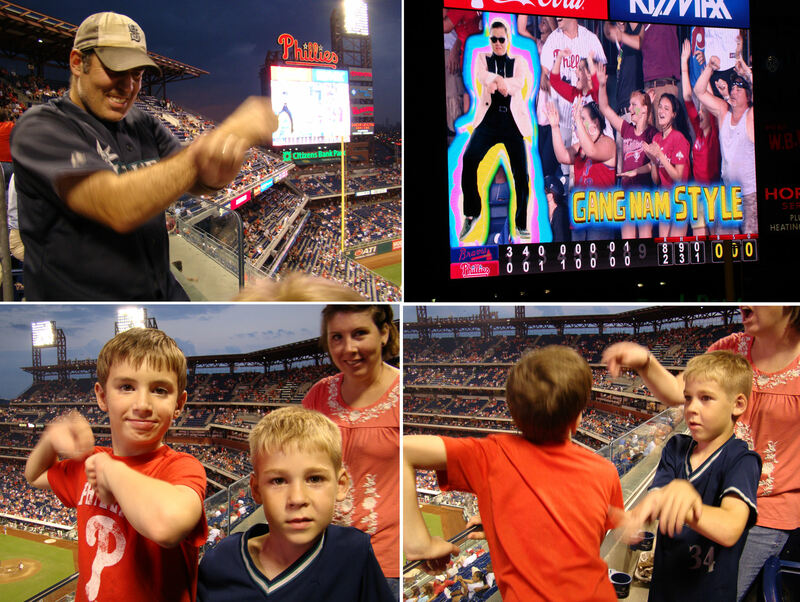 When Jonathan Papelbon headed to the mound in the top of the ninth inning, I was a proud father when Tim pointed out that his entrance song (For Whom The Bell Tolls) was one of the songs we listened to (and discussed) on our car ride down to this game. 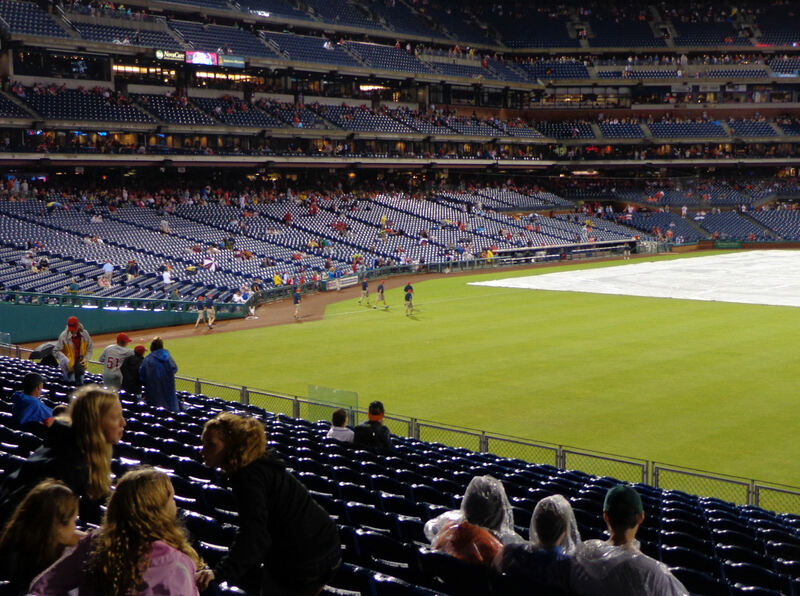 After the final out of the top of the ninth inning, the Phillies cleared off the field, and then came the rain, and the tarp, and a rain delay. 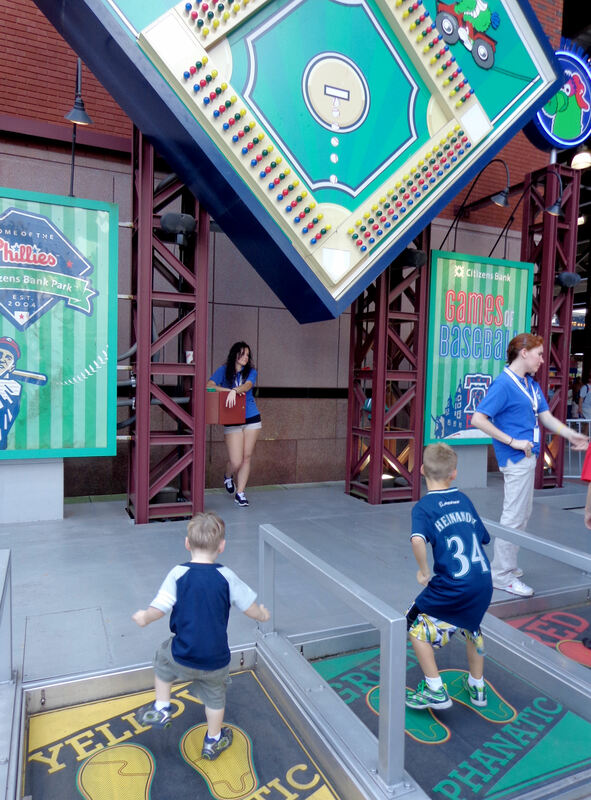 The Phillies should have won the game in the bottom of the ninth. 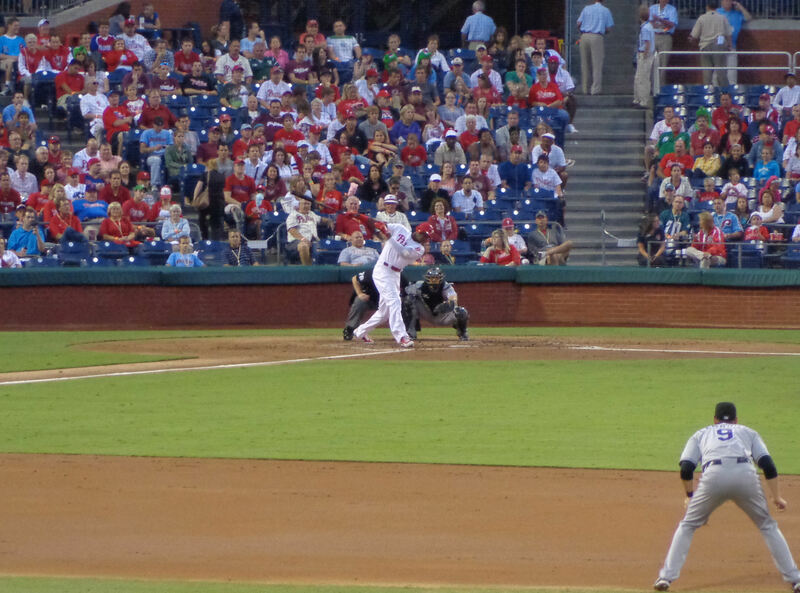 Kevin Frandsen lead off the inning with a single. He took second on a Darin Ruf’s follow-up single. 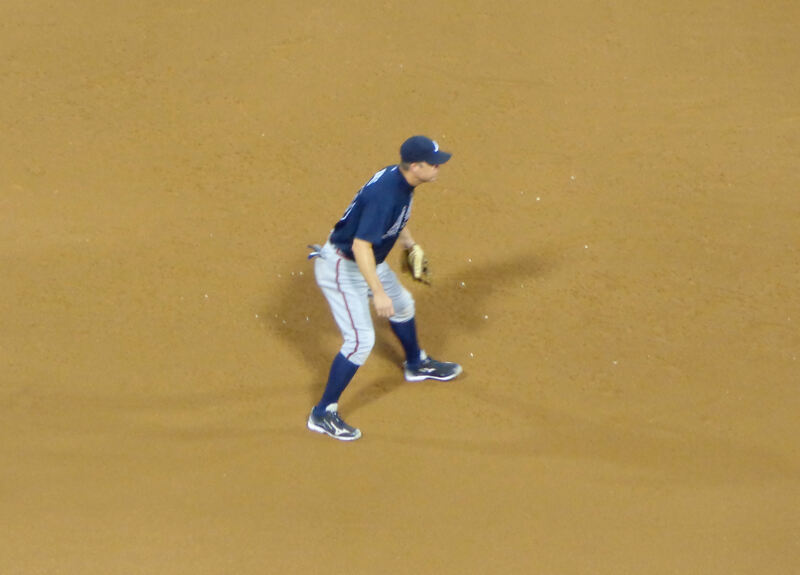 Braves pitcher Nate Jones then balked Frandsen to 3B and Ruf to 2B with no outs. But the next three batters couldn’t get it done. 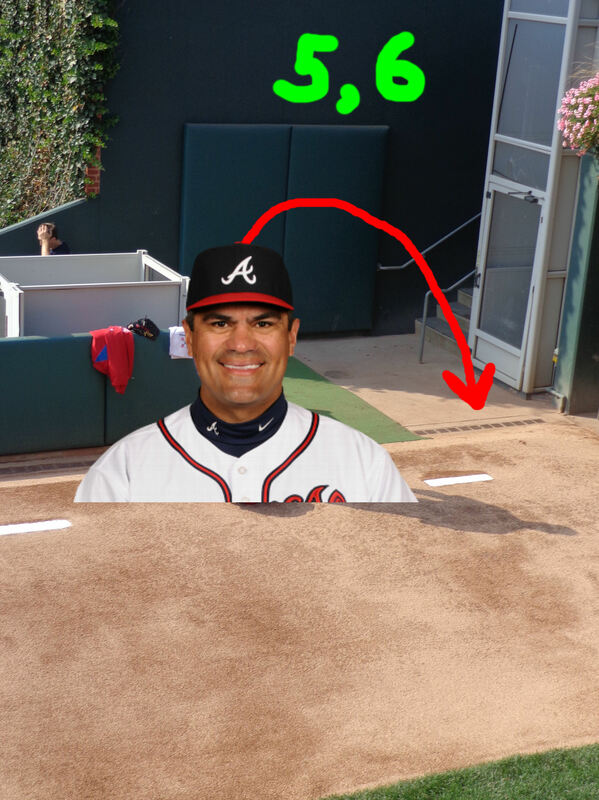 Carlos “Chooooooch” Ruiz flew out to shallow LF. Lance Nix struck out swinging. 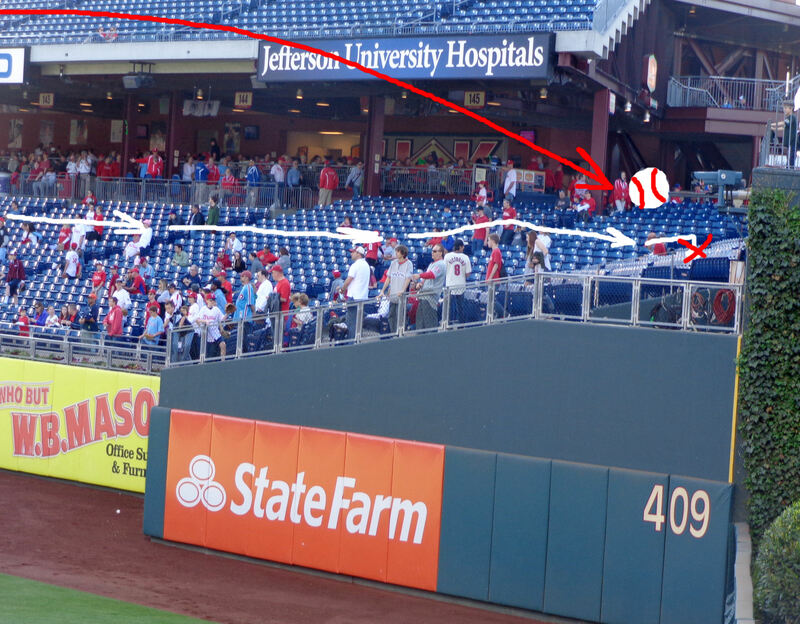 And Ben Revere ended regulation play with a line-out to RF. So we got some free baseball. Remember, this was the first game of a separate-admission doubleheader. 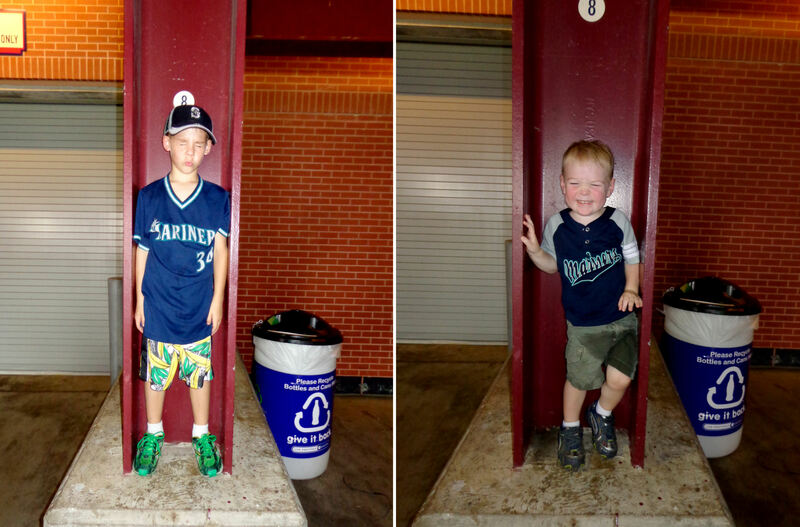 After a 41 minute rain delay, fans were already lining up at the gates for game 2 when our game headed into extra innings. 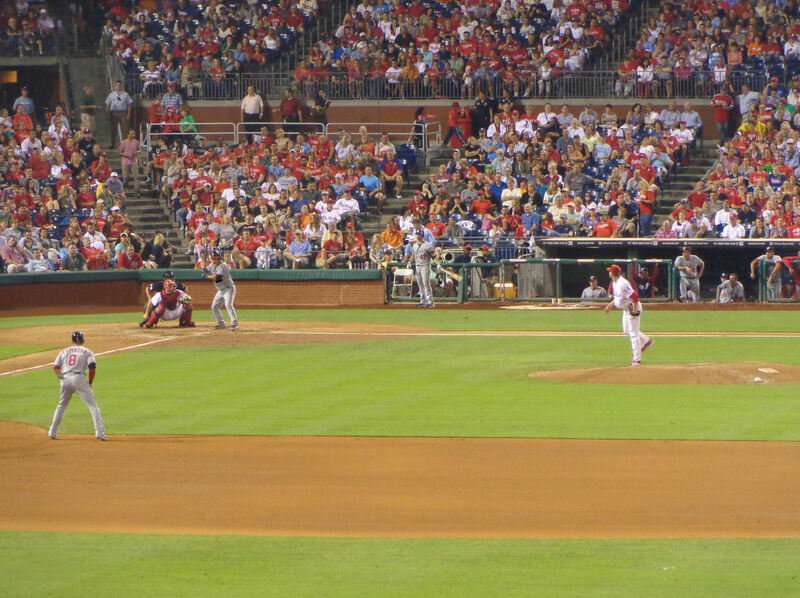 J.C. Ramirez pitched the top of the 10th inning for the Phillies. 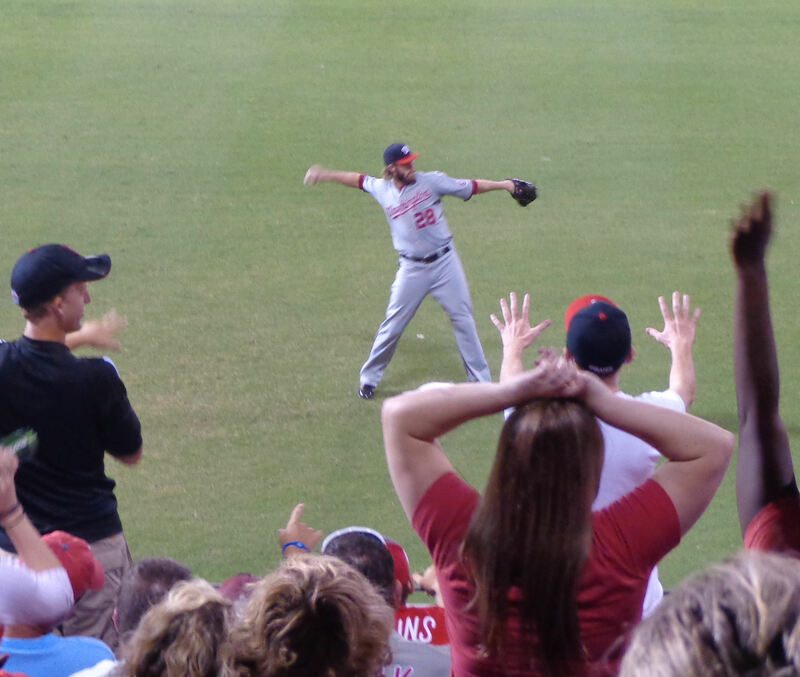 During the bottom of the ninth inning, Ramirez warmed up right behind us in the Phillies bullpen. At one point, Ramirez uncorked a wild pitch to Jesus Tiamo. It kicked off the back wall and ricocheted out into the grass in front of Tiamo. They grabbed a new ball to finish Ramirez’s warmup session. The ball was so exciting and the game so long, that Kellan drifted off to sleep in the tenth inning with the ball snug in his glove. …not in the top of the eleventh. After recording two quick outs in the top of the eleventh, Ramirez gave up a triple followed by an RBI double followed by an unearned run scoring grounder to short. 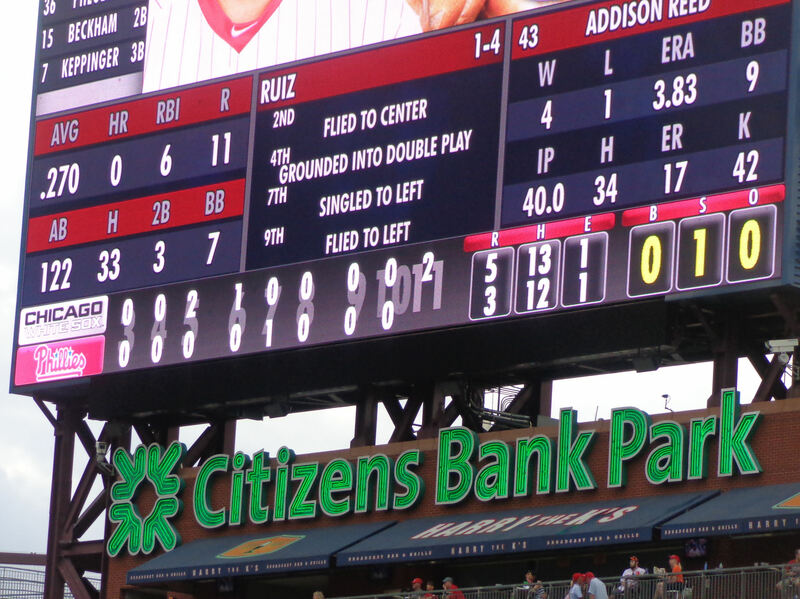 The Phillies mustered one run in the bottom of the frame, but that was all she wrote. The White Sox won 5-4 in 12. …before heading to the gates and pushing our way through the in-bound crowd. 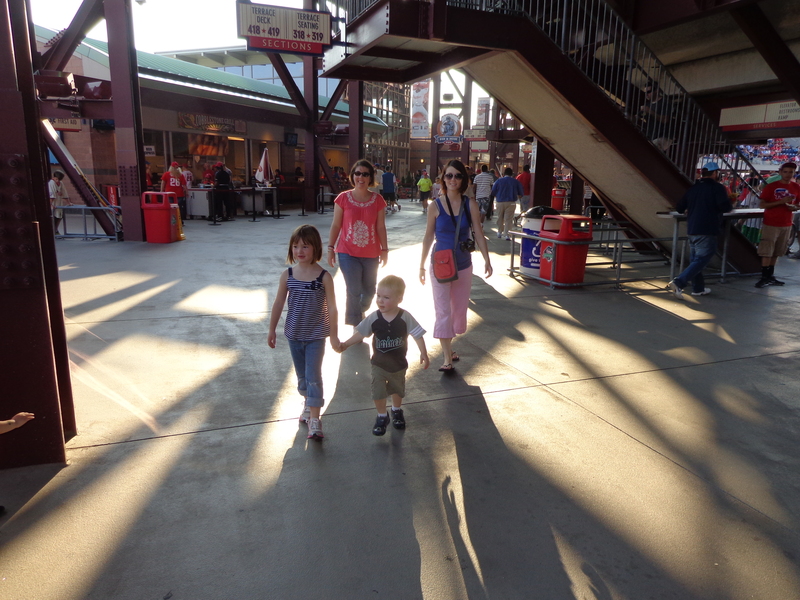 …on our way home while the Phillies began their second extra-innings game of the day! 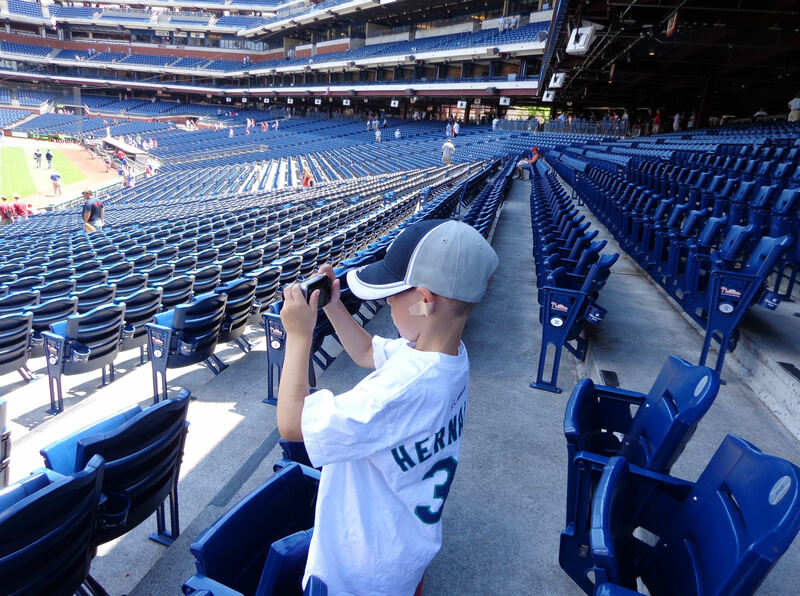 On June 1, 2013, we continued our quest to have Kellan see all 30 MLB teams play a game live. 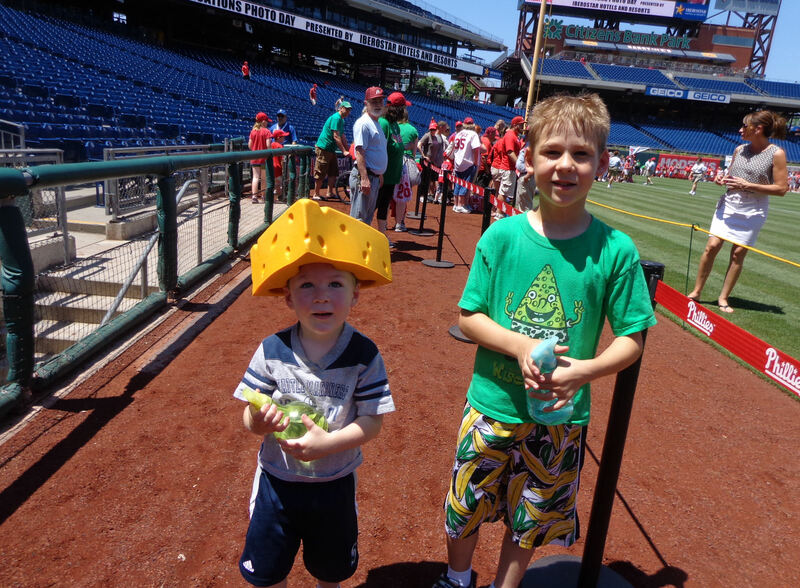 The Brewers were on the “must see” list and they were in Philadelphia, and so were we. The reason for the big crowd: it was Photo Day! 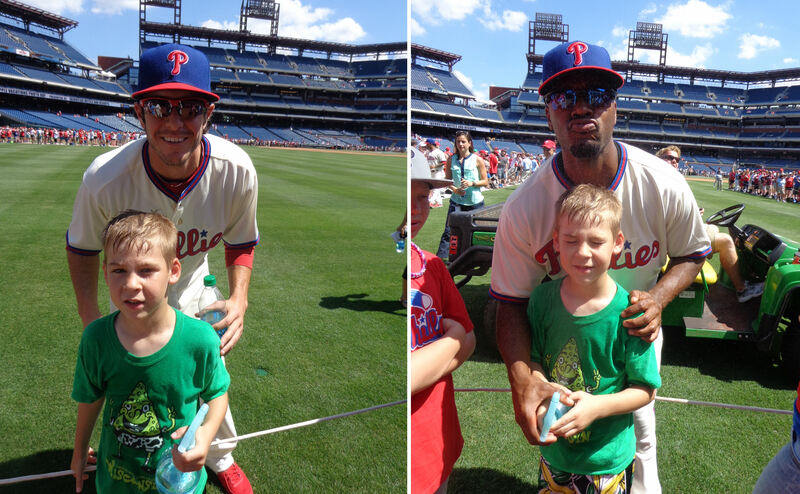 The Phillies’ website said fans could get photos of their favorite Phillies on field starting at 2:30. I didn’t know exactly what that meant for the pregame schedule. The stadium was going to open at 1:30. Would there be an hour of BP before moving on to the Photo Day festivities? No. As we reached the seating bowl, the field was already set up for Photo Day. I wish I would have taken a picture of it from the concourse, but I just wanted us to get down there onto the field. 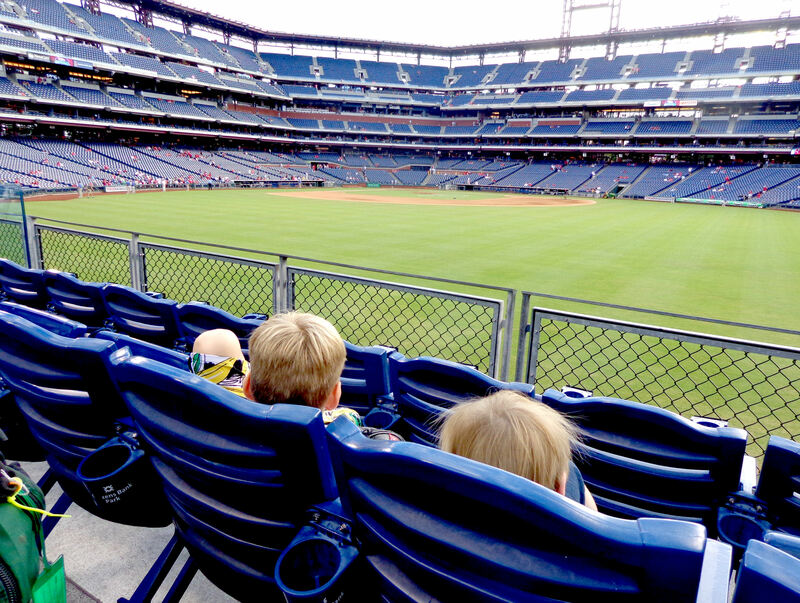 Several gates to the field were open along the front row of the foul territory seats on both sides of the diamond. 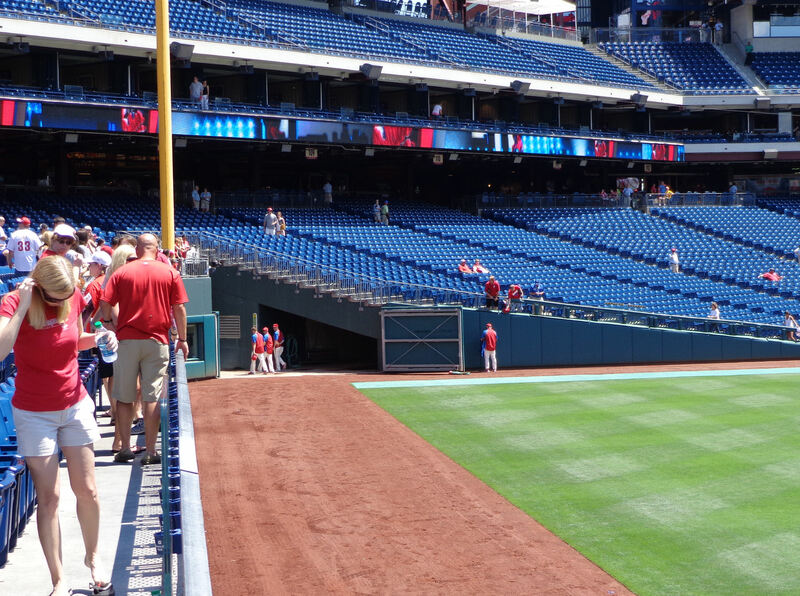 Fans could walk around pretty much the whole field (with limited exceptions, like in front of the Phillies dugout). 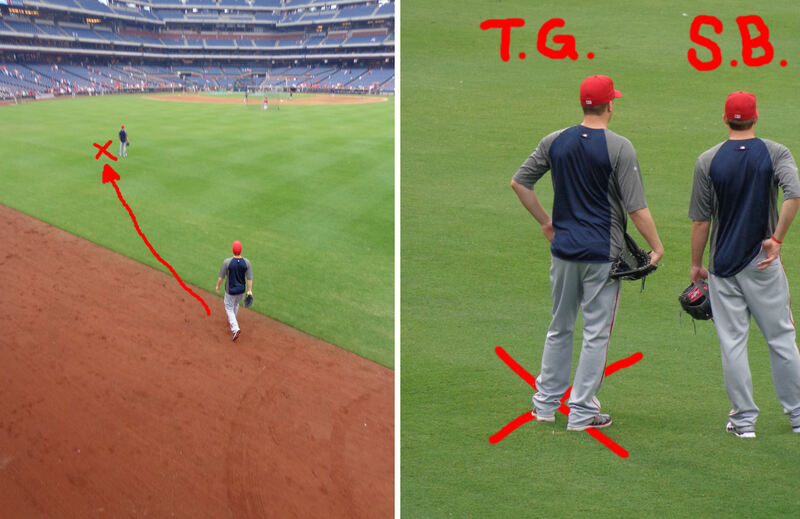 In the outfield, there were two catwalk’esque runways put together on each side – two in LF and two in RF. 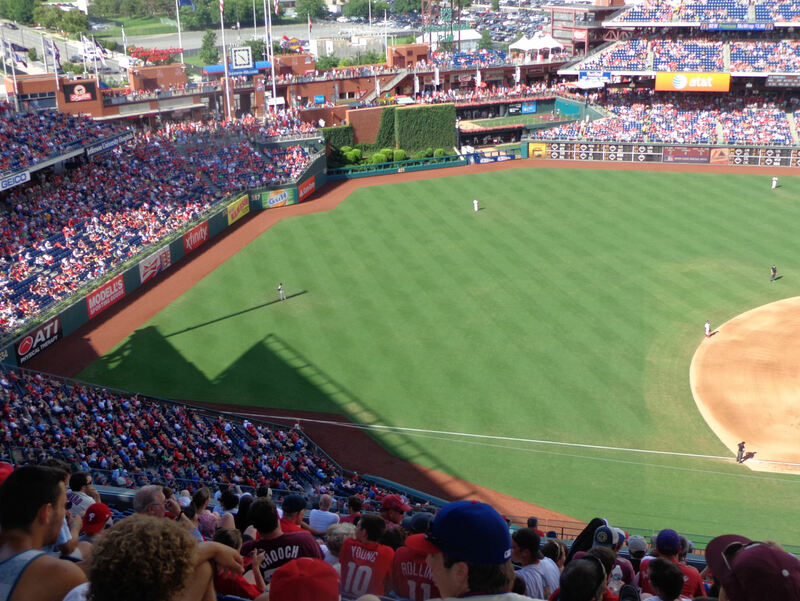 The runways ran about half way out into the outfield grass from the warning track and fans could stand out in the OF waiting for the Phils to arrive. 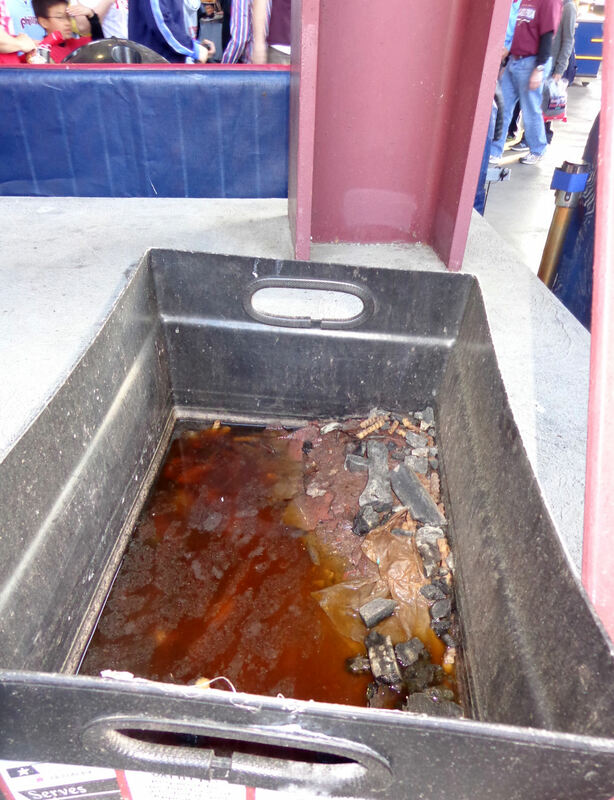 …and in front of the Brewers dugout. 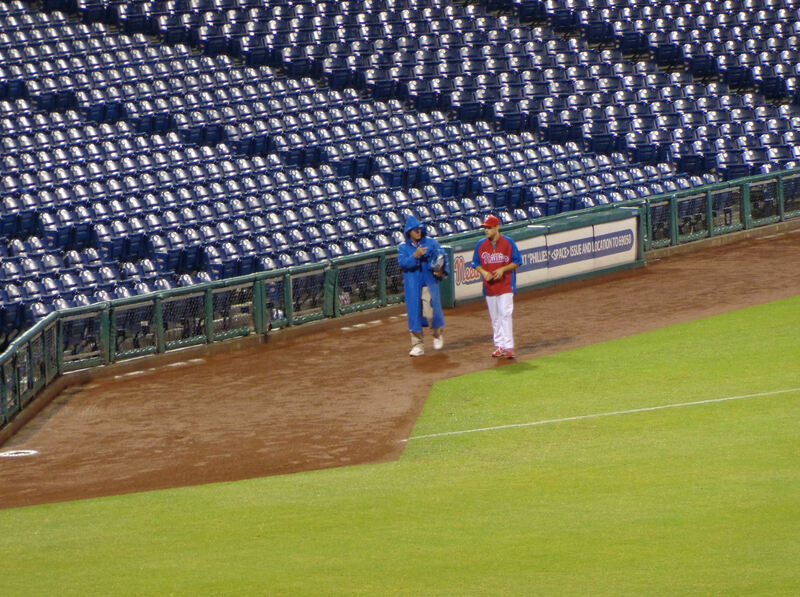 Interestingly, while the fans were blocked from going in front of the Phillies dugout, there were no similar restrictions in front of the Brewers dugout. If a Brewer wanted to come out to the field to run, stretch or throw, he had to walk through the crowd. It was pretty awesome. (By the way, this was the exact same situation that they had at Photo Day at Fenway Park in April). 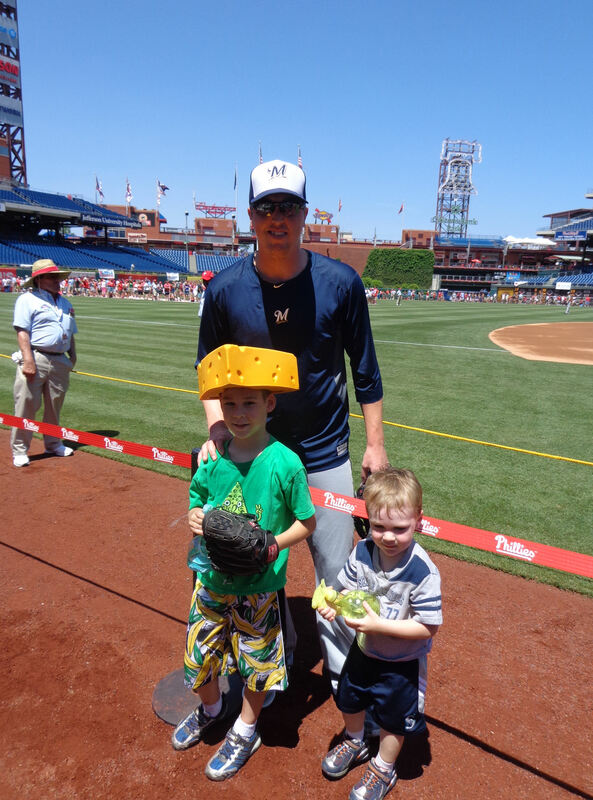 I bought Tim that cheesehead Kellan is wearing in the photo above while I was on a business trip to Milwaukee in 2012. I figured it would be funny to wear at a Brewers game, and this was our first opportunity. Guess what? 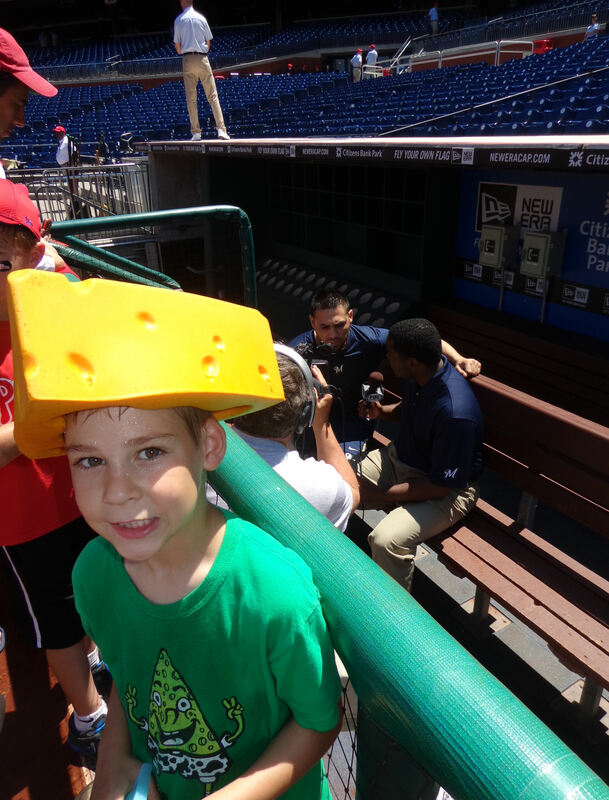 Everyone loves a fan wearing a cheesehead. We could hear people commenting on it all around us while the boys were passing it back and forth. 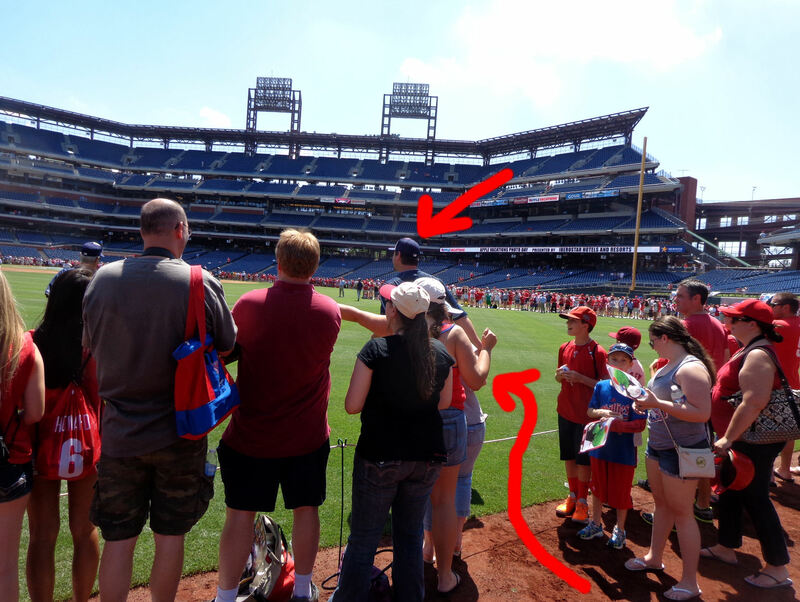 By the way, we were hanging out right here because half of the warning track was blocked off for fans in wheelchairs, but there were none at the time so it was a totally unblocked view of the field. 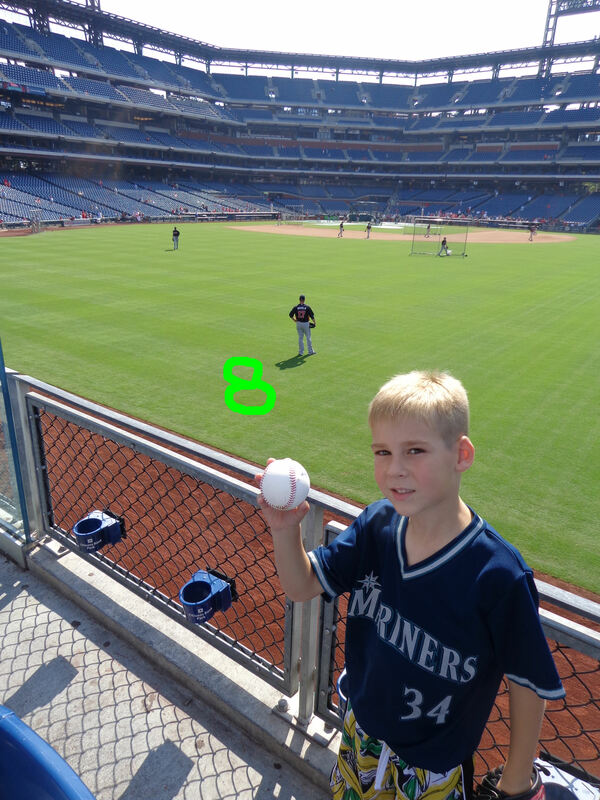 …he tossed a baseball to us after playing catch with several Brewers. …burning hot TV camera. After touching it, I was surprised it hadn’t spontaneously combusted. It was firey hot from the sun, which was beating down hard on us. I wanted to find Yuniesky Betancourt. 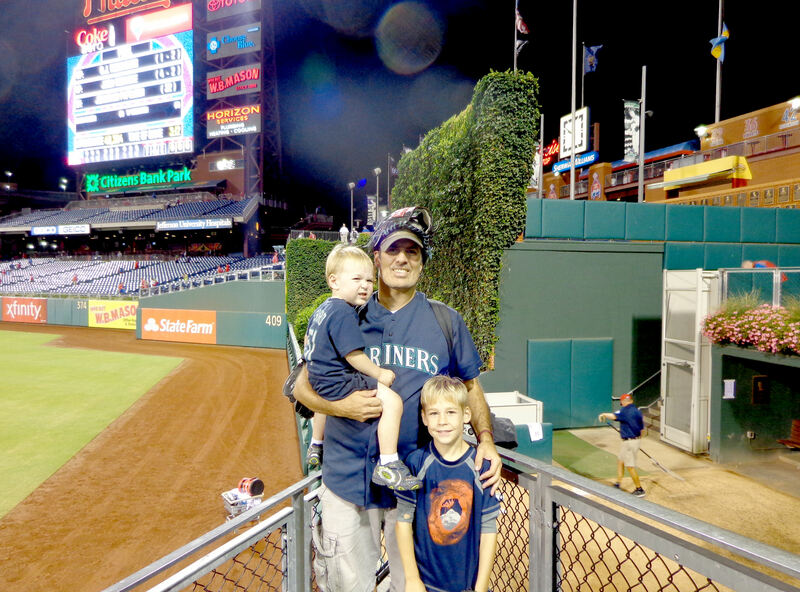 I was hoping to get my picture with him because (1) he’s a ex-Mariner, (2) he’s always been very nice to us, and (3) I was wearing my Jose Lopez jersey (who was Yuni’s doubleplay partner and buddy while in Seattle). 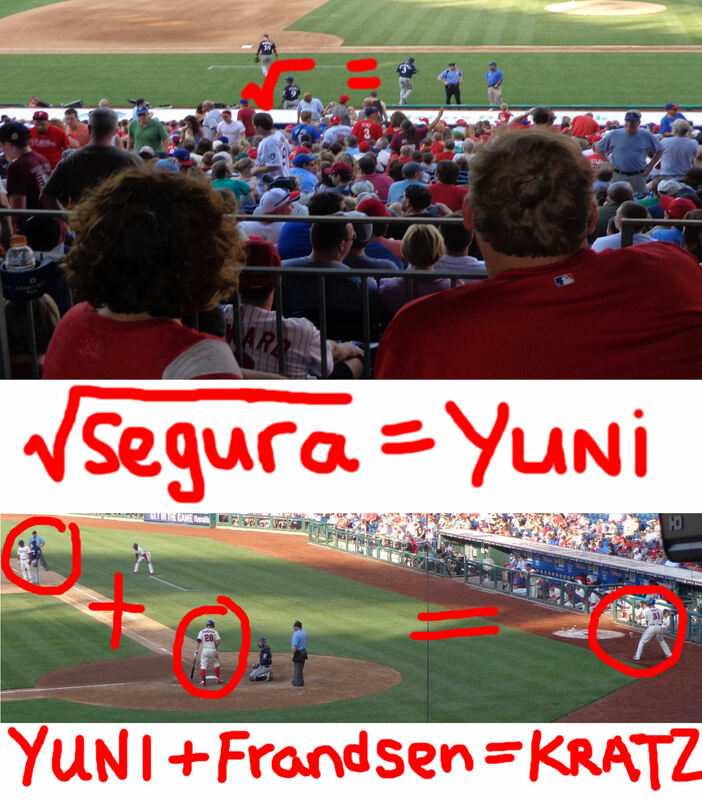 But Yuni was nowhere to be found during pre-game festivities. 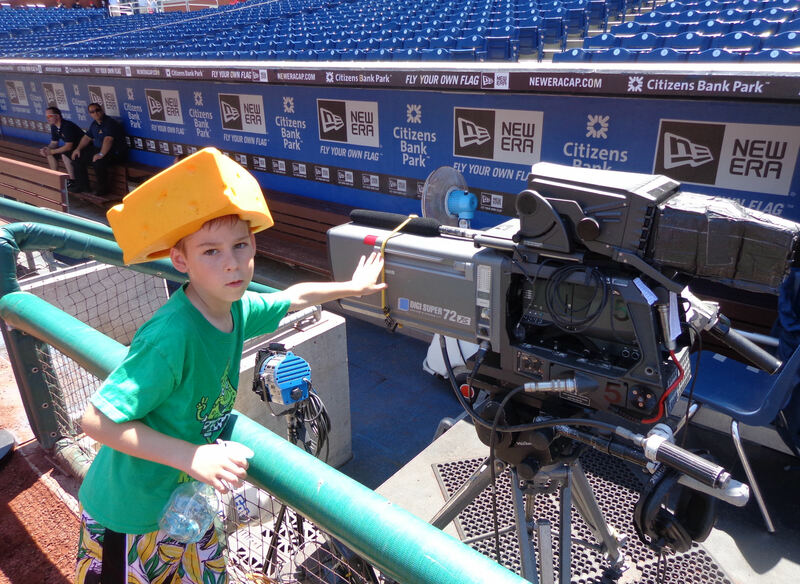 Check out his sweet shirt in that photo – “Cheesehead Cowpants.” I got him that gem while on a different business trip to Milwaukee…actually, to Racine, Wisc. Pairing the Cheesehead Cowpants shirt with Tim’s banana shorts is one of my favorite non-Mariners gameday outfits. It’s pretty hilarious, no? 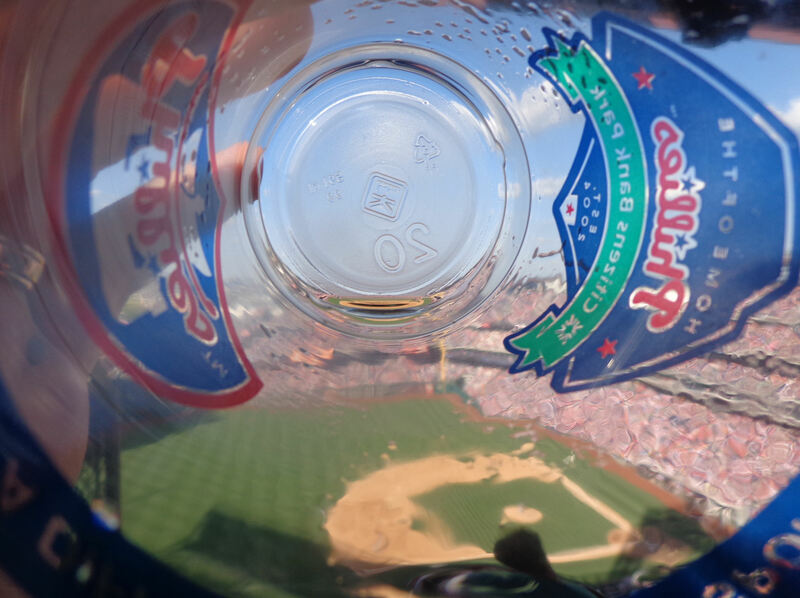 …so we could see the players-point-of-view when we’re usually looking down at them from the pizza wedge. 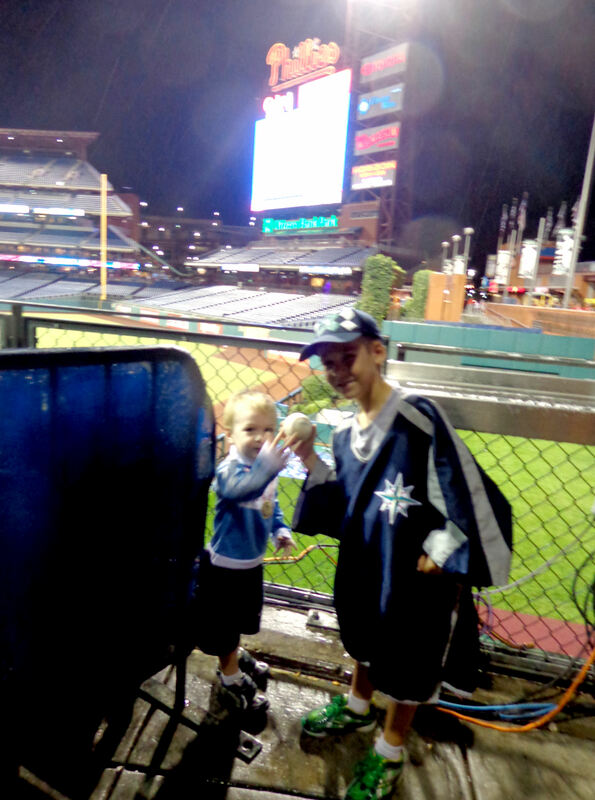 …we said hi to him and he handed us a spare baseball, he had two in his glove and he took the other back to the dugout with him. 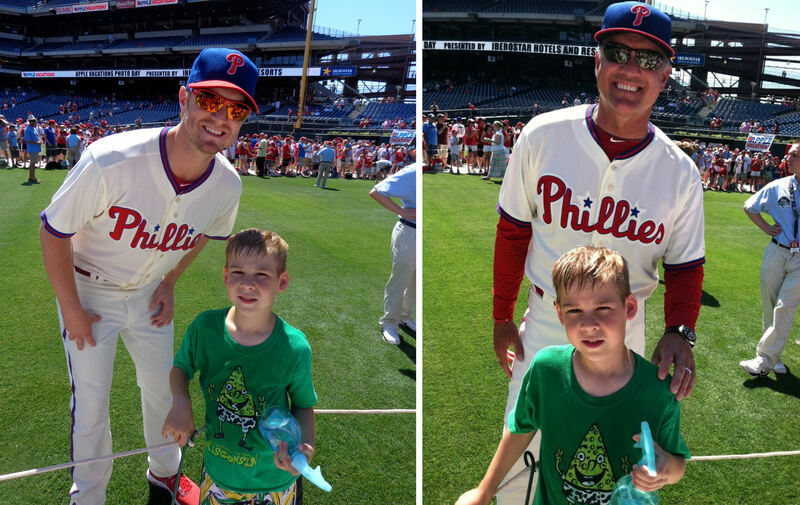 Finally, Phillies players started making the rounds. The “rule” was you weren’t supposed to get individual posed pictures with the players, you know, because they didn’t have time to pose for a picture with everyone. I think that’s always the rule at all of the ballparks. 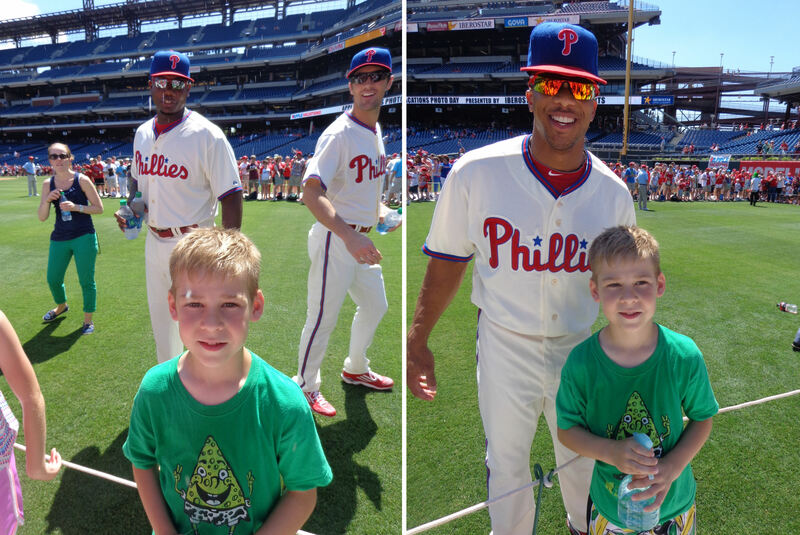 Anyway, some of the Phils just walked around saying hi and shaking hands. 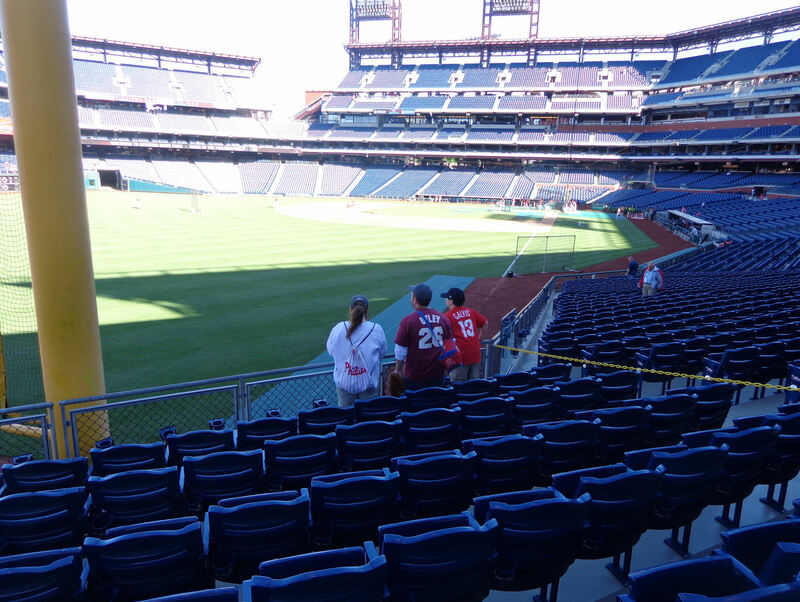 Some walked a bit and then randomly stopped to take a photo with one or two fans (Chase Utley). Others posed for photos with every single fan who wanted a picture. That’s how it oughta be! 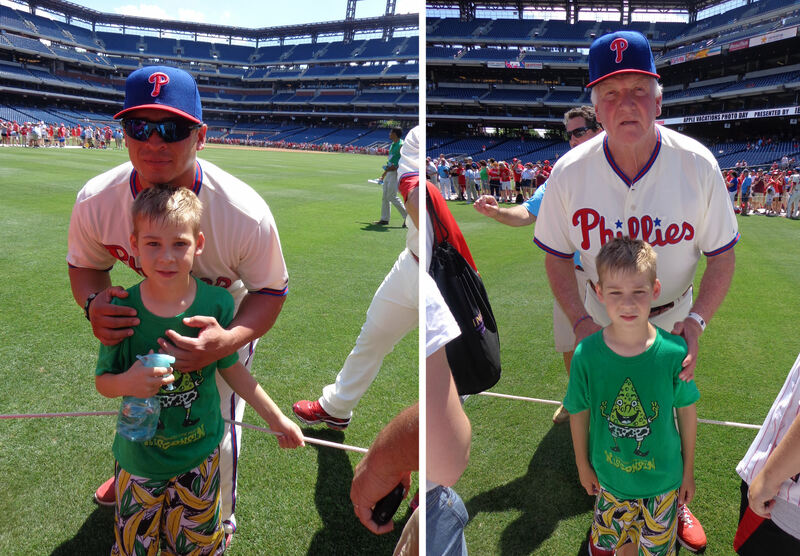 …or Charlie Manuel. If you ask me, both Charlie and Tim have hilarious faces in that picture, and eerily similar at that. If you couldn’t tell, we were out on a walkway in LF when we ran into Charlie. We stayed out there most of the time and we kept going back because it was less crowded than the warning track. 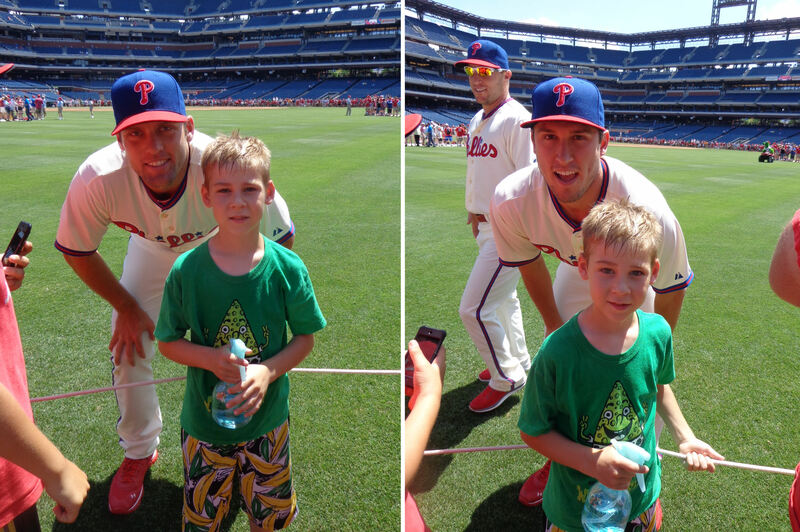 After DeFratus posed for a picture with Tim, he remarked at what a good deal he and Tim had made. It was a pretty good deal too. Tim’s a lucky boy. 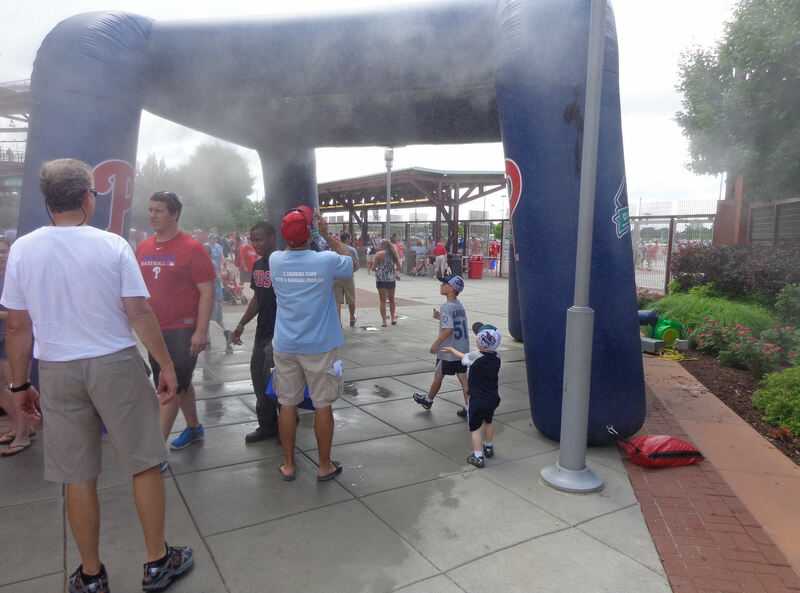 Not many people can say they’ve squirted a uniformed major leaguer in the face with a squirt bottle! 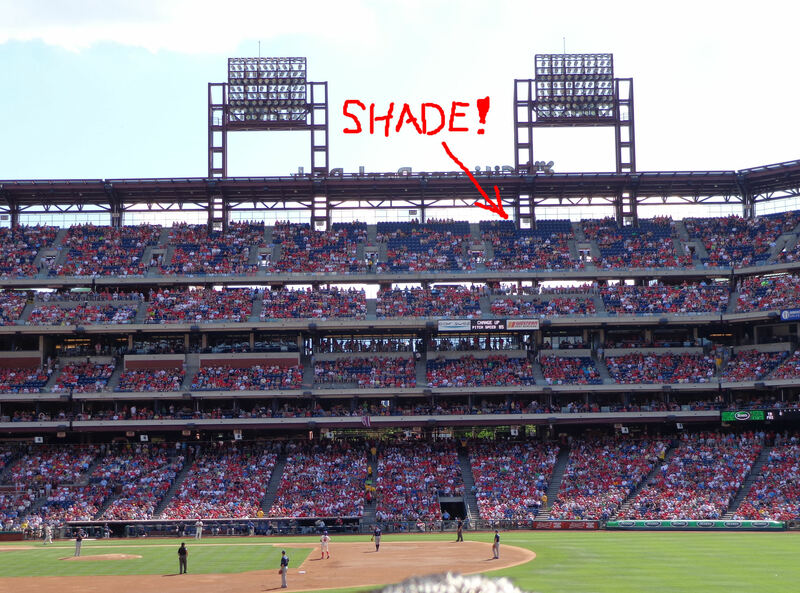 …and Ben Revere sported shiny glasses and one of the straightest bills in the league. 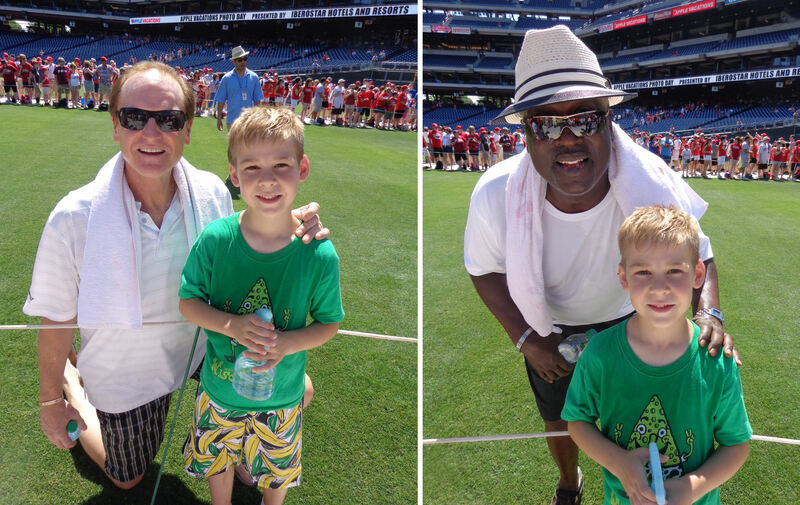 …and Gary “Sarge” Mathews, Sr. (who likes to wear fancy hats like Mariners announcer Dave Sims). L.A. was really very nice. 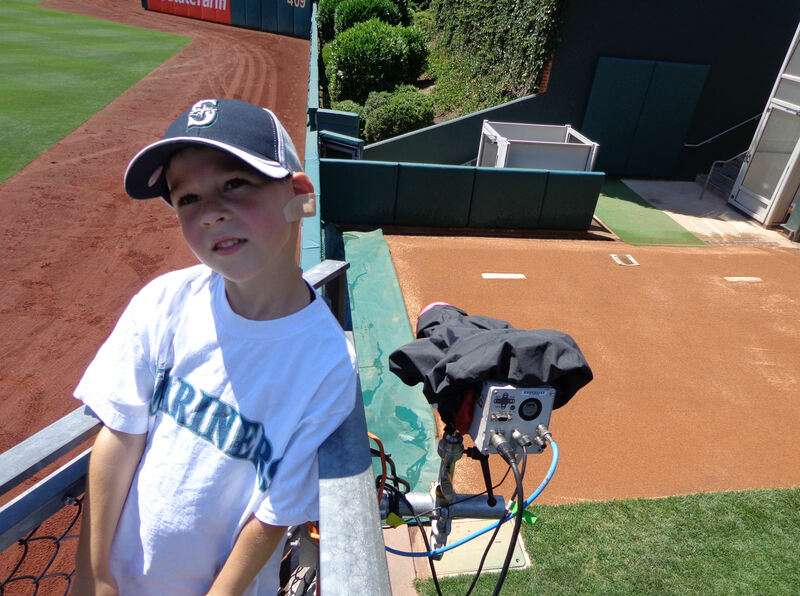 He chatted with us a minute or two about the Mariners and the beautiful Kingdome. Sarge claimed that he was wearing hats before Dave Sims. On twitter, Dave later told me he and Sarge both started wearing hats in 2007. …and Spokane, WA’s Ryne “HOF” Sandberg. I asked Kendrick how his family was enjoying the detour around the collapsed bridge in his home town. Not surprisingly, they were not big fans of it. …who totally remembered it when I mentioned the softball game to him. Next to Stutes and Tim, that’s Tim “Spray Man” Cook and 2007 N.L. MVP Jimmy Rollins. Rollins was riding around on that utility truck behind him in the photo. He would ride a little bit and then hop up for a few pictures. 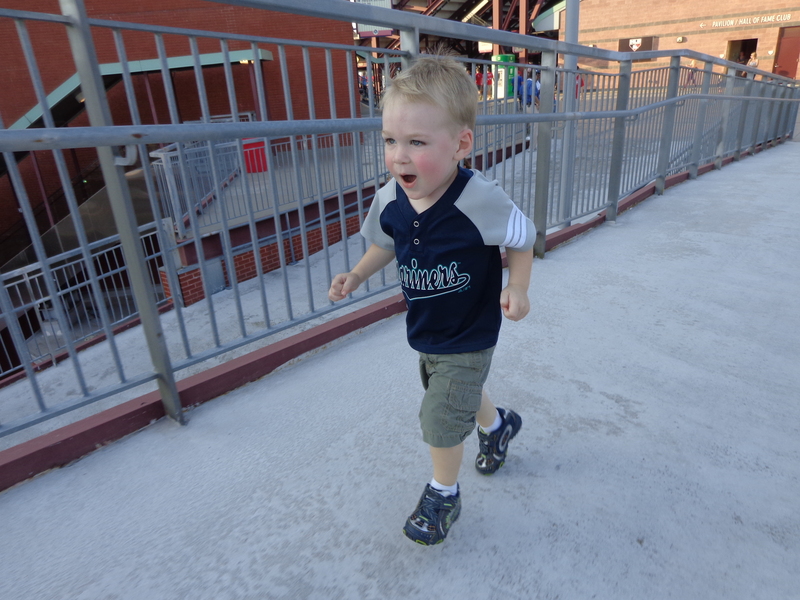 We had to chase him all the way down one of the runways before filing meeting up with him on the warning track. 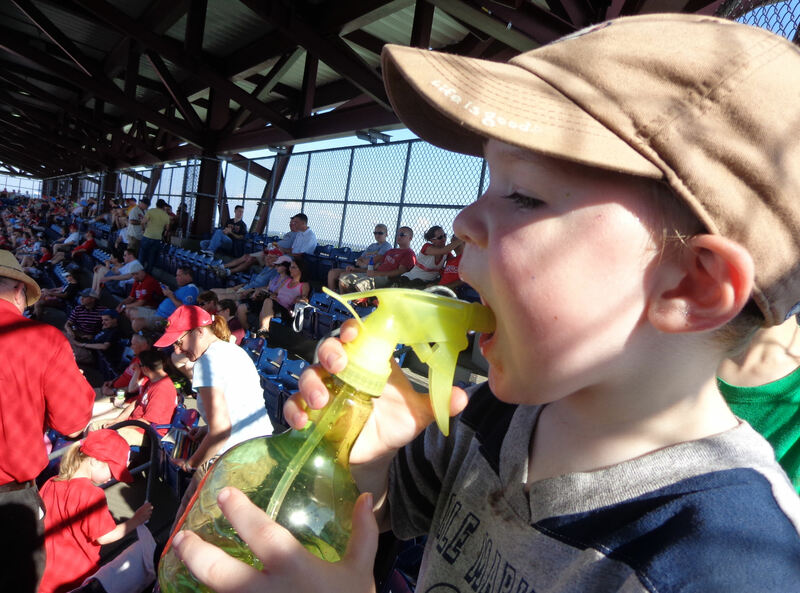 When he saw Tim, he said, “Come on, Spray Man!” and then he squirted Tim three times in the face while I took this photo. Great memory! Ice cream in the shady on a hot day is good stuff. I asked Jesus if he was out on the field for the photo session, but he said he was not. That’s too bad. It would have been great to get a photo with him. 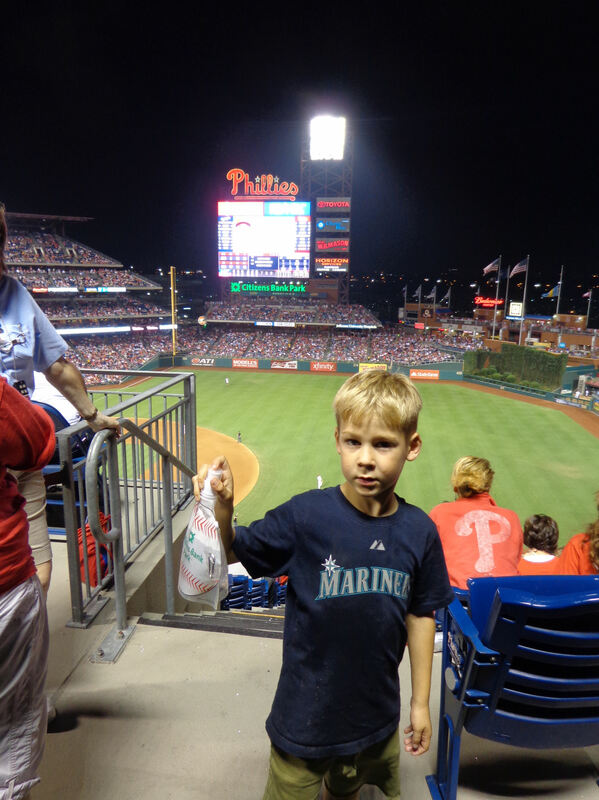 …was spending his vacation in Philadelphia, and apparently roots for the Phils. 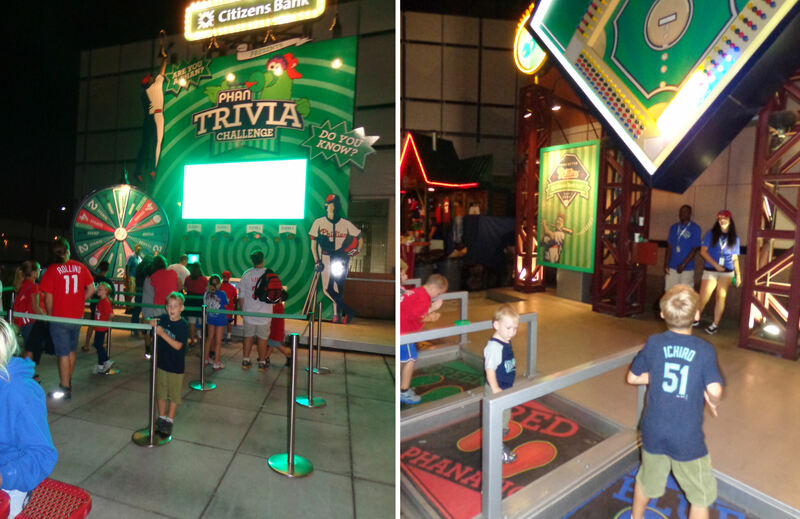 …the exact number you need to win one of these Citizens Bank Park mini-bats. When the guy realized I had two boys, he through in an extra bonus bat! 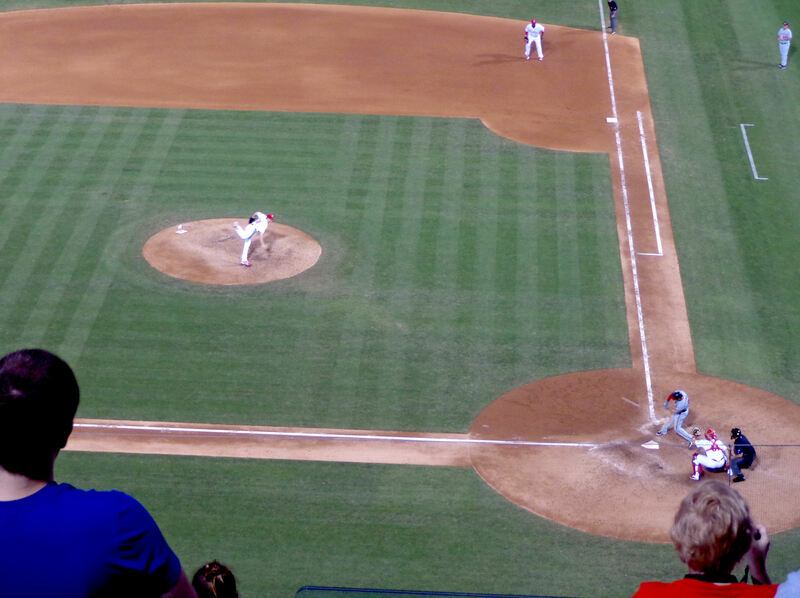 …to fly out to Ben Revere in CF to end the top of the first with no score. …riding his ATV down the switch back ramp. 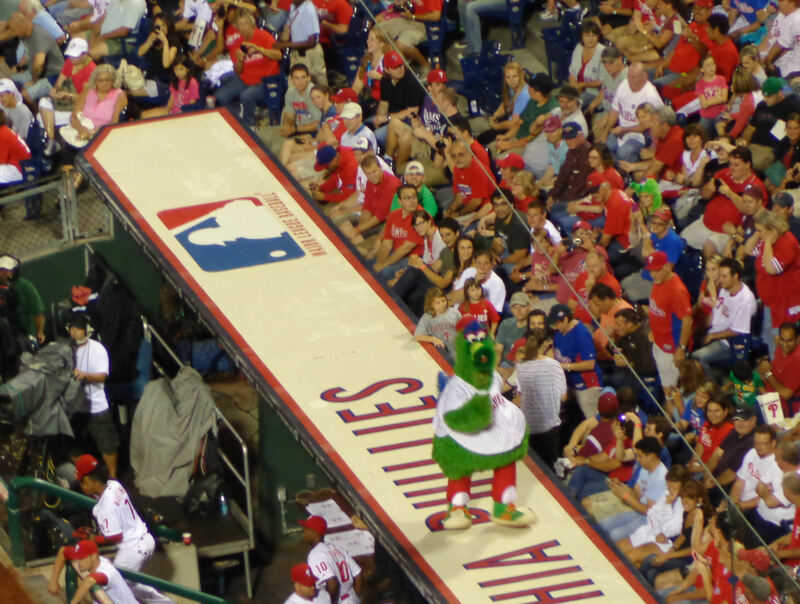 That was kind of amazing because we never see the Phanatic out and about in the stadium. He’s usually just on the field or on top of the dugouts at the end of the game. 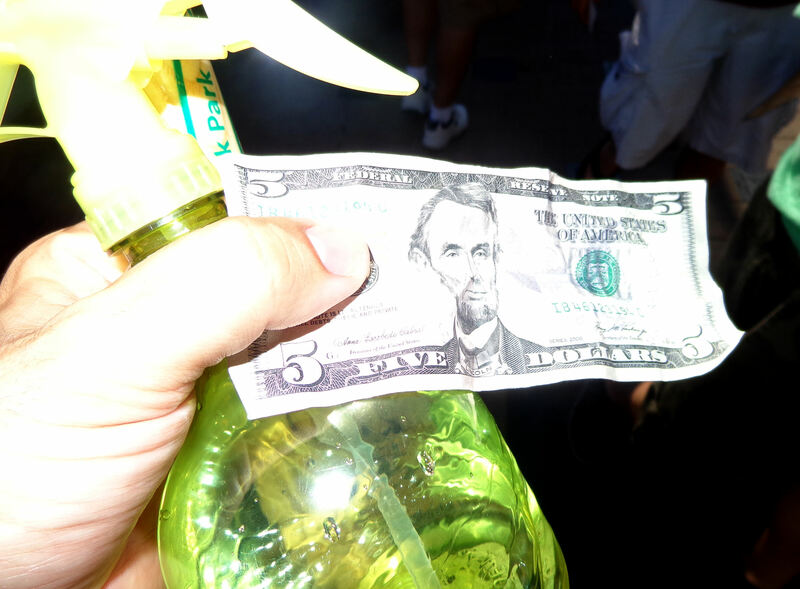 Speaking of food, after buying our hot dogs, I found another $5 bill on the ground! 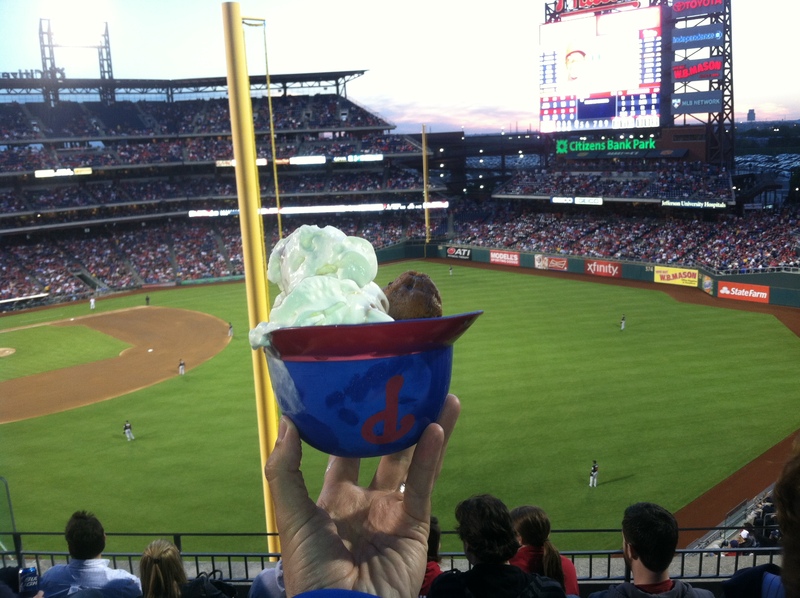 That raised the my found-money-at-a-ballpark grand total up to $30, all at Citizens Bank Park. So, by the way, there was some scoring by this point that I haven’t mentioned. In the top of the second inning, the Brewers scored two runs on a single to RF and a throwing error by Delmon Young. That made it 2-0 Brewers. 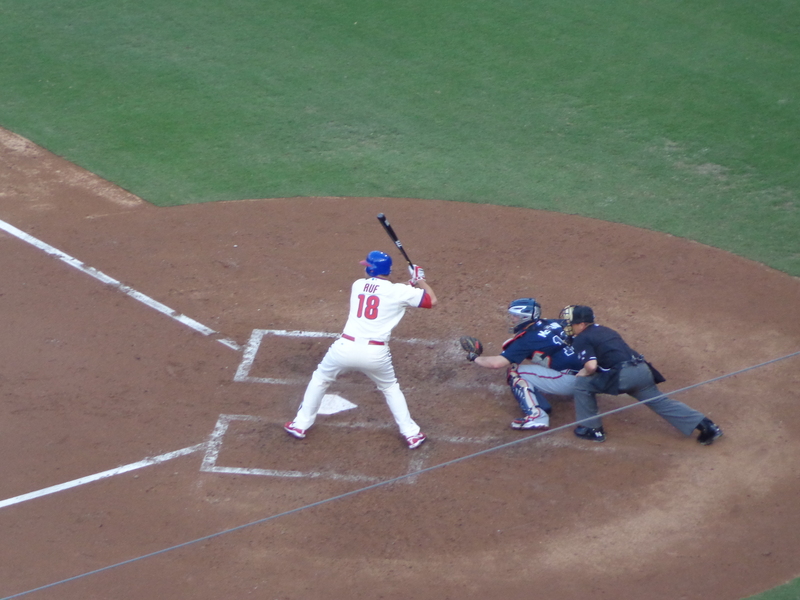 In the bottom of the fourth, the Phillies got on the board when Brewers’ second baseman Jeff Bianchi couldn’t handle a bases loaded knock by Kevin Frandsen. The Brewers got out of the jam without giving up any more runs. 2-1 Brewers after four. The Brewers got that run back pretty quick. 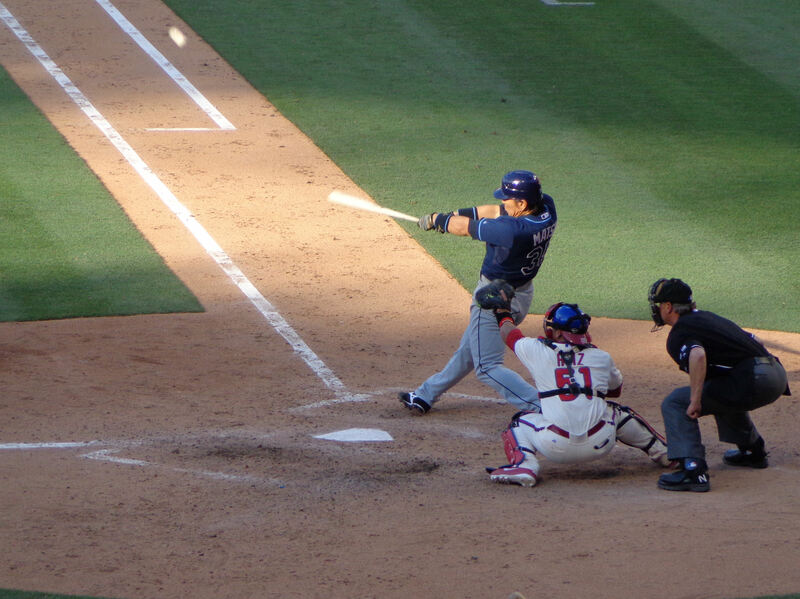 In the top of the fifth, Aoki hit a single followed by a triple by Jean Segura. 3-1 Brewers after five innings. 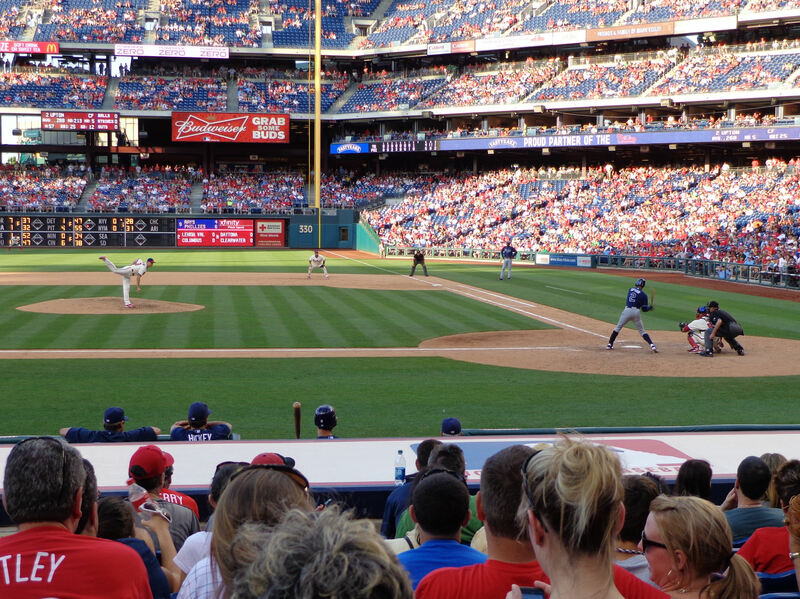 The Phils got one more run in the bottom of the sixth on a single by Erik Kratz. Back to a 1-run game, 3-2 Brewers after six. 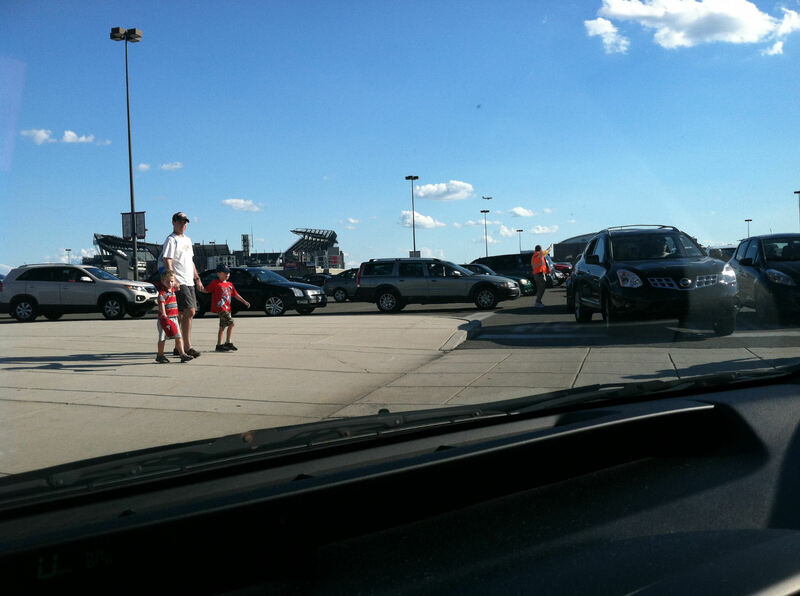 That’s the Lincoln Financial Field parking lot. I’m not sure when they put in the covered parking. I’d never noticed it before…but then again, we never park over there. …of the stairs. I love how there is one solitary row right about the tunnel. That’s be a sweet place to sit someday. Visiting the kids’ play area turned out not to be a great idea. 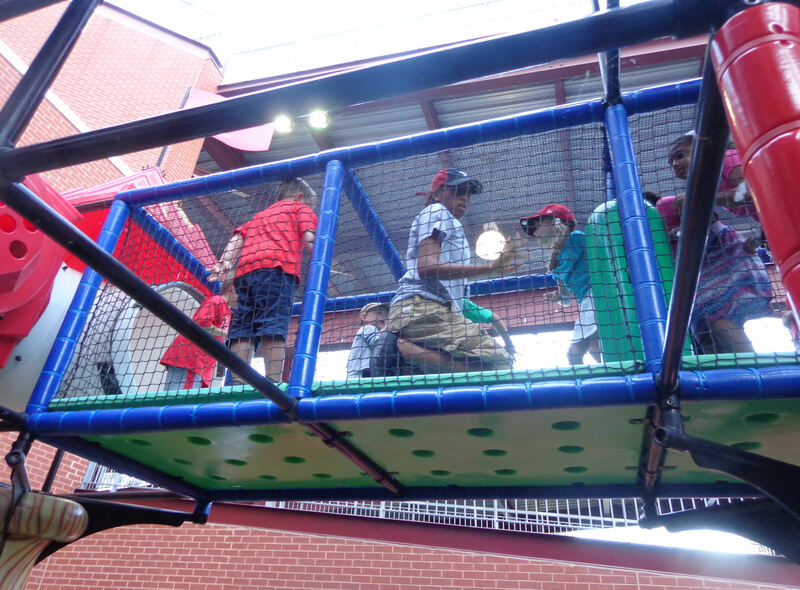 The kids’ play area is pretty big and parents can only see one side of it at a time from the area below. The kids went up to play and I sat on the ground in front of the play area taking some notes in my notebook and putting baseballs in baggies. 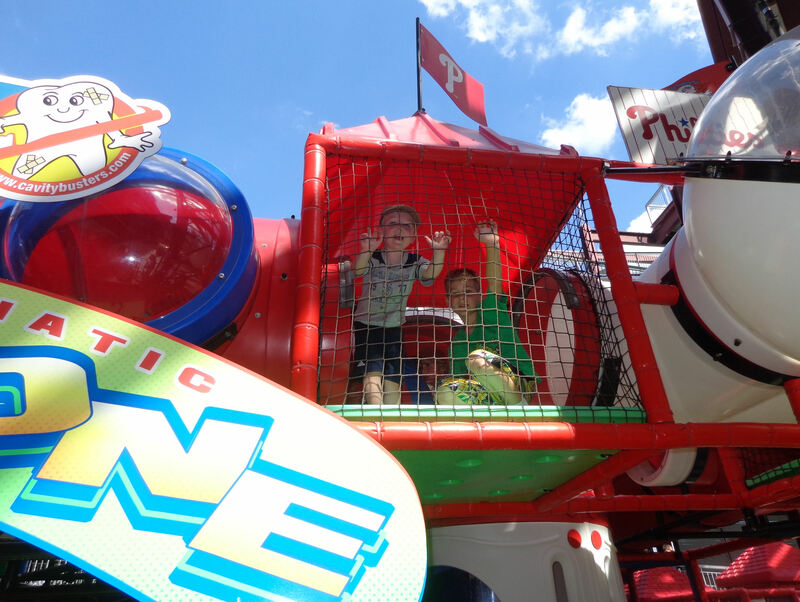 Tim and Kellan came running by a couple times after going down the big twisty slide. Actually, this wasn’t right when I got there. There is a steering wheel type toy up there. When Kellan tried to play with it, a kid a little shorter than Kellan with a mohawk started hitting Kellan and pushing him into the walls (I missed all of that). He apparently also bit Kellan’s finger (I also missed that). 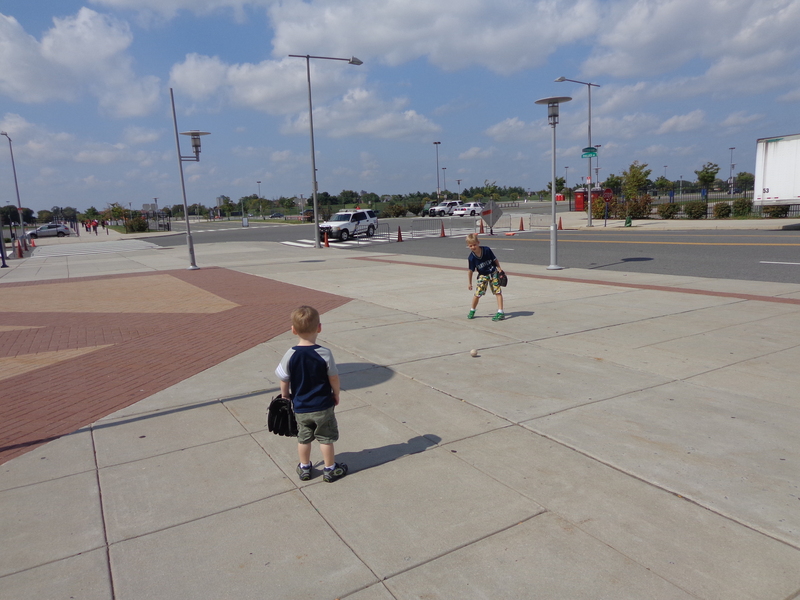 When I found Kellan, Tim was trying to push Kellan and the other kid apart. Kellan was screaming and crying. The mohawk kid ran off to the right. I had no clue what was going on at this point. I just knew that Kellan was going ballistic crying. 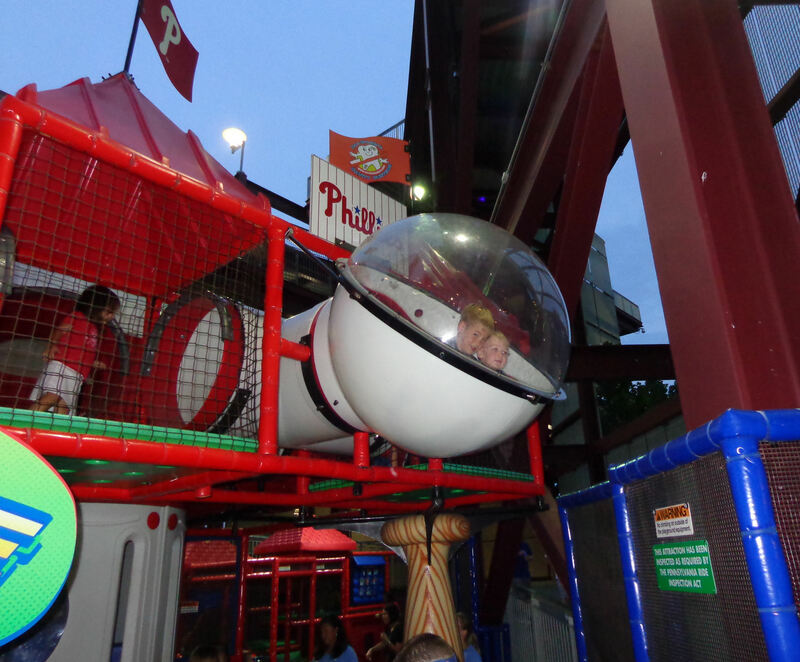 I asked a Phillies employee (the lady shown in the picture above) if I could go up and get him because he wouldn’t come down. She said parents couldn’t go up after kids. A minute later, I saw her up there. I still had no clue what was happening – if Kellan and that kid were just fighting (i.e., both being bad) or what. Then I saw that lady up there. My first thought was that she was going to kick Kellan out for fighting with that kid. But she was up there to find the kid with the Mohawk. The other kids told her where he went in the play area and she went and kicked him out of there. She then came back to see if Kellan was okay. While she was away, two moms came up to me and told me what happened with the kid with the mohawk. They were both super mad and they mentioned that the mohawk kid’s dad was standing below laughing as he tussled with Kellan. One said that she wanted to run up there and kick that kid out herself. Anyway, I was calling up to Kellan and asking him to come down. He was just standing up there crying and wouldn’t move. That lady up there couldn’t really get him to move, but she point out to me that he could walk to the right and take the slide down. I finally got him to walk over there and slide down to me. He was still crying and screaming when he reached me. I picked him up and popped him onto my shoulders and the three of us got out of there right away. 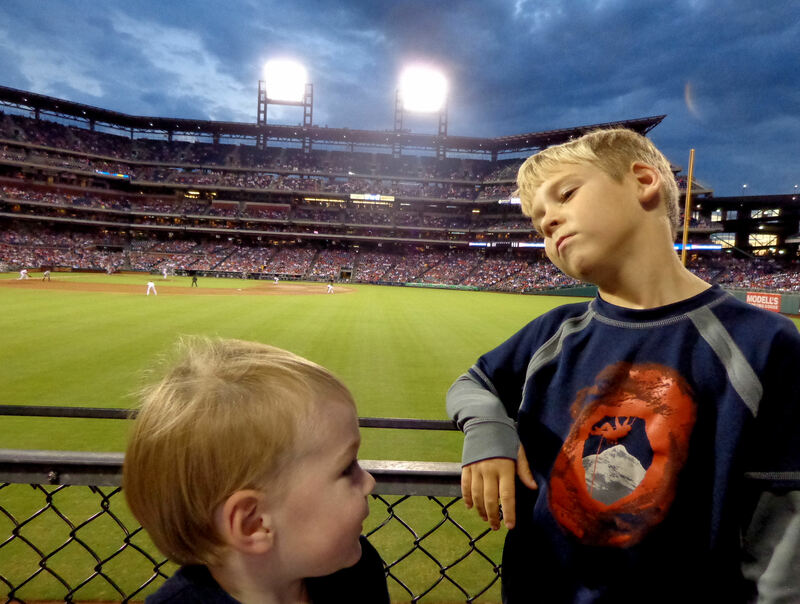 As we walked toward home plate through the concourse, Tim told me all about what happened up in the play area and Kellan instantly fell asleep (it was a tiring altercation with the little mohawk kid). We had a goal of getting some mathematical photos for the MyGameBalls.com photo scavenger hunt, we headed to the RF foul corner, but we were too far away. So we headed to the SRO area behind the Brewers dugout. 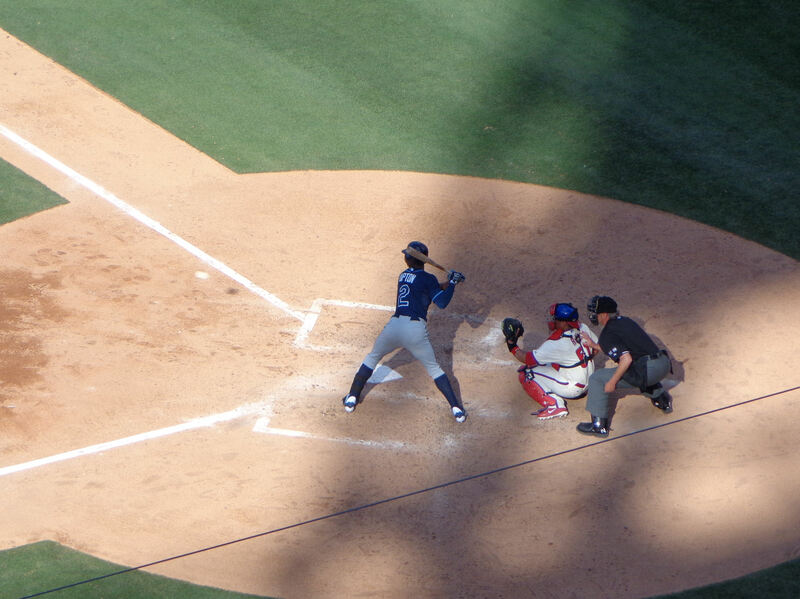 In the top of the eighth inning, Jonathan Lucroy hit a solo homerun that put the Brewers up 4-2. 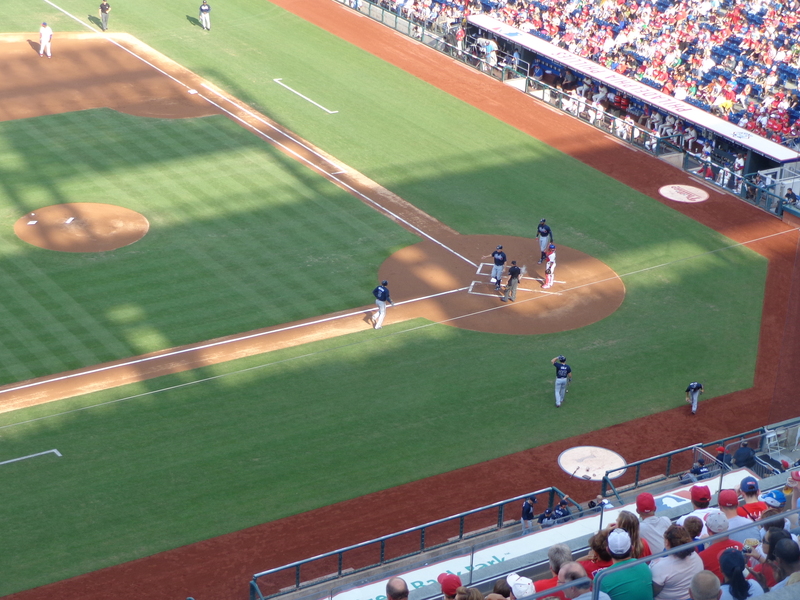 Jimmy Rollins followed with a pinch hit single. Interestingly, Kyle Kendrick pinch ran for Rollins. 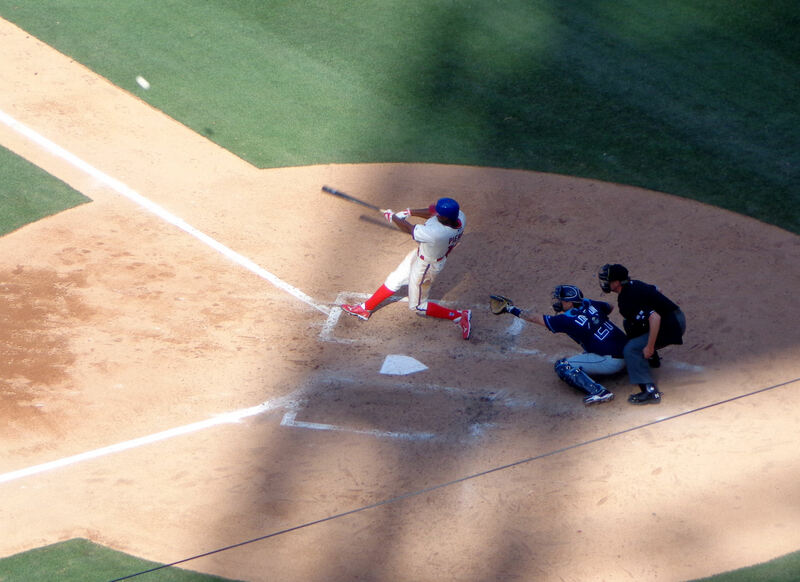 Ben Revere sacrifice bunted Kendrick to second. Cesar Hernandez followed Revere. 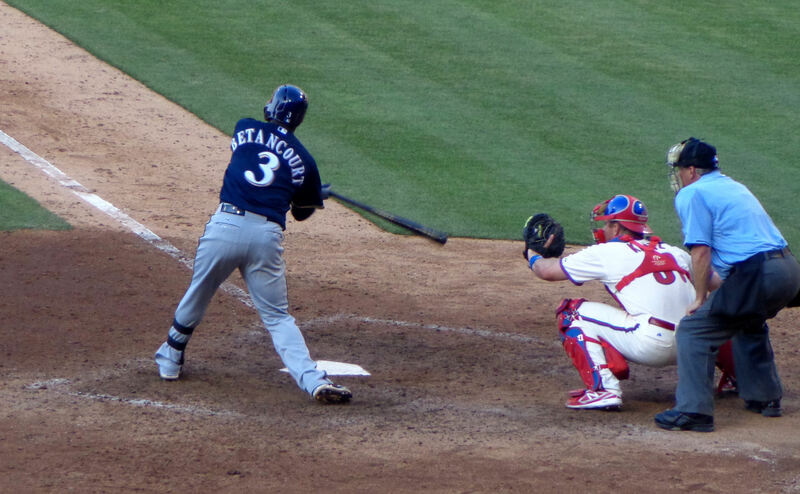 During his at bat, the Brewers picked Kendrick off second base for the second out of the inning. And, wouldn’t you know it, Hernandez then hit a double off the RCF wall. Had Kendrick not been picked off, Hernandez’s double would have tied the game. With a one run lead still intact, Francisco “K-Rod” Rodriguez intentionally walked Dominic Brown and then got Michael Martinez to ground out to end the game. Following the final out, it was super easy to get into the corner spot at the home plate end of the Brewers dugout. We got home plate umpire Tom Hallion’s attention and he bounce-passed a baseball to Tim off of the top of the dugout. 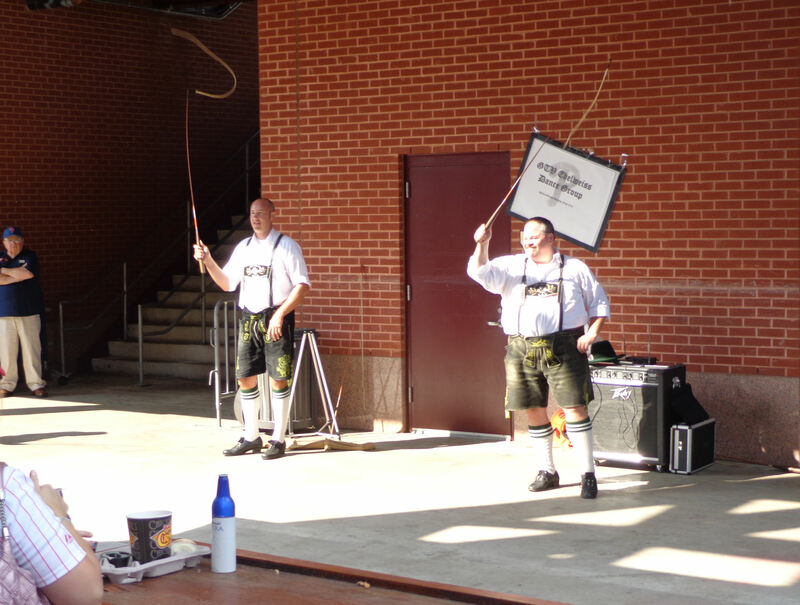 …before heading to the gates. 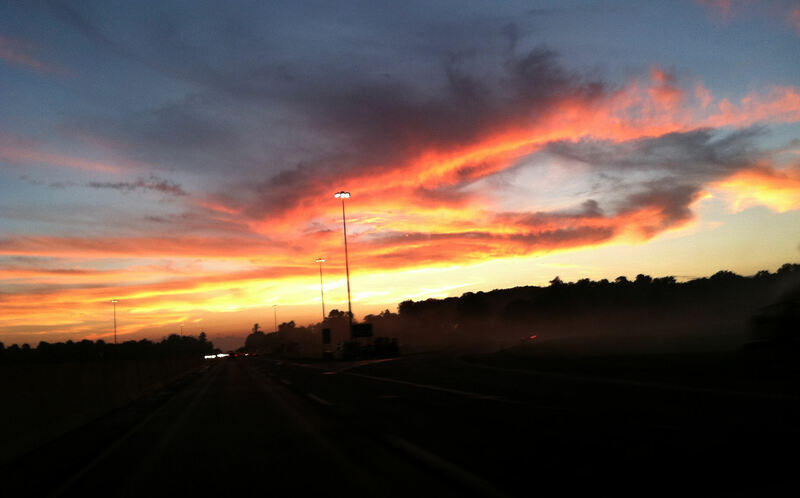 …in the parking lot for half an hour before hopping in the car or the ride home. 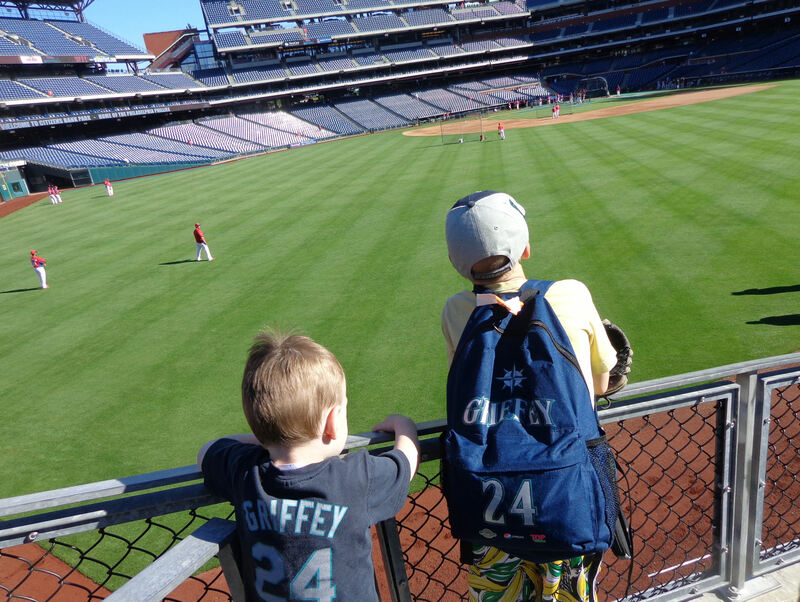 It was another great day at the ballpark! 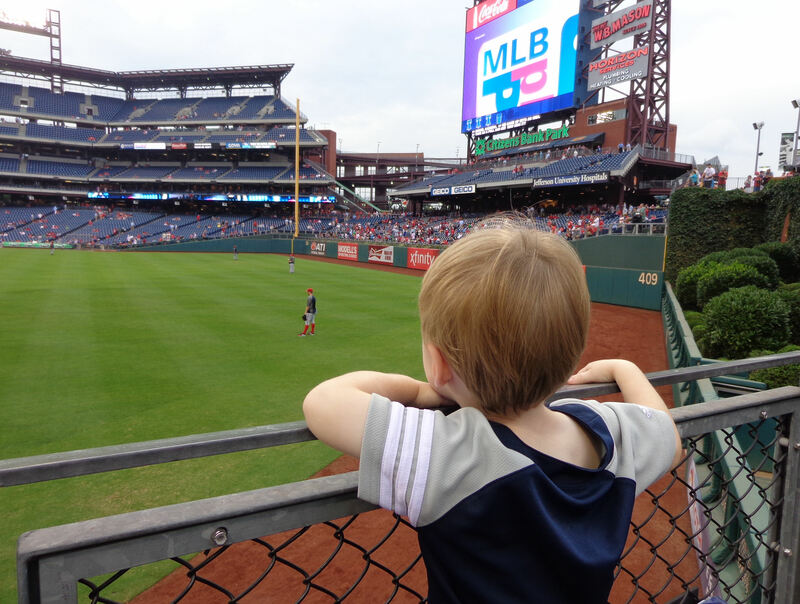 After reading Harrison’s tweet, I asked my wife, “Should the boys and I go to the Phillies game today?” “Sure,” she replied. …, so we circled around to the 1B side, picked up our tickets at the 1B will call box, and ended up running around the entire stadium. …, which is now on display on one of Tim’s baseball shelves. 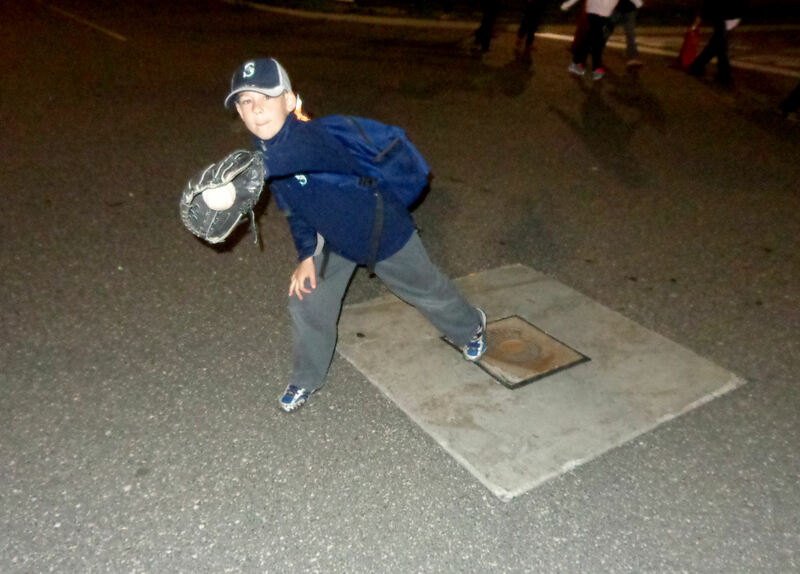 …, Bernie set a baseball in Tim’s glove. 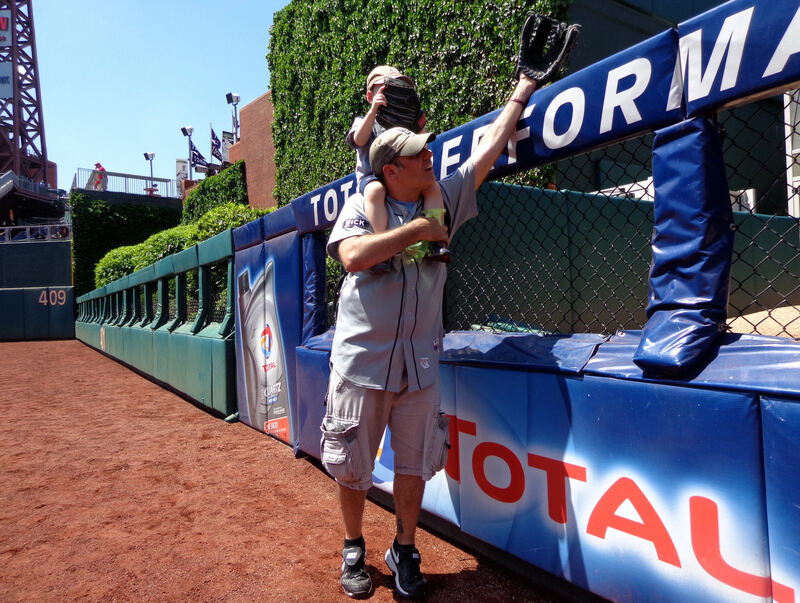 Tim reached for it with his glove, but it was too far to reach. I reached down for it but Tim wanted to grab it on his own. Tim ended up hopping into the flower bed to grab the ball. Sometimes when we’re up front in this section, homeruns or long fouls get hit into the back of this section. So I figured we’d wait a bit and see if one would come out way. When the rest of the stadium opened, we headed down into the pizza wedge. 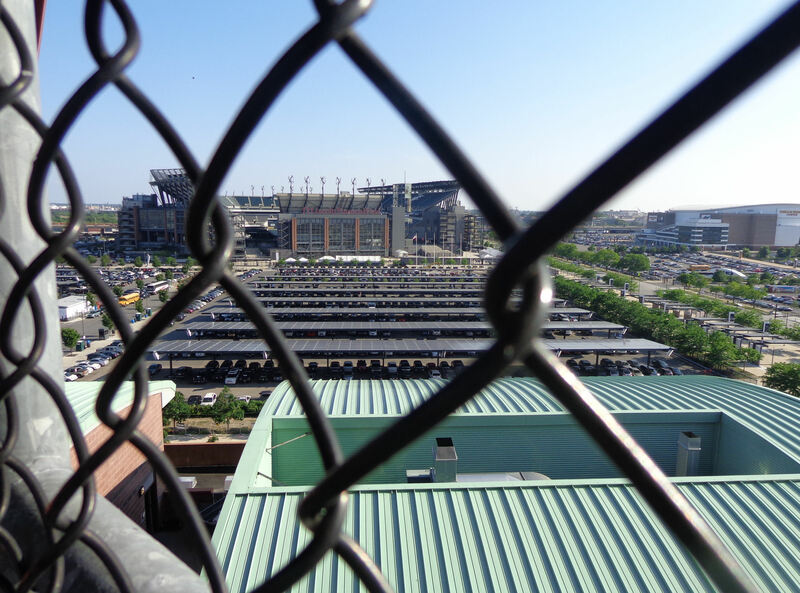 When we got down there, there was a stray baseball at the back of the Phillies bullpen and two groundskeepers working on the mound. 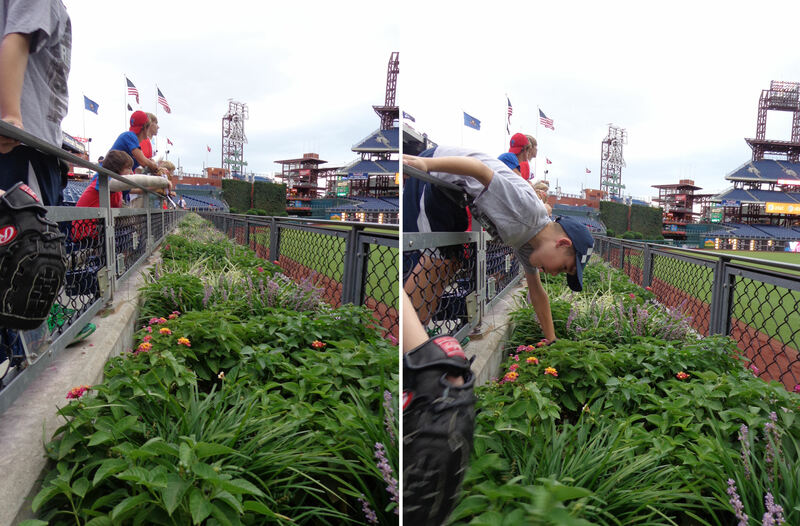 In all of my experience at Citizens Bank Park, I’ve seen the two guys who chalk the foul lines give away some stray balls, but all other groundskeepers have said they were not allowed to give away baseball. Knowing these guys almost certainly couldn’t, I pointed out the stray baseball and asked the groundskeepers if they could toss it up. They were not allowed to, one of them responded. And then they headed out into CF, walked the warning track toward the RF corner, and exited the field through the tunnel under the concourse. 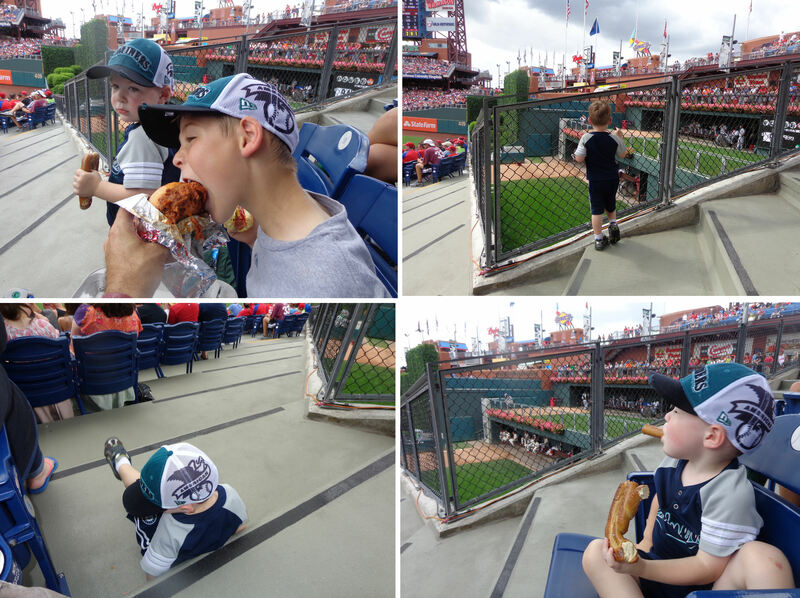 A few minutes later, the same groundskeeper who had said he couldn’t toss up the baseball appeared above the RF seats, walked down the stairs into the pizza wedge, and handed a totally different baseball to Kellan. 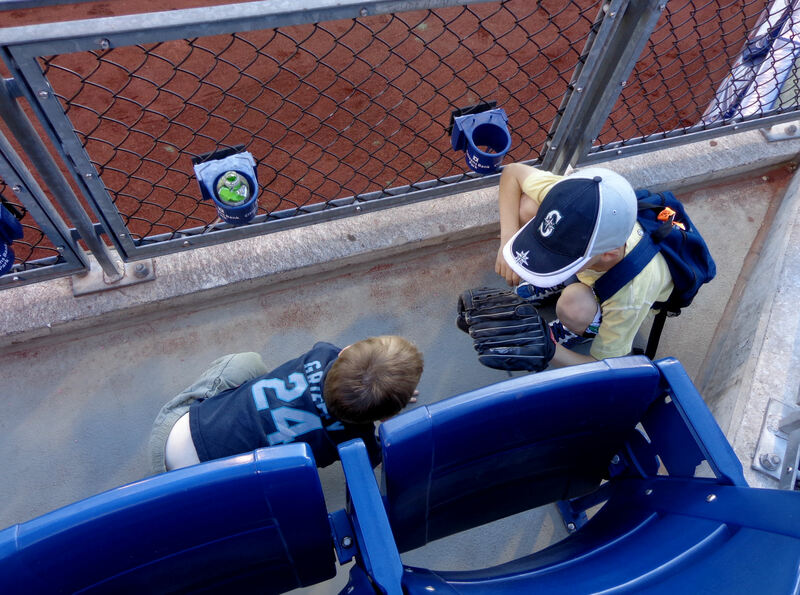 He apologized for not being able to toss the baseball from the bullpen up to us. It was pretty funny. …but it sailed high over Tim’s head so I had to catch it for him. 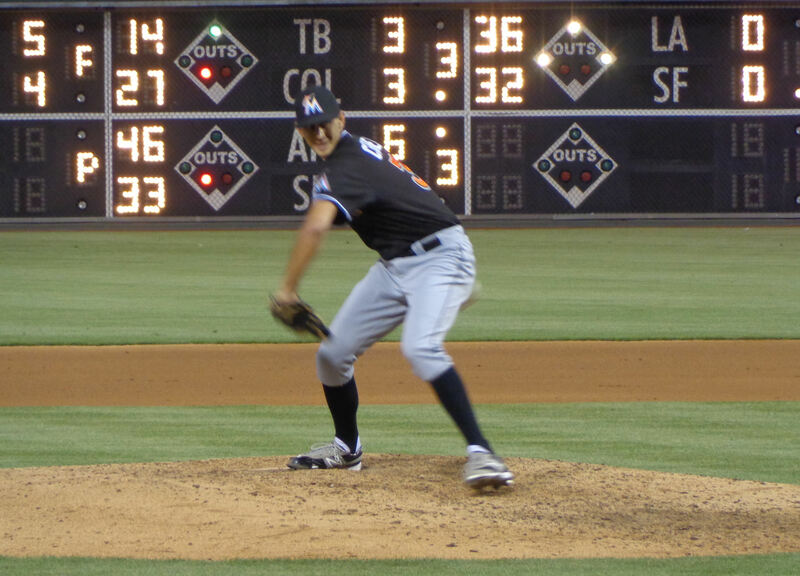 …when we made the bend toward CF a Marlins batter took a mighty hack and sent a fly ball in our direction. I stopped mid-row and watched the balls flight. It was right in line with us, but seemed like it wasn’t quite going to make it to us. But it kept carrying. 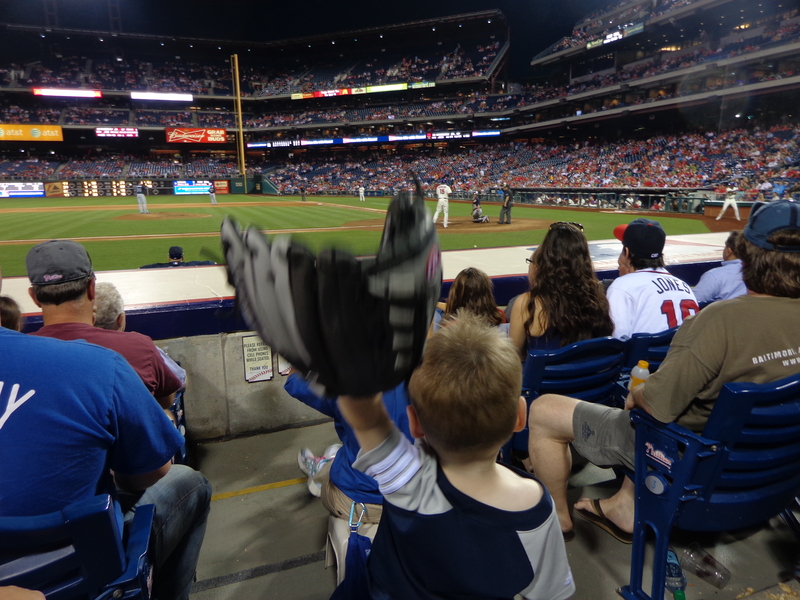 With Kellan still on my shoulders, I leaned forward over the row of seats in front of us and reached and made a back-handed catch on the fly. 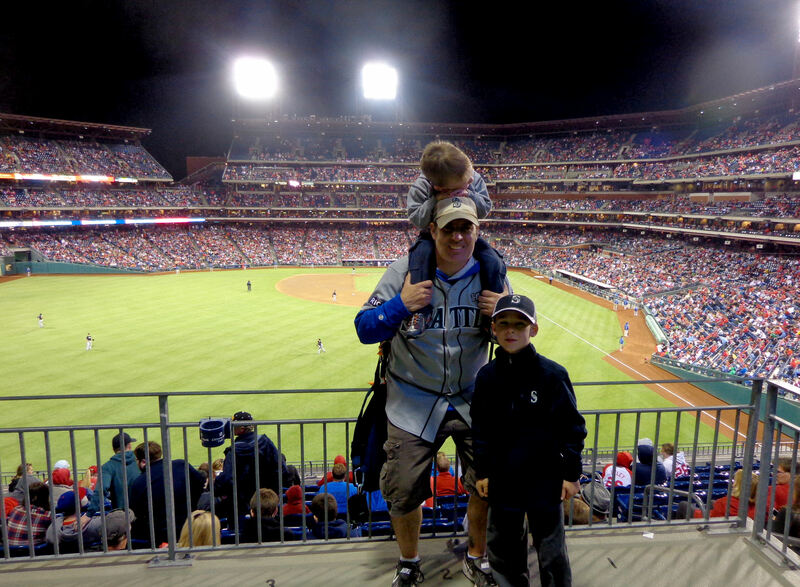 It was the first time I’d ever caught a batted ball on the fly with one of the boys on my shoulders and it was pretty darn cool. 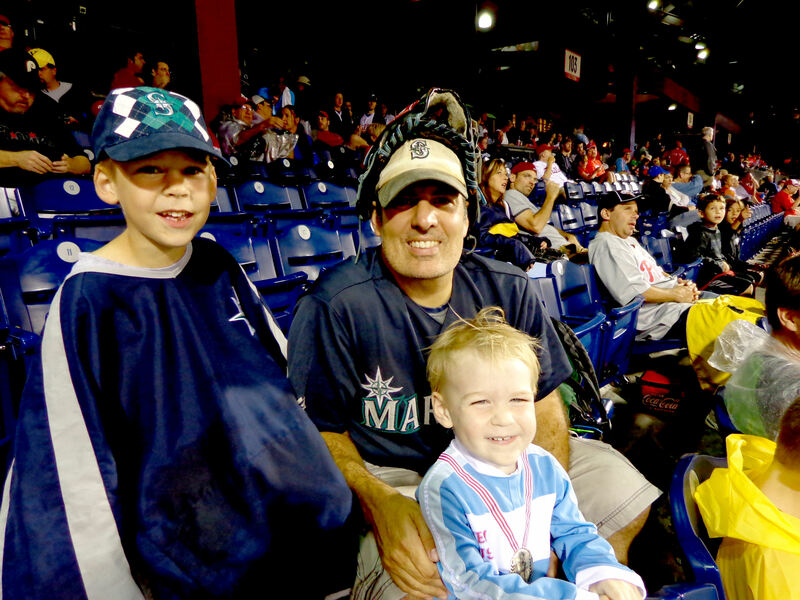 [Note: I have caught a BP homer on the fly while holding Kellan with my right arm…so has my dad.]. BP ended way early because it was Little League day and a whole bunch of Little Leaguers got to march around the ballpark on the warning track. As we watched, Tim said he wanted to go find Harrison, but I assured him that Harrison would turn up in the pizza wedge before too long. Meanwhile, former Mariner Miguel Olivo started stretching in CF. …and Dubee tossed it to us. 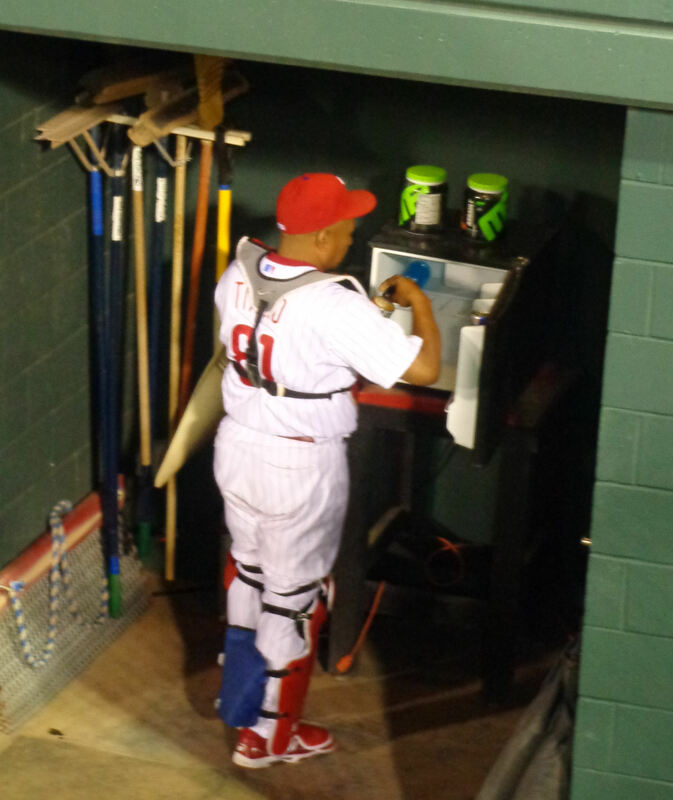 Soon, Phillies bullpen catcher Jesus Tiamo made his way to the bullpen. He too ended up grabbing a bunch of baseballs and tossing them into the crowd. He tossed one to Harrison, then another to me and Kellan, and then one to Tim. 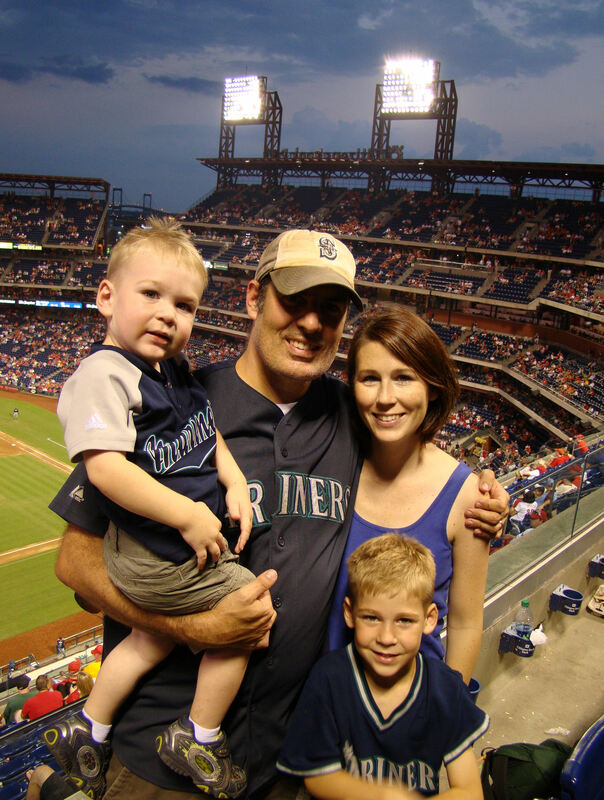 …because it was the 400 baseball that we’ve got at MLB games since Tim’s first game back on 9/12/2006. Jesus ended up signing it for us too! …warm up for a few minutes and then we parted ways with the Tishlers and headed off to find some dinner. The plan was hot dogs for dinner. But at the last minute, Kellan rejected the hot dog concept and opted to get a giant pretzel. …rocks, water and sludge, of course! Cole Hamels blanked the Marlins in the first (despite hitting a batter). 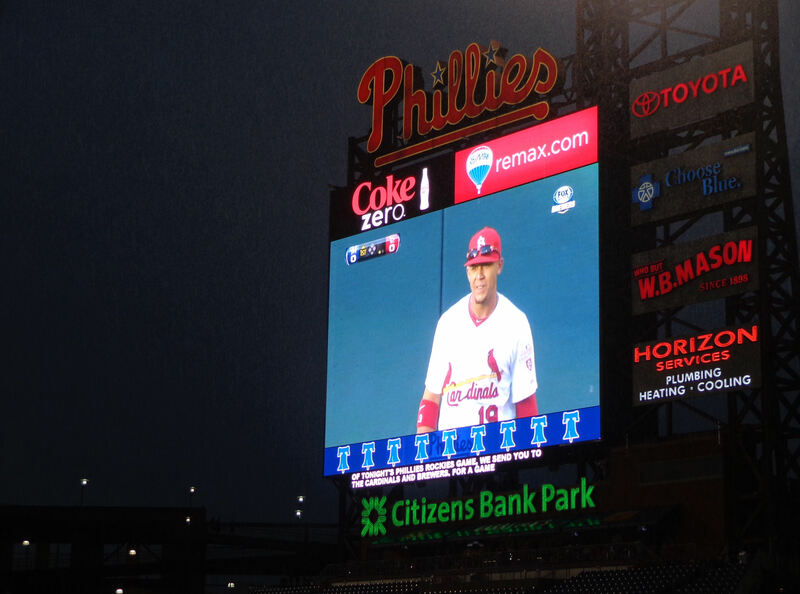 Freddy Galvis knocked a single in the Phils’ half of the first, but was left stranded on base. After Galvis’s first inning single, the Phillies would not collect another hit all night. And the Marlins only had four hits in them. The first three innings blew by in a blink of an eye. 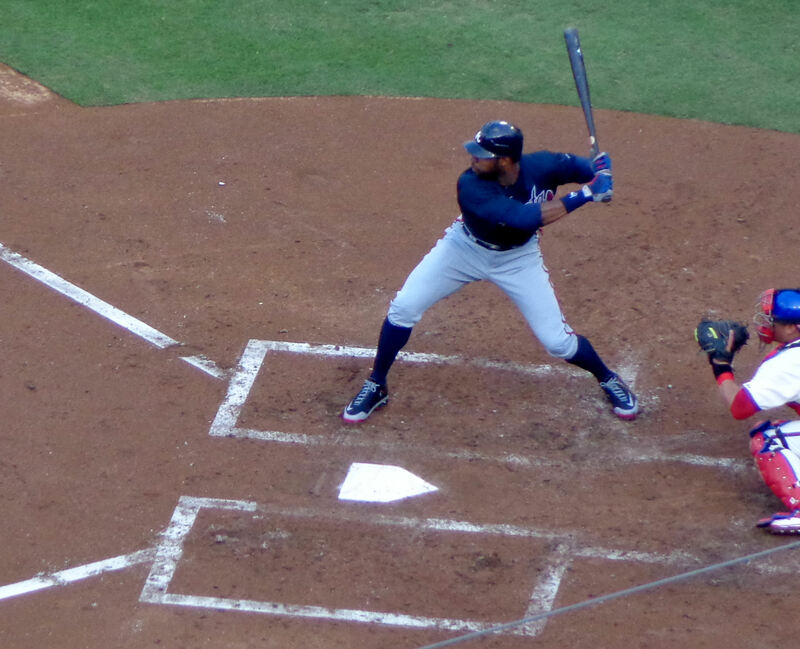 Marlins right fielder Marcell Ozuna knocked a solo homer in the top of the second and Chris Valaika followed with a solo blast of his own in the top of the third. 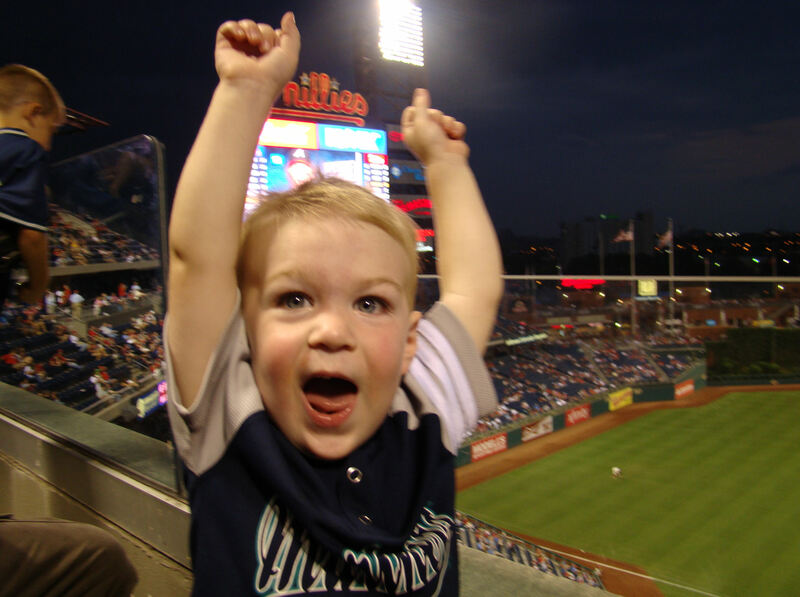 That made it 2-0 Marlins and we finally left the kids’ play area. 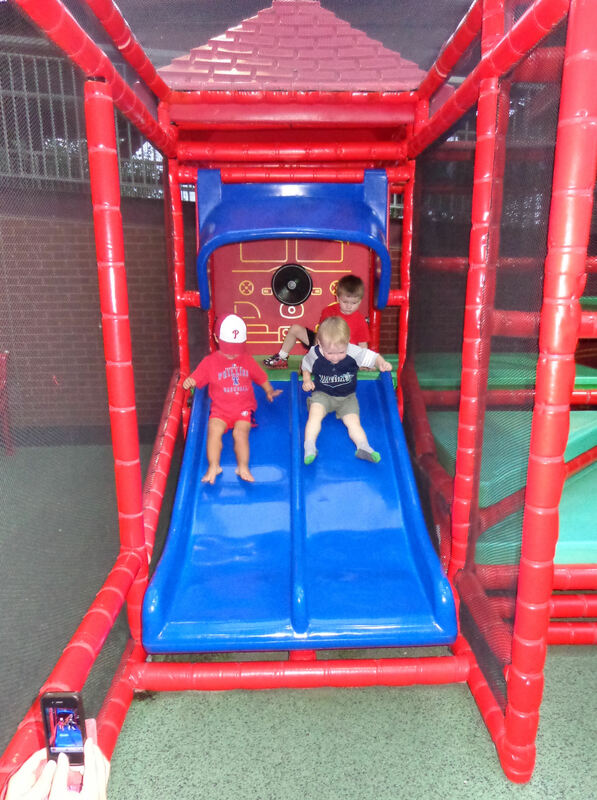 After devouring our ice cream, the boys wanted to keep on moving. We headed back to the kids’ play area. 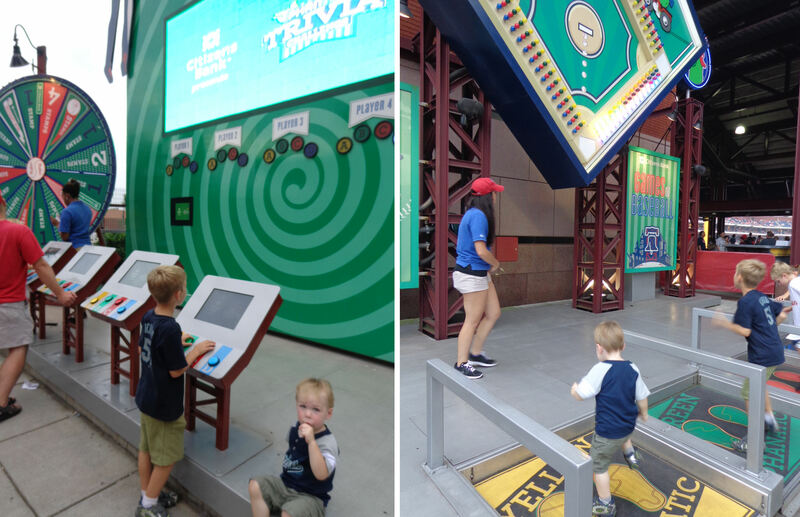 As the kids were playing, I was amazed to notice that it was only 8:30 and the game was already in the seventh inning! While the usher nearby cracked down on some fans standing in the wrong SRO spots. 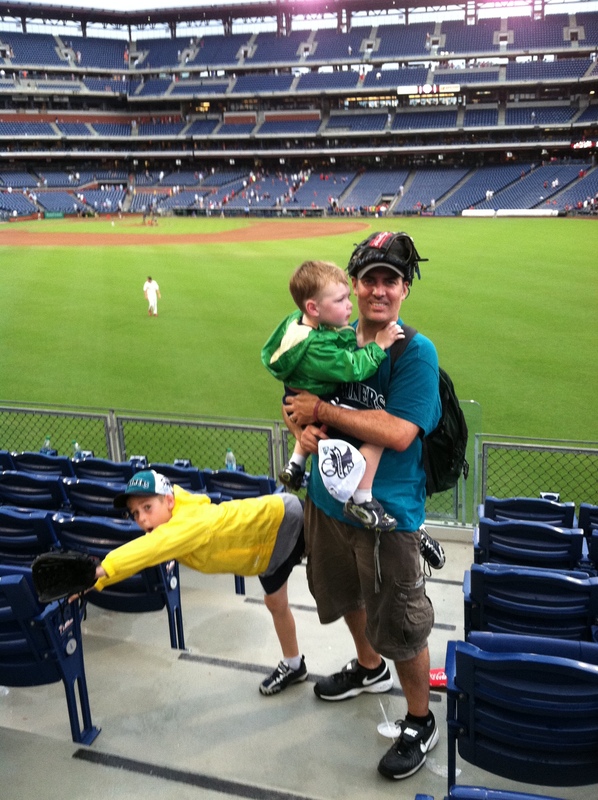 But, thankfully, he had no problem with Tim and Kellan playing fake baseball in the middle of the cross-aisle. …in the bottom of the ninth. But Kellan was tired and cranky and he didn’t want to sit down. Actually, he did want to sit down, but he wanted to sit on my shoulders, which couldn’t happen in the third row of the seats. So we took off. 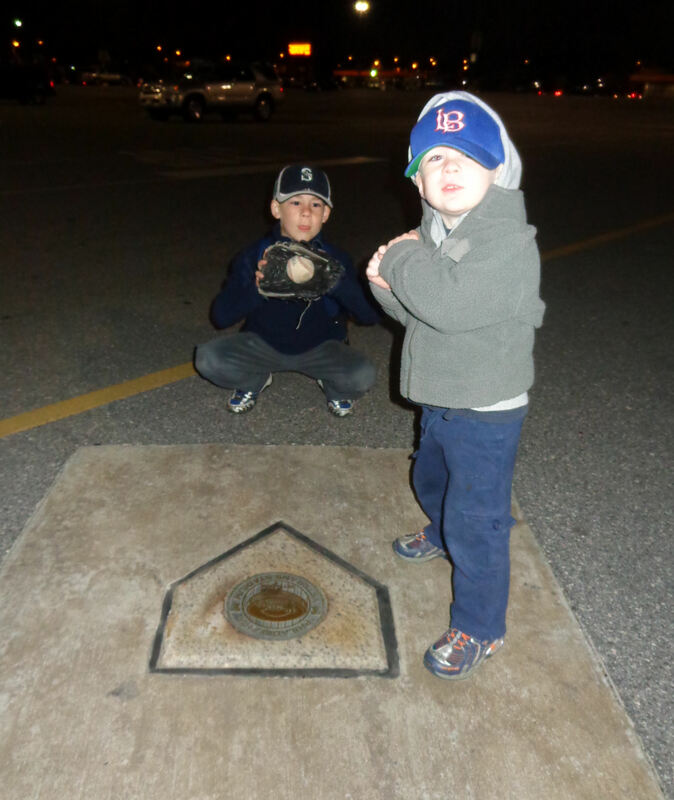 The Veterans Stadium home plate marker! That picture earned us some points in the MyGameBalls.com photo scavenger hunt. And there you go. 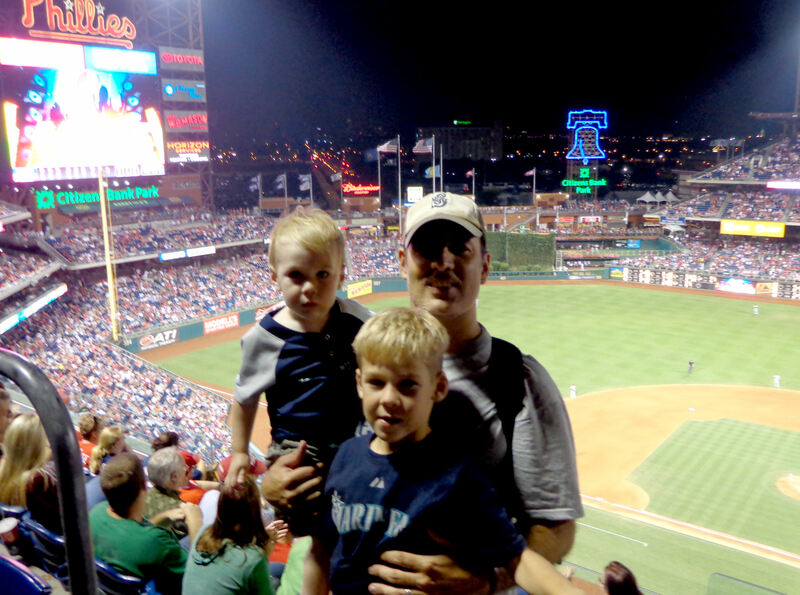 Another great game at Citizens Bank Park. 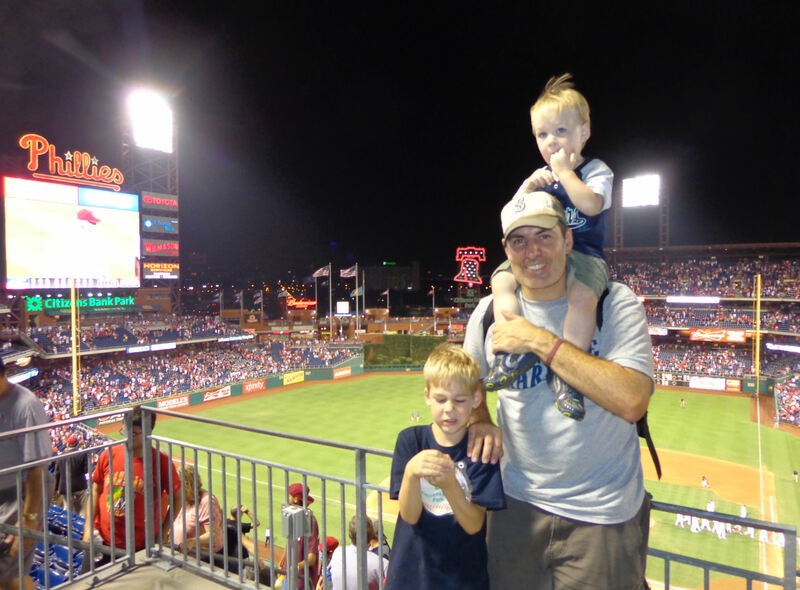 On September 22, 2012, the boys and I went to our fourth and final game of the season at Citizens Bank Park. And it was a special one because we weren’t alone. 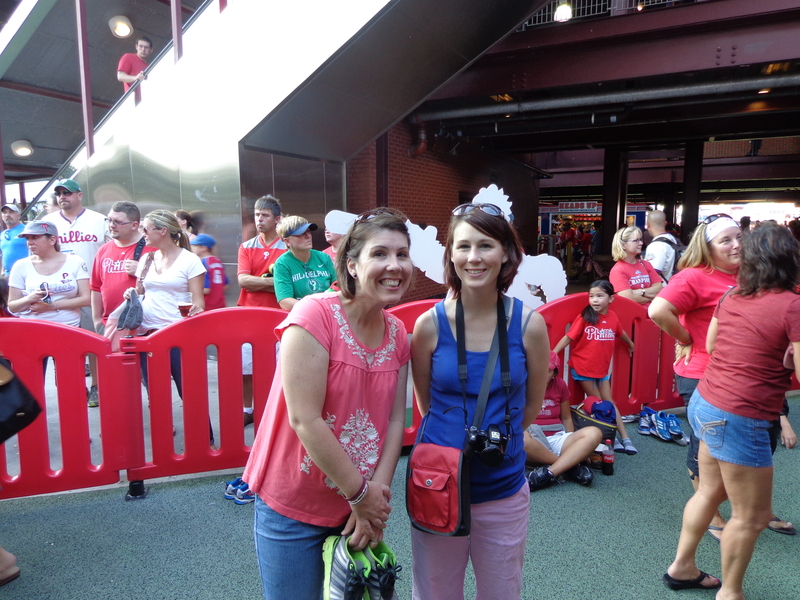 We were joined by Colleen and a bunch of sorta-Phillies-fans, Uncle Kevin, Aunt Kimberly, Gill and Kate. 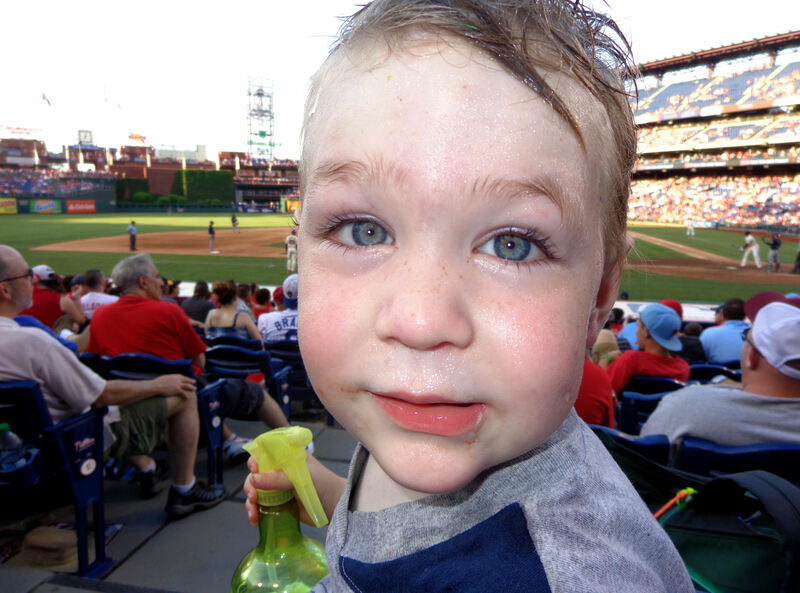 Kevin was raised in Manayunk and (to the extent he cares about baseball) identifies as a Phillies fan. 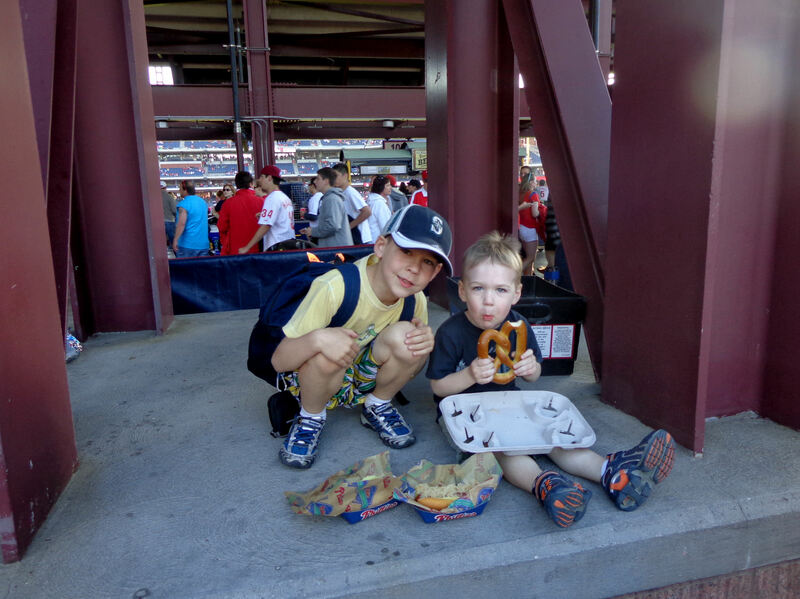 I’ve been trying unsuccessfully to get these guys out to a Phillies game the past couple seasons. So we put this game on our calendar at the very beginning of the season. 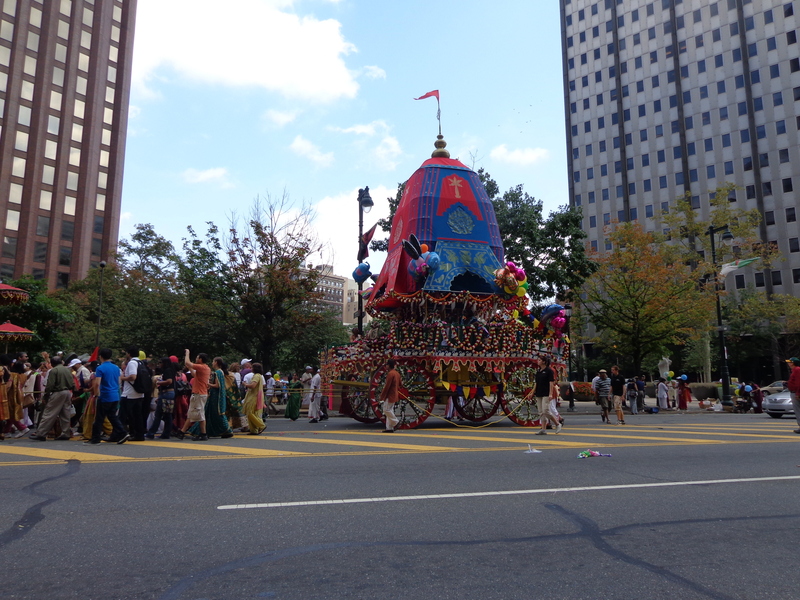 …when we dropped Colleen off along the Benjamin Franklin Parkway. I should mention that this was one of those odd 4:05 starts. 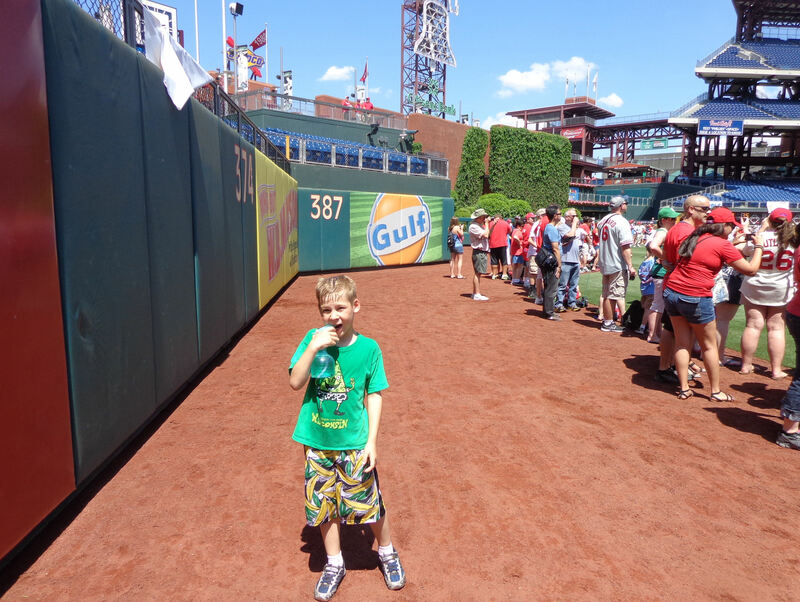 …an usher appeared from the direction of LF or 3B, walked out to the gate and handed a baseball to Kellan. 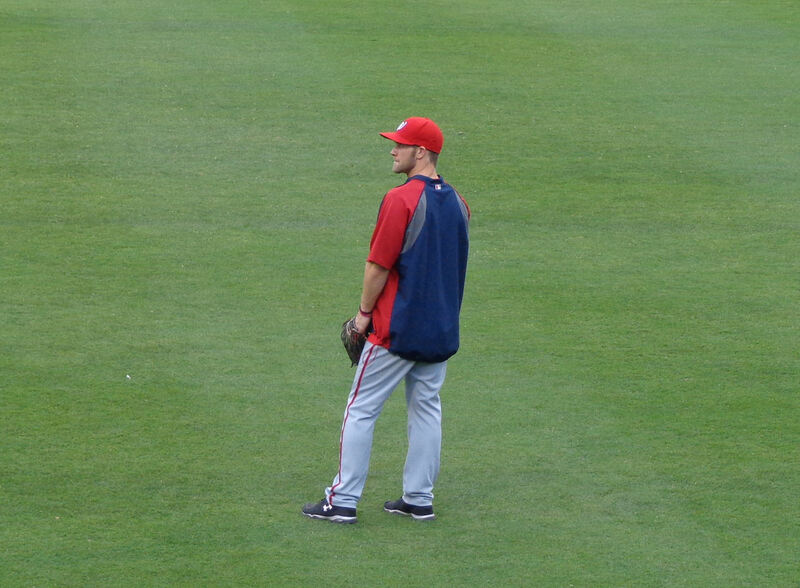 And then he immediately turned and kept walking toward CF. That is him at the end of the red arrow walking away from us in the middle picture above. As I mentioned, it was a bizarre start to the day. I threw in the green “1” in the picture above because (with VERY little effort on our part) things were about to get historically ridiculous for us. Things were quite in LF. Eventually, we headed out to LCF where nothing much happened. But then the rest of the stadium opened up, and we headed over to the pizza wedge. Nichols is the guy hiding behind the other guy next to the green “3.” In that picture with the “3,” Tim is catching a baseball that Antonio Bestardo tossed up to him from the warning track. A great catch by Tim! 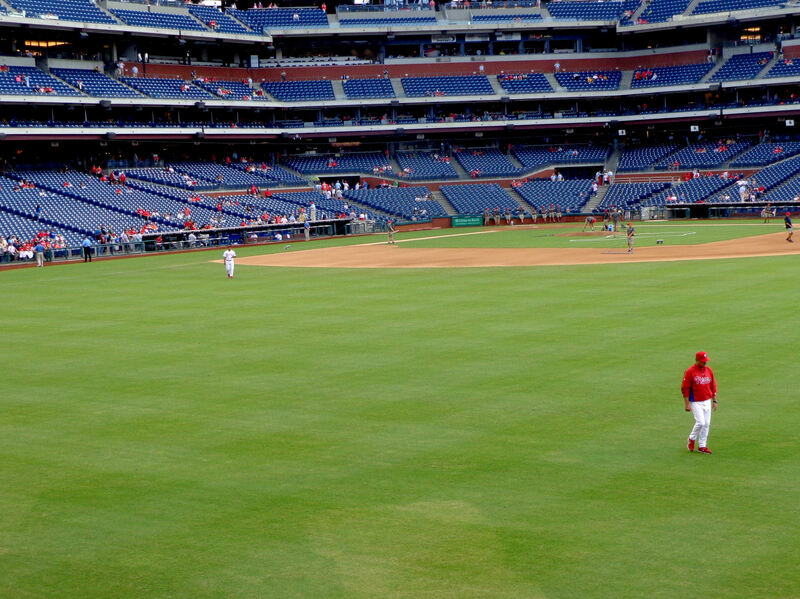 There were very few people out in RF, and even fewer after the Phillies cleared the field but Braves had yet to take the field. 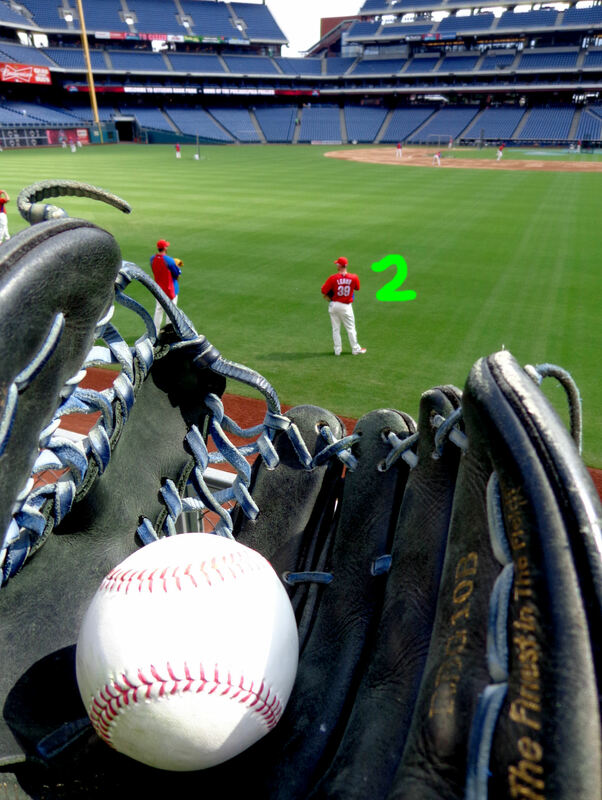 Perez saw two baseballs sitting on the ground by the Phillies bullpen bench. He grabbed them both and tossed them both to us! So, there you go. 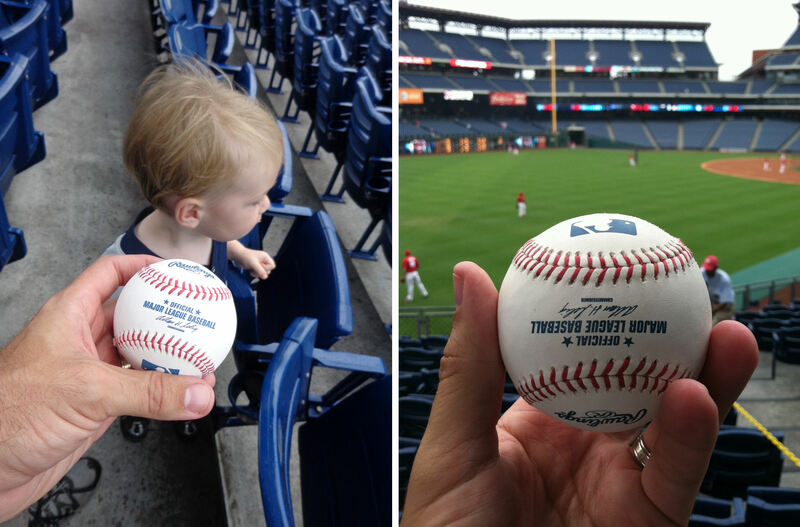 The Braves hadn’t even come out for BP yet, and we already had caught six baseballs. We decided to hit the restroom, get some water, and relax in the shade a bit until the Braves took the field. 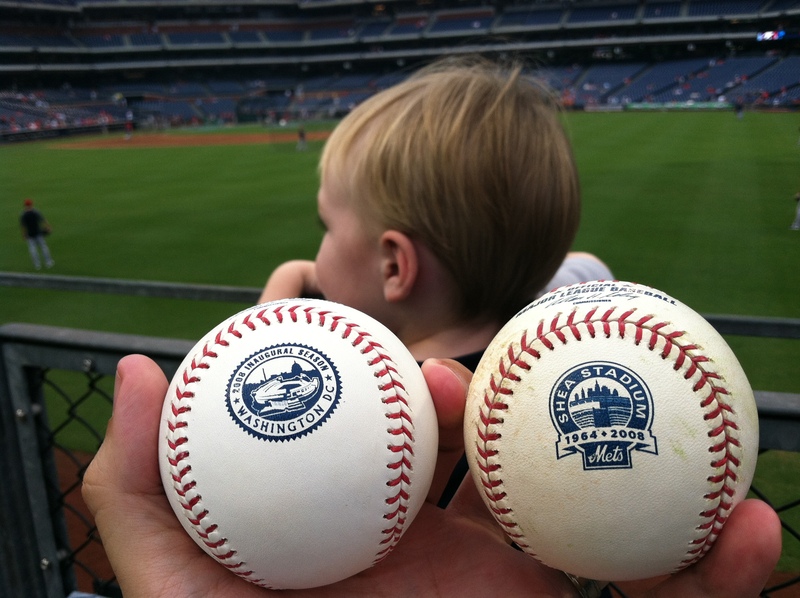 While we were hanging out in the shady concourse behind section 102, we made a decision that our next two baseballs (assuming if got two more) would be for Gill and Kate. In the world of MyGameBalls.com, we don’t “count” baseballs that we give away and I had already literally recorded the six baseballs we’d already caught in the little notebook we carry with us at games. 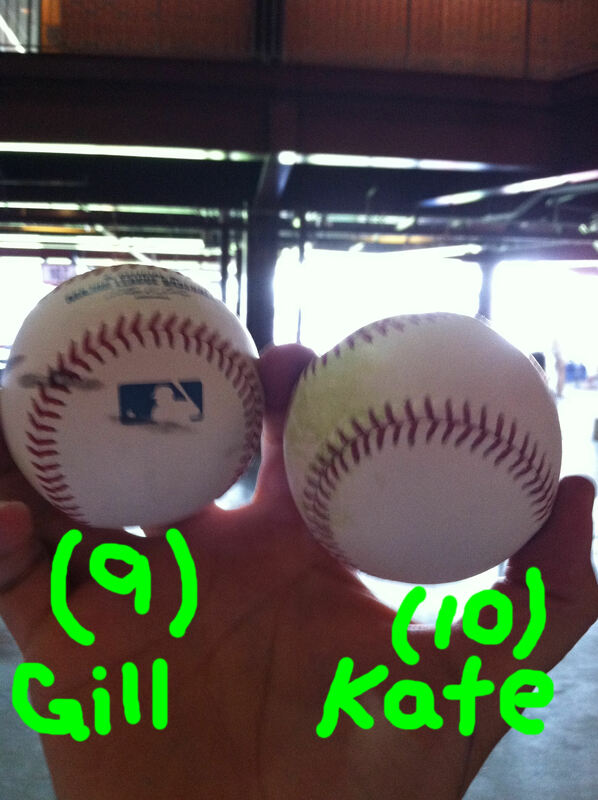 So we were really hoping we could get at least two more baseballs so we could have one each for Gill and Kate. 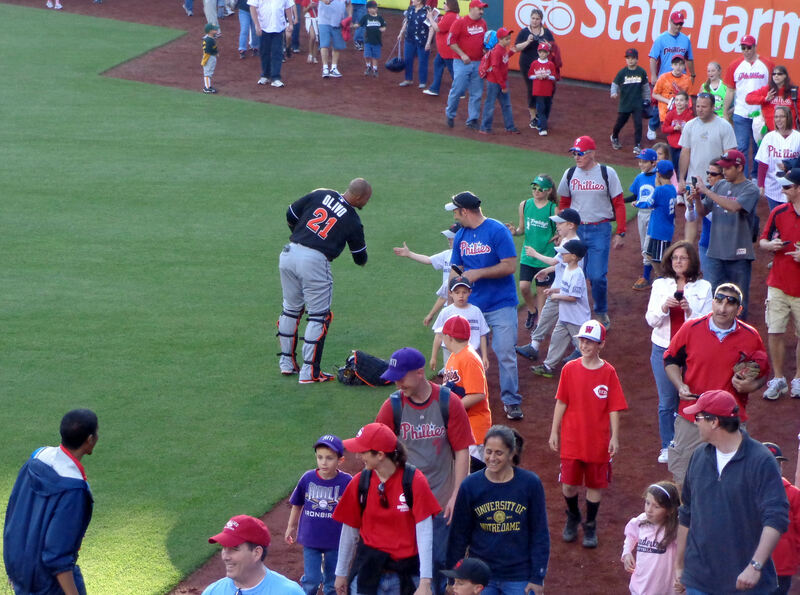 …ran across LF toward the bullpen entrance. We were right in the tip of the pizza wedge. Until Tim Byrdak tossed Tim a baseball (and then two more) earlier in the season, Tim and I had been on a five year mission to get Tim a baseball from a Major League “Tim.” And, right at the tippy-top of our most wanted list sat the ultimate Major League Tims: Tim Lincecum and Tim Hudson. Bot had eluded us. But on this day, as Tim Hudson approached with a baseball in his glove, I called out, “Hey, Tim! How about tossing a baseball to another Tim!” as I pointed down to Tim. As the green “7” above suggests, it worked! We were super-excited to get a baseball (a beautiful one that appears to be “game rubbed”) from one of the best Tims in the business. But then my thoughts immediately turned back to the decision we had made just a few minutes earlier – the next two baseballs would be for Gill and Kate. Oh, no! There was no way we could give up this Tim Hudson baseball. 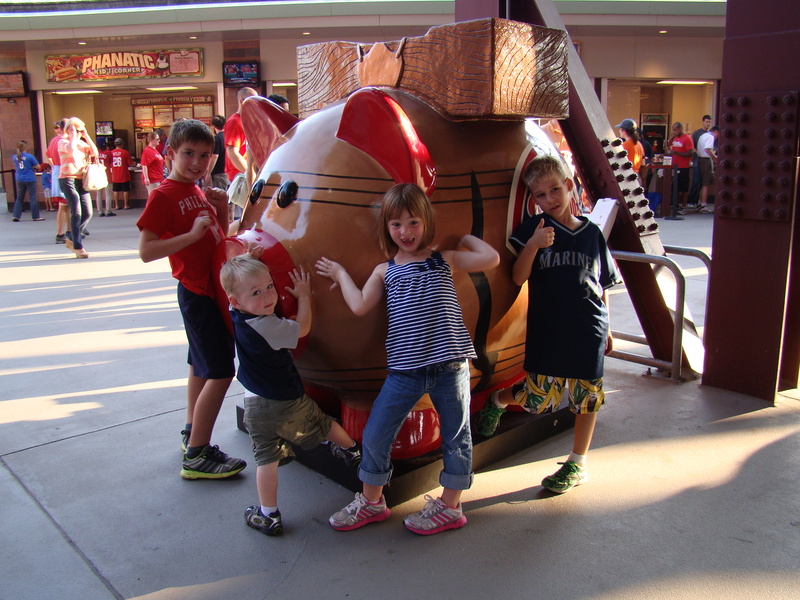 So, I announced to Tim and Kellan, “Okay, our next two baseballs will be for Gill and Kate! …, and Tim made a great catch. When I announced, “Okay, there’s one for Gill and Kate.” Tim replied, “No! Not this one!” He was too proud of his catch, and the really liked the nice grass stain on the baseball. But how many more opportunities would we even have!? Not too long after Tim caught the ball from Paul Maholm, Kris Medlin tossed a baseball to me. And then Maholm fielded another baseball on the warning track right below us. 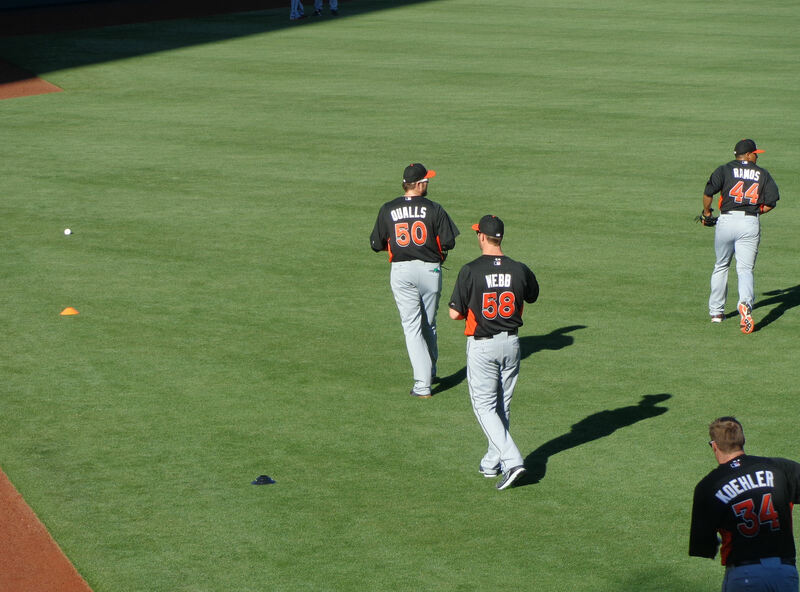 Tim called out to him, “Paul, can I have another baseball for my cousin?” And Maholm obliged. Thanks, Paul and Kris…from us and Gill and Kate! So, those two balls don’t appear in our official count on MyGameBalls.com or the Cook & Son Baseball Museum (http://www.cookandsonbats.com/museum/”), but let’s put the “official” count aside and focus on what was in our backpack at the time…at the time, they represented numbers 9 and 10 on the day. And the day wasn’t over yet. 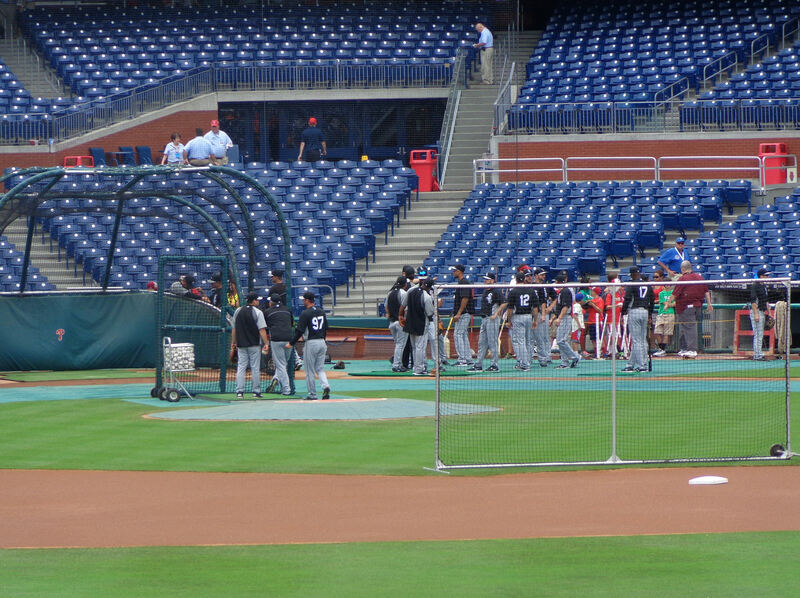 In fact, it was still early in the Braves portion of BP! 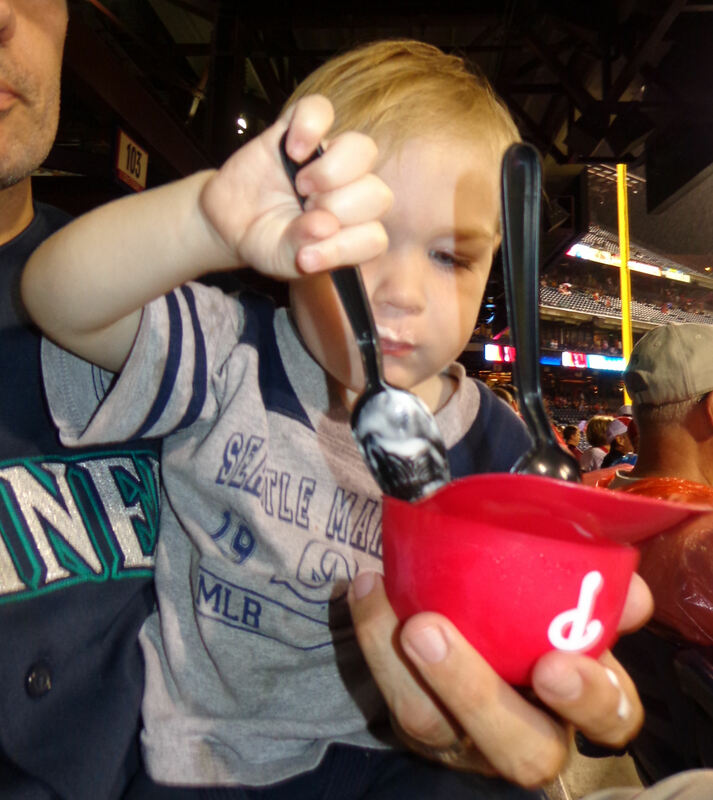 …where I scooped it up for our only hit ball of the day. So at this point, we had about an hour until the game was scheduled to start. We decided to use that time to carry out a “Games of Baseball” mission. 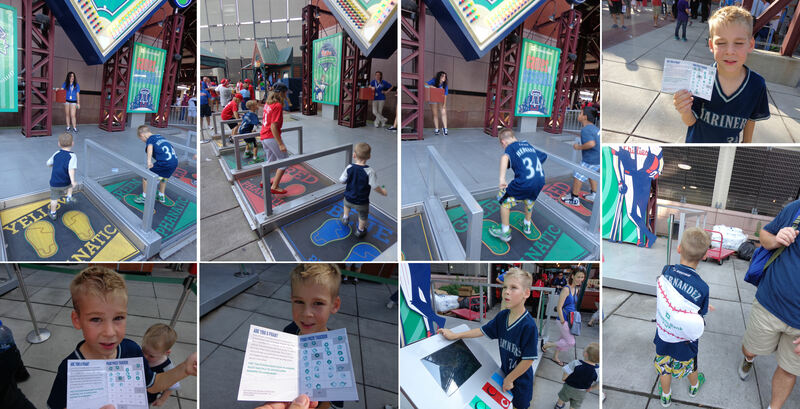 When you play each game (of which there are only two this season – a trivia game and a race around the bases), you get stamps in a little booklet that can be traded in for prizes. 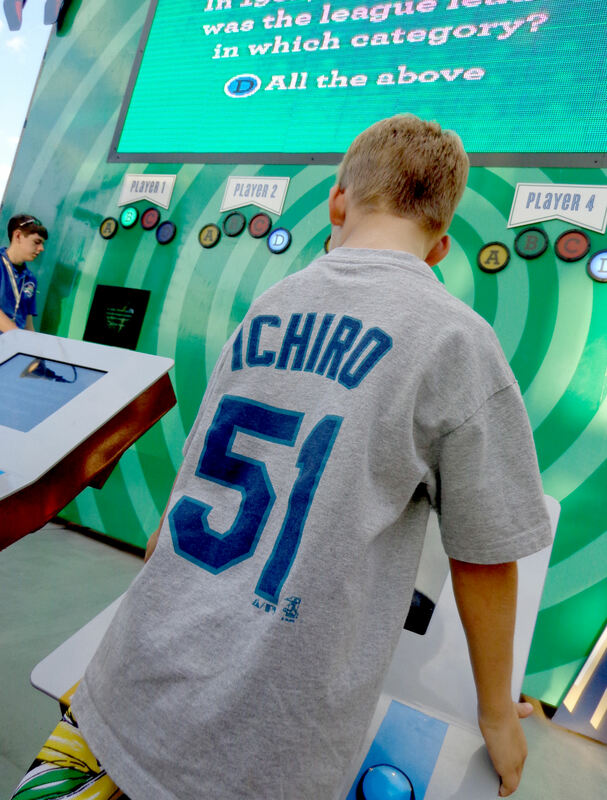 The top prize is a baseball string backpack that takes 30 stamps – an entire booklet. We wanted it bad. I took that picture of the two coaches (above to the right) because that is Rod Nichols sitting on the bench. He had tossed a ball earlier and I had no clue who he was. I took this picture so I would have something to compare against whatever pictures I might later find of him on google while trying to figure out who the heck he is. As Roy Halladay stretched in the outfield, our old buddy Jesus Tiamo made his way out to the bullpen and guess what? He tossed Tim a baseball. Thanks, Jesus! You were truly awesome to us this season! While that baseball goes down officially as our tenth baseball of the day, it was literally our twelfth, which was one more than our personal record at the time. It took right up until game time, but we completed that whole stamp booklet and claimed the top prize! 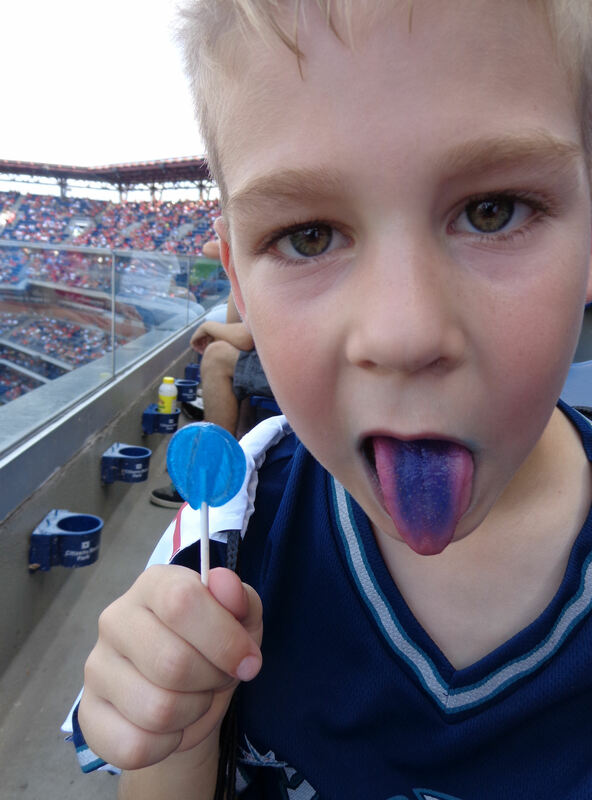 (I should mention that lollipops are also awarded to “Games of Baseball” participants). We were in the first row of section 427. I liked it a lot; a very nice view of the game. (By the way, that picture is out of order, it’s from later in the game). We were late arriving to our seats because it took a long time for us to get all of the “Games of Baseball” stamps that we needed. 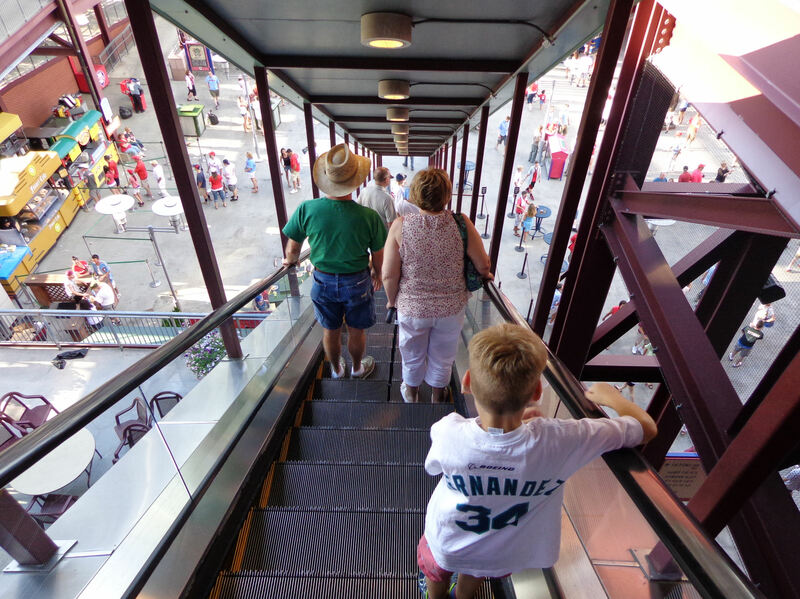 The game started while we were trudging through the concourse toward section 427. Roy Halladay started for the Phillies and was not sharp. He walked the leadoff batter Michael Bourn to start the game. 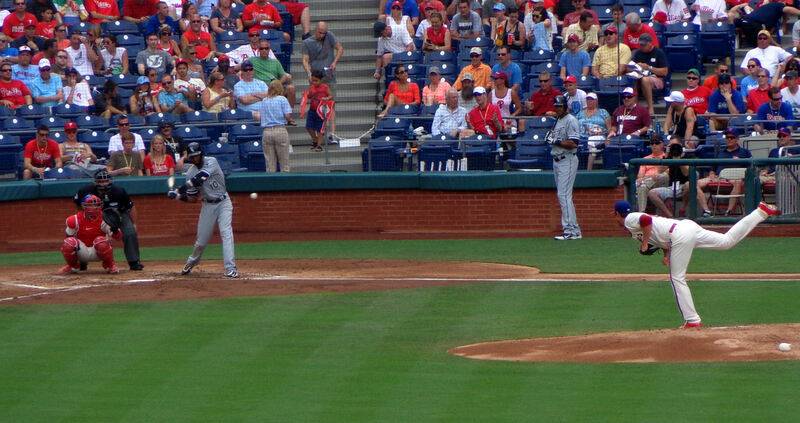 Luckily for the Phils, Bourn was caught stealing before Martin Prado hit a single to CF. Prado was erased on a fielder’s choice grounder by Jason Heyward. Right as we sat down in our seats, I pulled out my camera and just missed capturing Chipper Jones hitting a first-pitch single to RF. This would be the last time we would ever see Chipper play and I really wished I would have got that picture. That made it 3-0 Braves and, it turns out, it was a game-winning homer for Freeman. 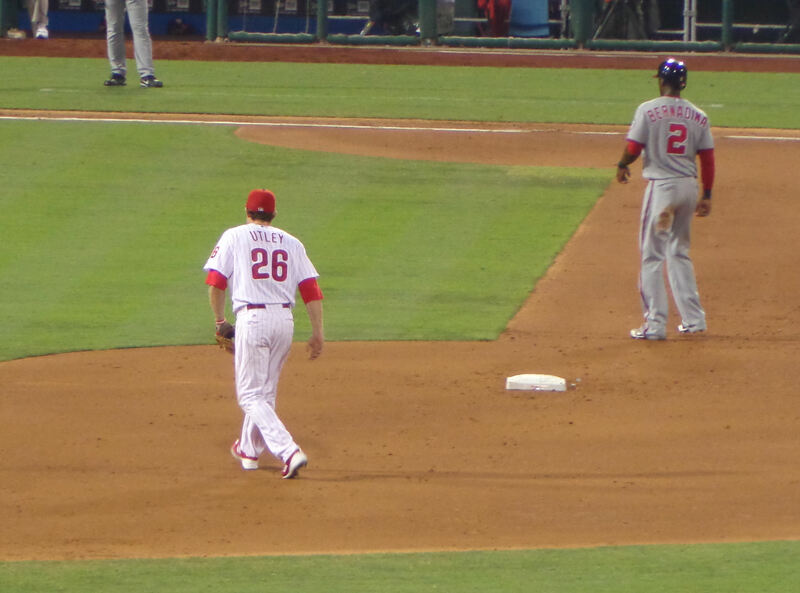 In the bottom of the first, Jimmy Rollins hit a grounder right down the line. Chipper made a nice diving catch, but the ball was just foul. 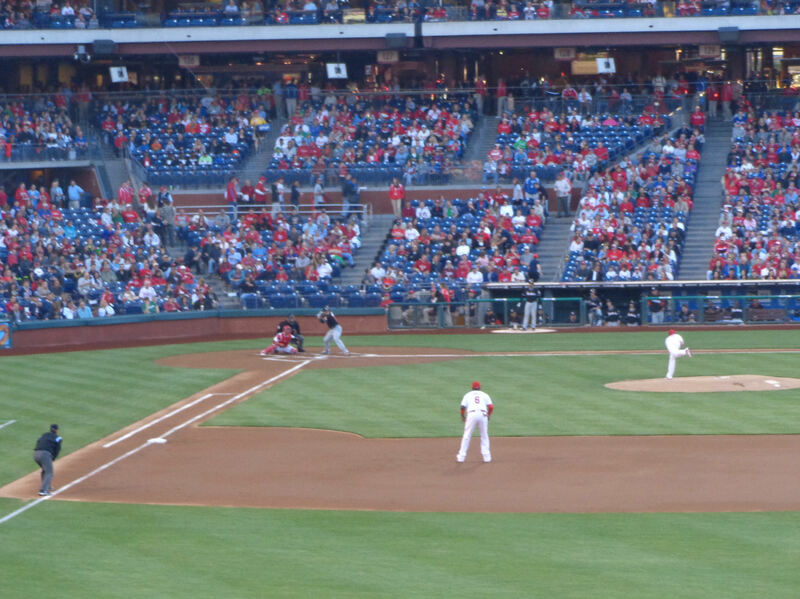 The Phils would go scoreless in bottom of the first. The Braves were right back at it in the top of the second. 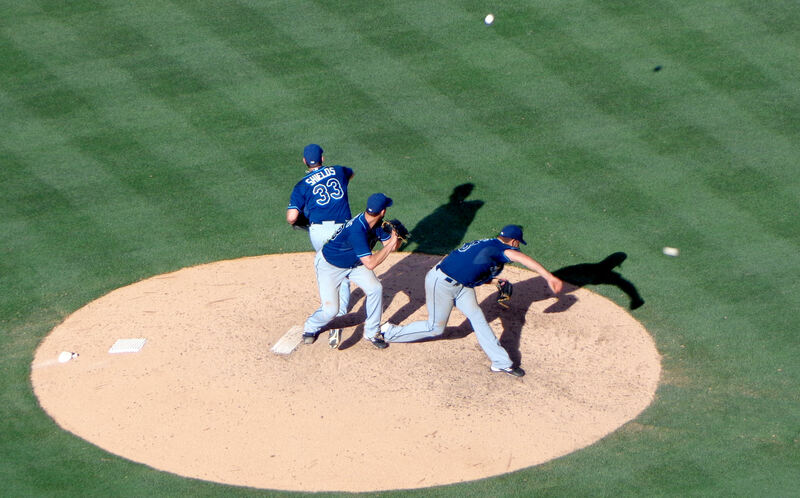 Again, it started with Halladay issuing a walk to the first batter of the inning, this time Brian McCann. After back-to-back strike outs, Hallady then gave up a single to Bourn and walked Prado. That brought the J-Hey Kid to the plate. …, but all three baserunners (McCann, Bourn, and Prado) scored on the play. Heyward ended up at second. Hey wouldn’t stay there long. 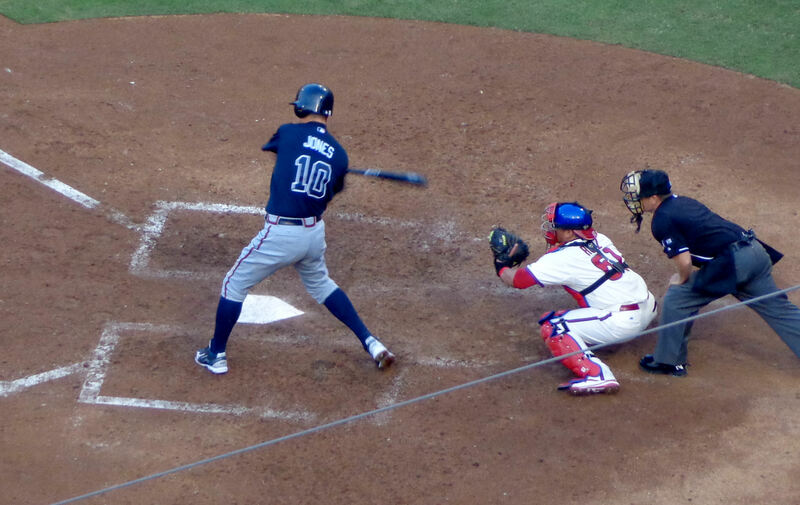 …and, two pitches later, he gave up an RBI double to Chipper Jones (scoring Heyward). After two innings, the score was 7-0 Braves. (Special thanks to my uncle, Ed, for helping us identify that bird. 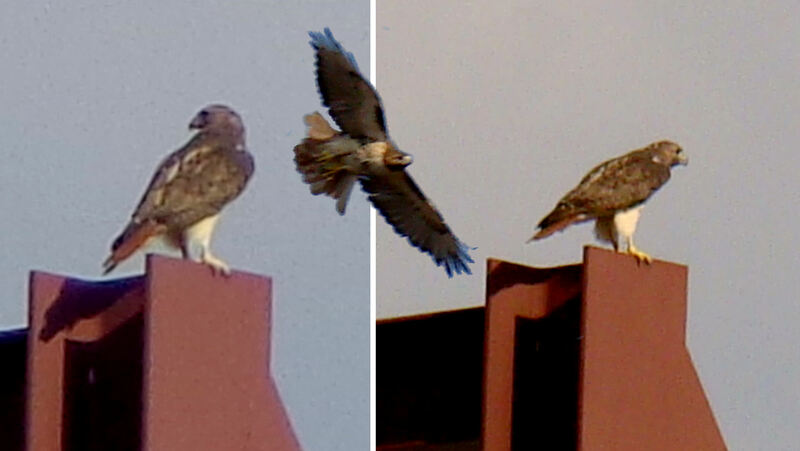 Ed raises falcons and knows a thing or two about birds). At the time, Ruf was batting .000 for his MLB career with zero RBI. Well, we didn’t get to see Ruf’s first MLB hit. 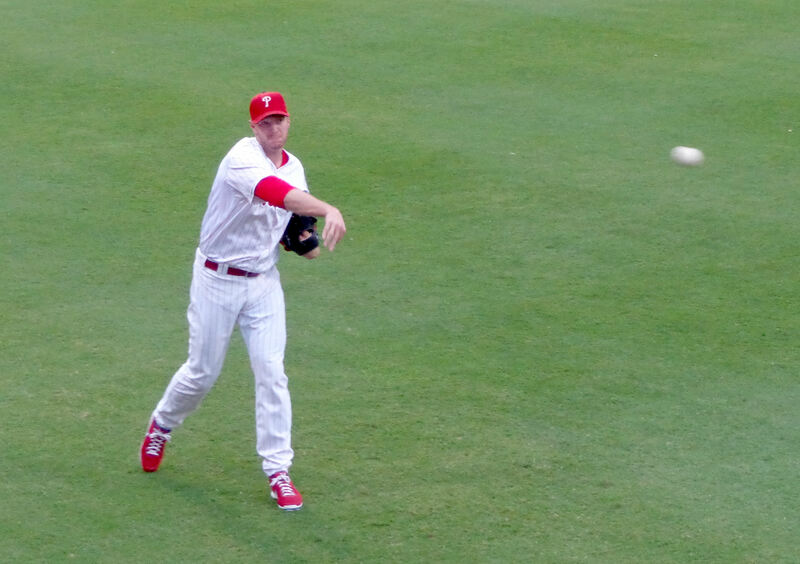 But he did manage to lift a high fly ball to deep CF that was good enough for a sacrifice fly (scoring Kevin Frandsen who had hit a triple) and Ruf’s first MLB RBI. By the way, in 12 games Ruf would eventually collect 11 hits and 3 HRs by the end of the season. 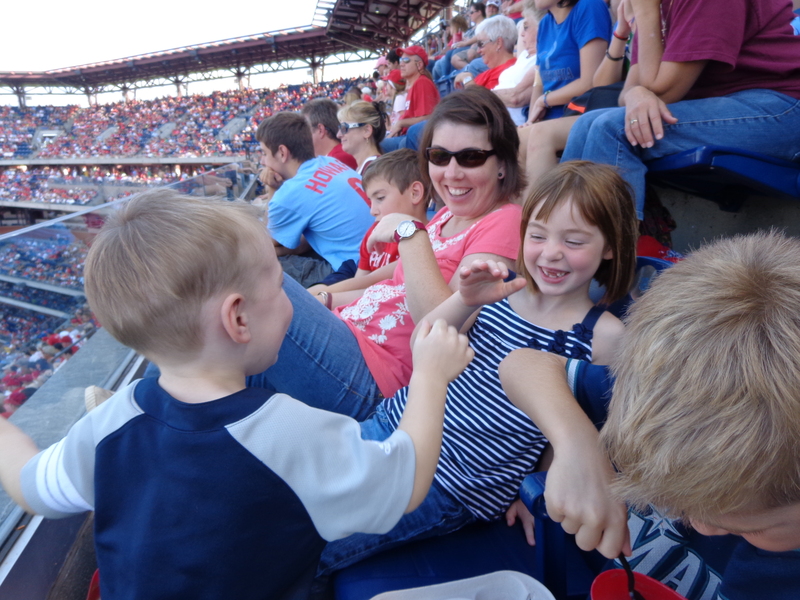 Oh, yeah, Ryan Howard hit a homerun while the kids were playing. That made the score 7-2 in favor of the Braves. 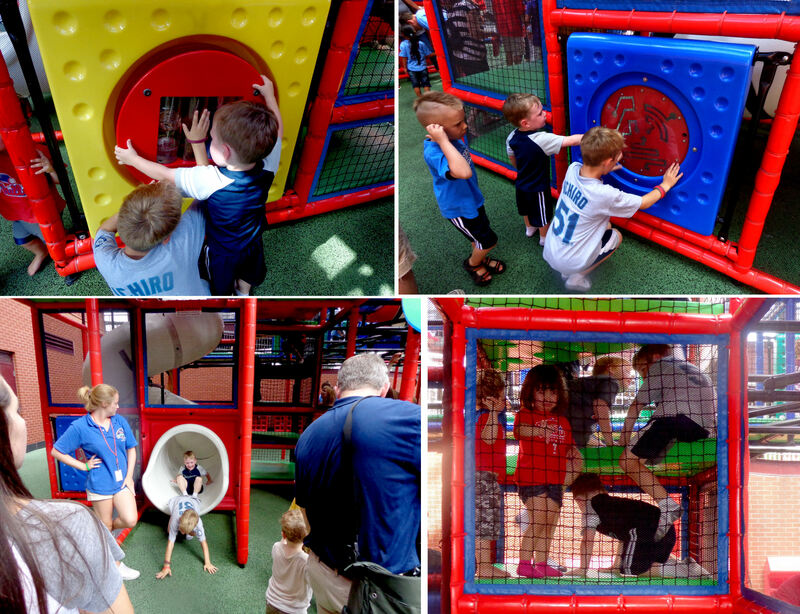 We couldn’t hang out too long in the play area because it was just way too crazy. If you click that link above, you can find out all sorts of cool facts about the S.S. United States. The ship has been docked in south Philadelphia along the Delaware River for years. 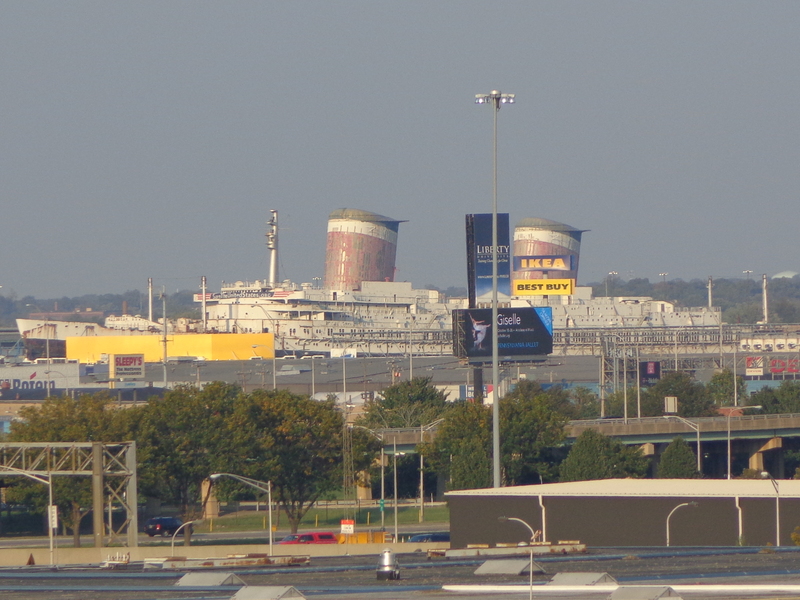 Back when I lived in Philadelphia, I always thought it was a little eerie when I would ride my bike up Columbus Boulevard past the ship. After an unprecedentedly crazy BP, we figured we would make an attempt at getting a post-game umpire baseball. 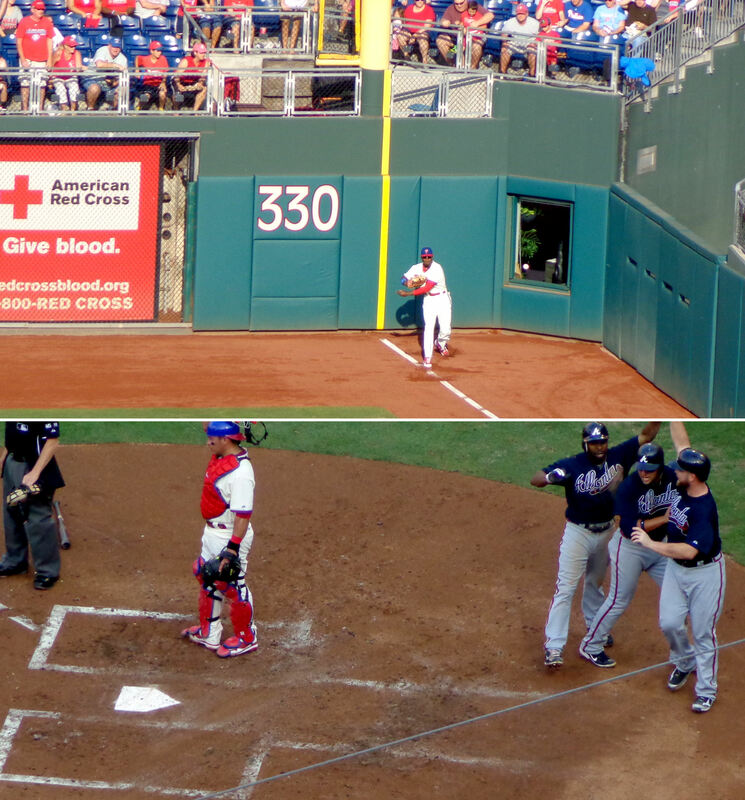 Kellan gave home plate umpire Jerry Meals a target while the Phillies were still taking their hacks. Here’s what happened. We were sitting in the fourth or fifth row in section 130. There were only two people sitting in section 129 (the closest section you can get to the umpire’s tunnel without being in the diamond club). As Mayberry grounded out, Kellan and I slipped past those two people in the second row and then hopped into the last seat in the first row. 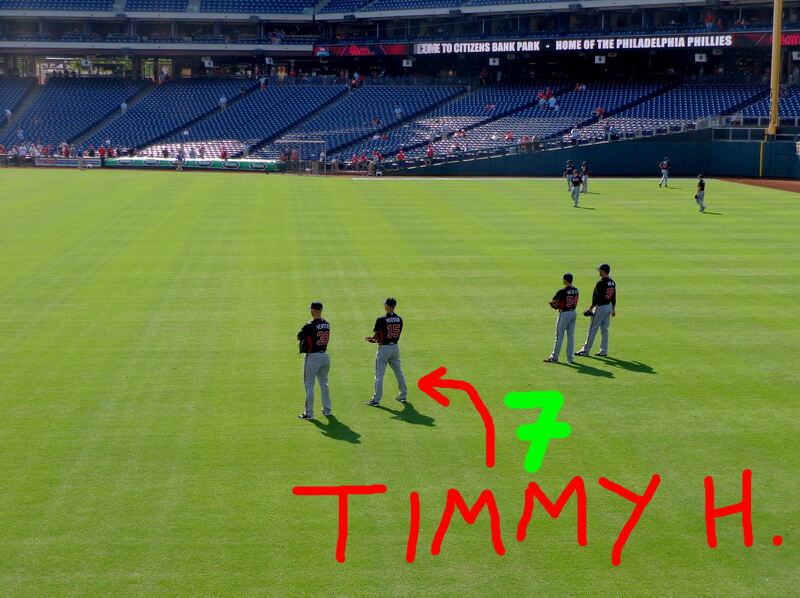 I thought Tim was following me, but when we got to the first row, he was nowhere in sight. I figured he must have stayed with Colleen. As Meals approached the umpire’s tunnel, I called out his first name: “Jerry!” He looked up and locked eyes with me, pulled out a beautiful rubbed up baseball and tossed it right to me. Just then, out of nowhere, Tim popped up from below. 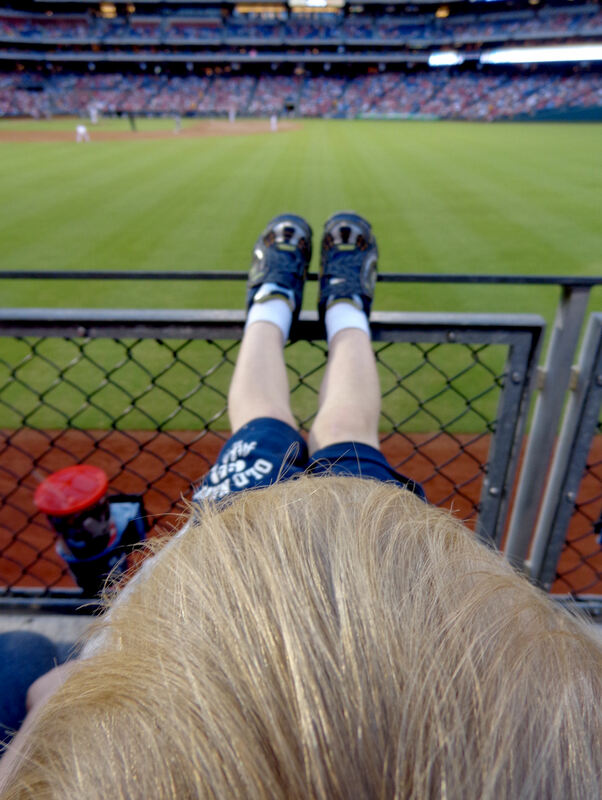 He had run straight down the stairs to the dugouts and then squeeze by everyone in the front row until he made it over to us. He promptly threw up his glove in a “I’ll take one, too, Jerry” motion. And Jerry obliged (although he bounced his throw on the dugout and it ended up landing under the seats in a plate of food). 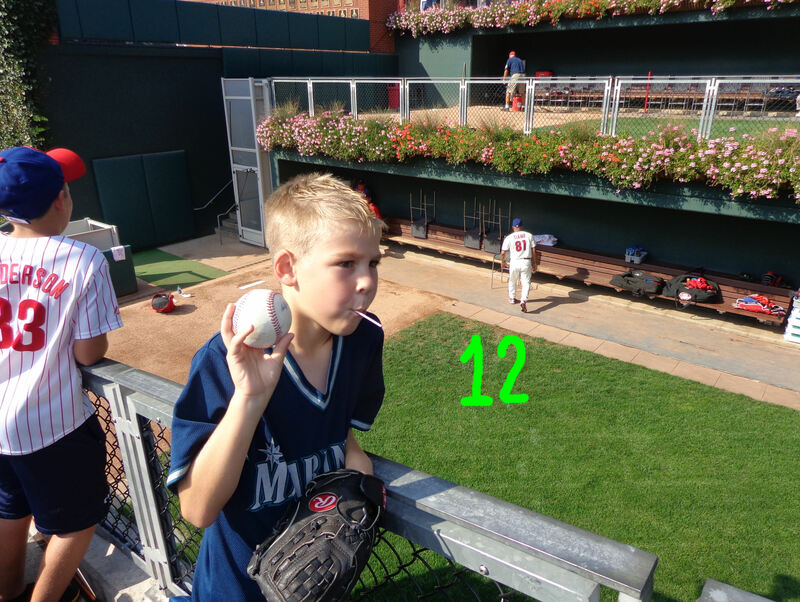 By the way, the 13 and 14 in the last picture count the Paul Maholm and Kris Medlin baseballs that we gave to Gill and Kate. 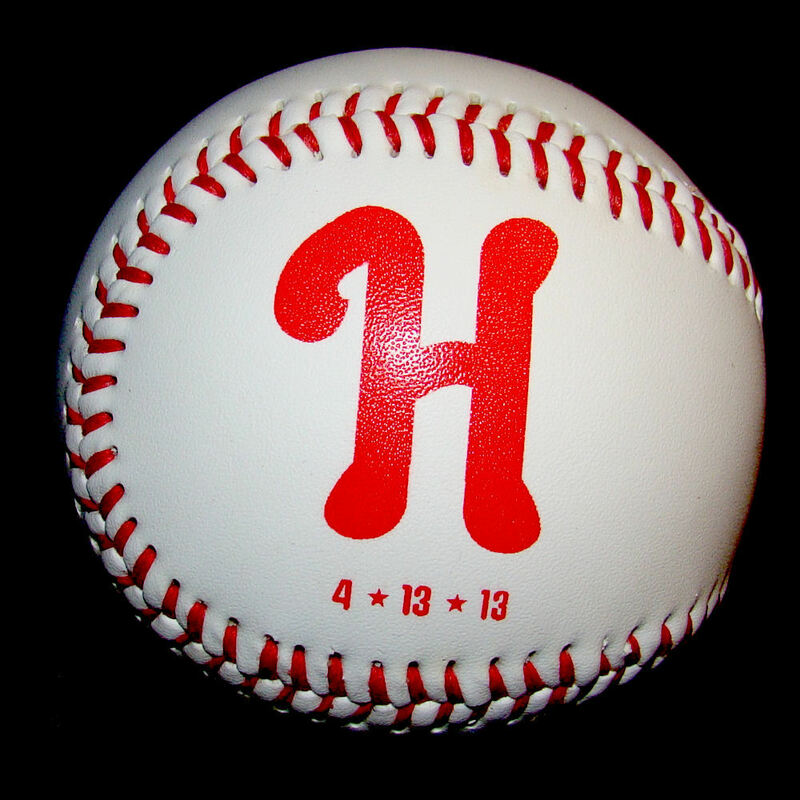 If you check out our entry for this game on MyGameBalls.com, it shows 12 (not 14). 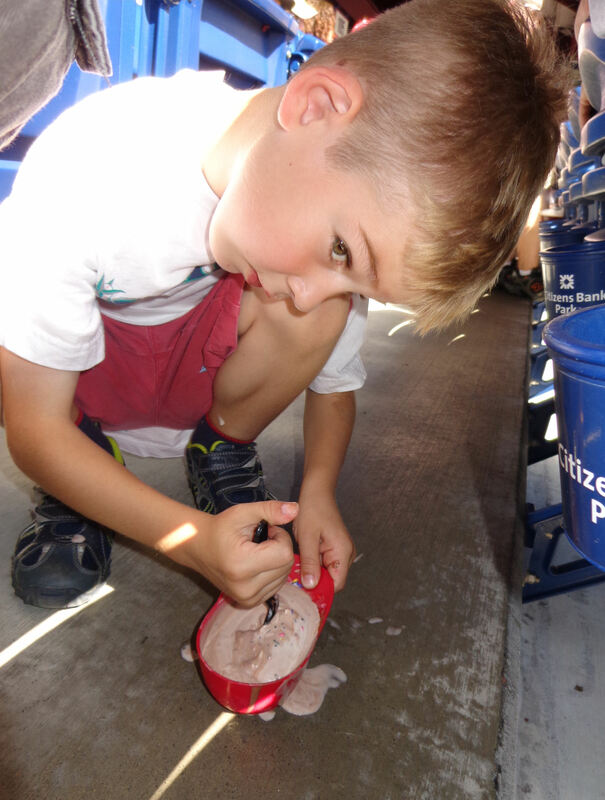 Anyway, it was a crazy, crazy day at the ballpark. After the umps cleared the field, it was the victorious Braves’ turn to head into the dugout following their on-field celebration. Pretty much the entire team (except for the relievers) cleared the field by way of the stairs almost right below where we were standing. As Chipper Jones headed reached the top of the stairs, he balled up his batting gloves and tossed them into the first row. They were tossed probably 5-7 feet to our left. I was holding Kellan so I didn’t even make a move for them. But the guy right next to Tim dove out to his left and intercepted the gloves before they made it to the people standing in the gloves’ direct path. It was a pretty cool pair of souviners for that guy to take home. Right after Chipper tossed the gloves, a fan maybe five rows back in the diamond club yelled, “Hey, Chipper” and Chipper half looked up and waved with his glove. It was clearly nothing more than a “oh, hey, there fans” gesture by Chipper, but the guy took it (completely unreasonably) as a “Hey, throw me that ball and I’ll autograph it for you” gesture. He immediately chucked a baseball at Chipper. 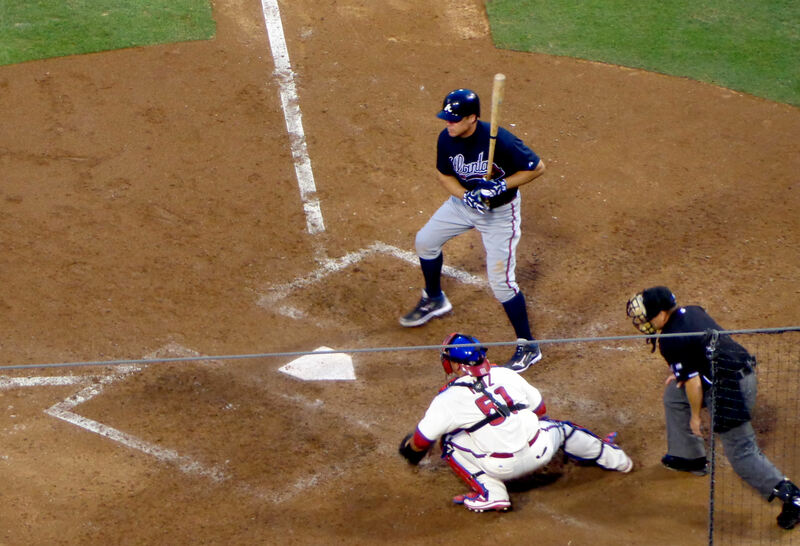 It barely missed Chipper as he ducked out of the way. It was sour ending to Chipper’s night, I could see him mouth some non-appreciative words to himself as he ducked into the tunnel below us. All-in-all, it was a pretty hilarious scene. The guy’s baseball (which was already autographed by several players) hit some other player(s) and then ricocheted onto the field. I thought the guards down there would toss it into the dugout never to be seen again. But they gave it back to the guy while giving him an earful of non-appreciative sentiments. Meanwhile, Kimberly, Kevin, Gill and Kate had just exited the subway in Center City and were getting absolutely soaked on the walk to their hotel. 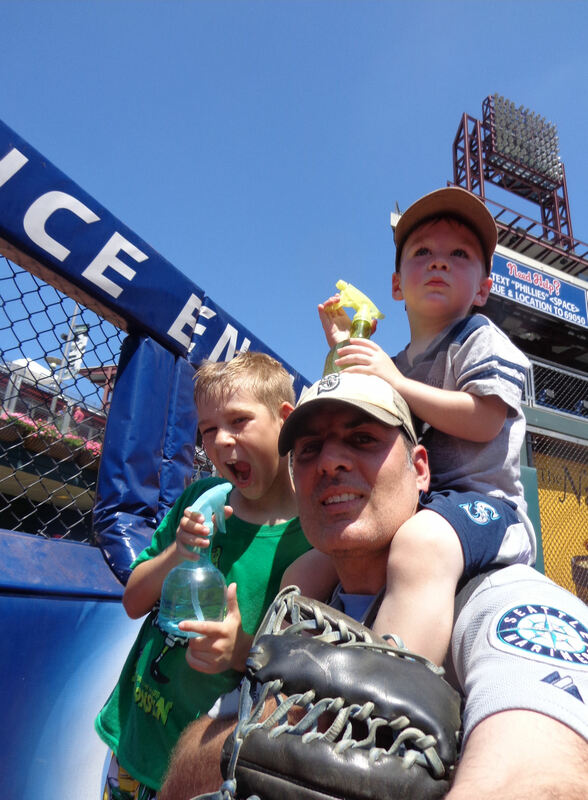 From a historically crazy BP, to all of the “Games of Baseball,” to all the family fun, it was a great day at the ballpark. 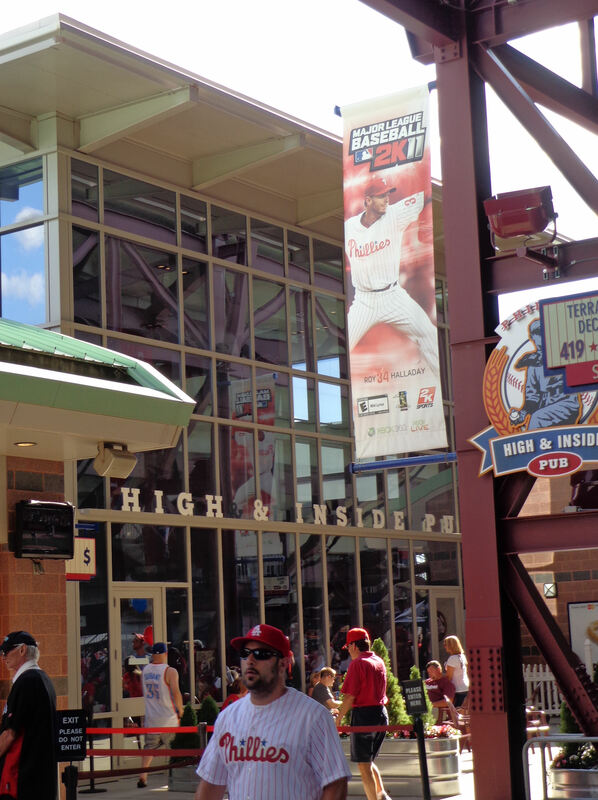 Sadly, we would only have one more day at the ballpark in 2012, and it would be the next weekend in Baltimore. 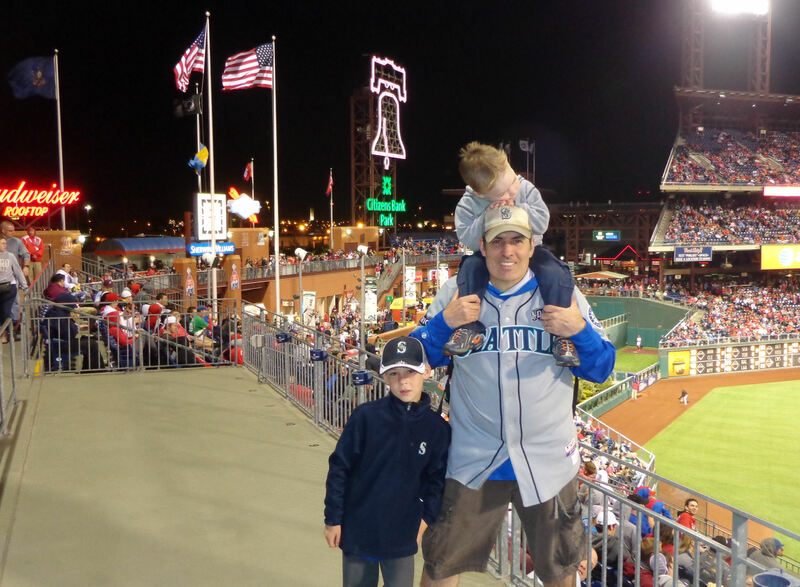 This is the story of two evenings that the boys and I spent at a ballpark in Philadelphia. Two nights, 51 outs, and a whole lot of fun. The story starts in the afternoon on Saturday, September 8, 2012. Colleen was away for the weekend visiting her folks. 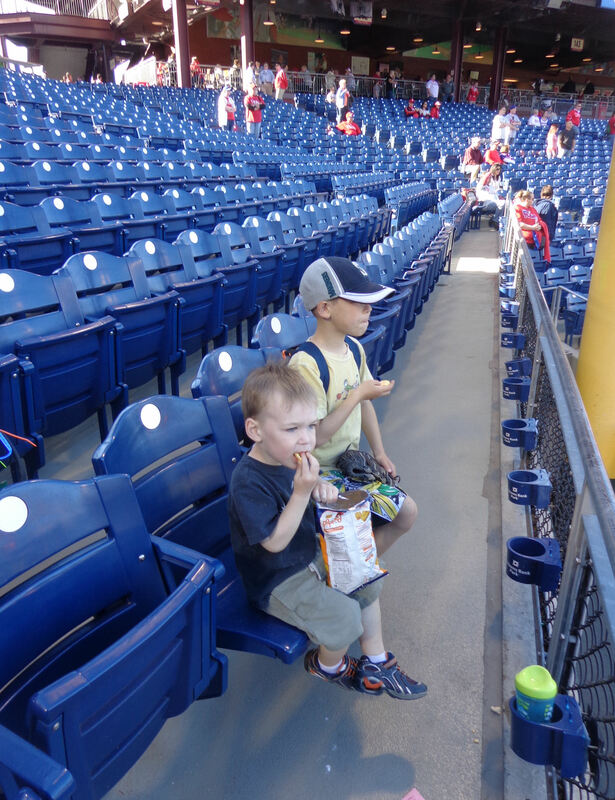 But the boys and I had Phillies tickets. 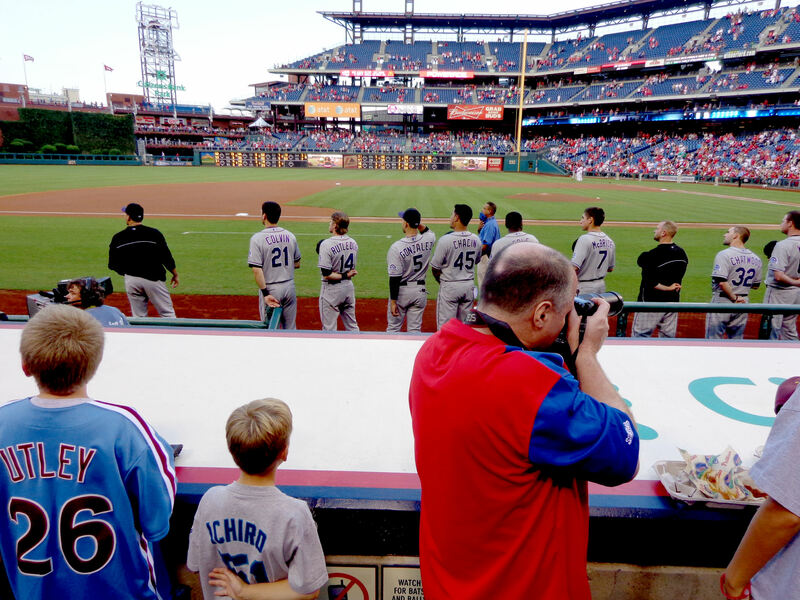 The Phils were scheduled to take on the Colorado Rockies. We hopped into the car a little after 2:00 p.m. Kellan napped a bit and Tim and I played a rousing game of turkey vulture – where we battle to see who can spot more turkey vultures along the drive. …in plenty of time. 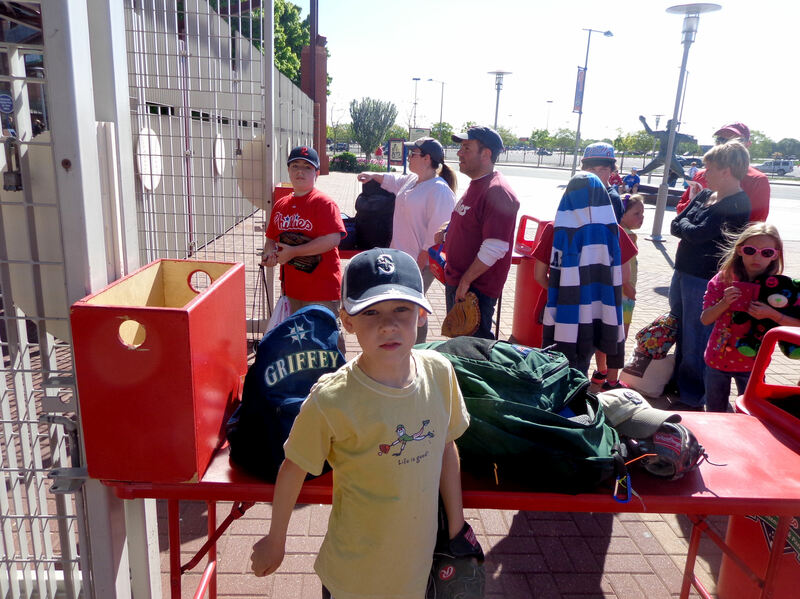 In fact, we arrived around 4:00 p.m., and the gates were scheduled to open at 4:35. 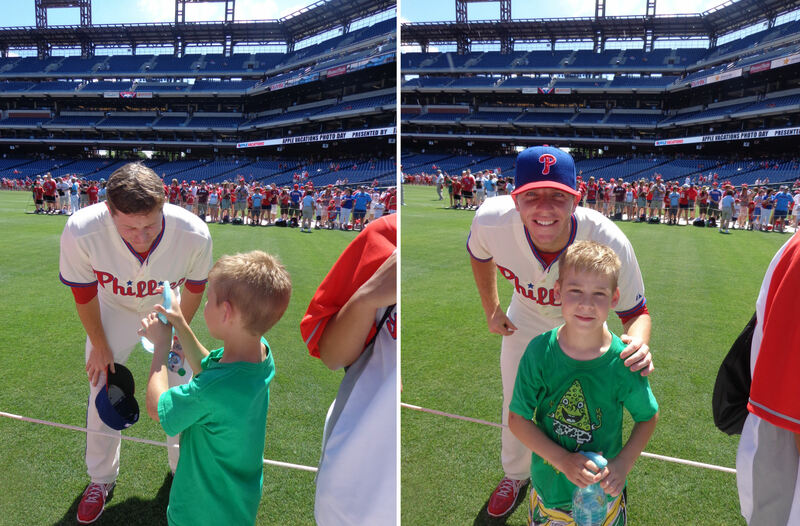 We past the time chatting with our Citizens Bank Park pals, the Tischler (Seth, Tami and Harrison. Generally, I pay no attention at all to weather reports. But, on this day, the consensus was that the weather wasn’t going to cooperate with the game schedule. 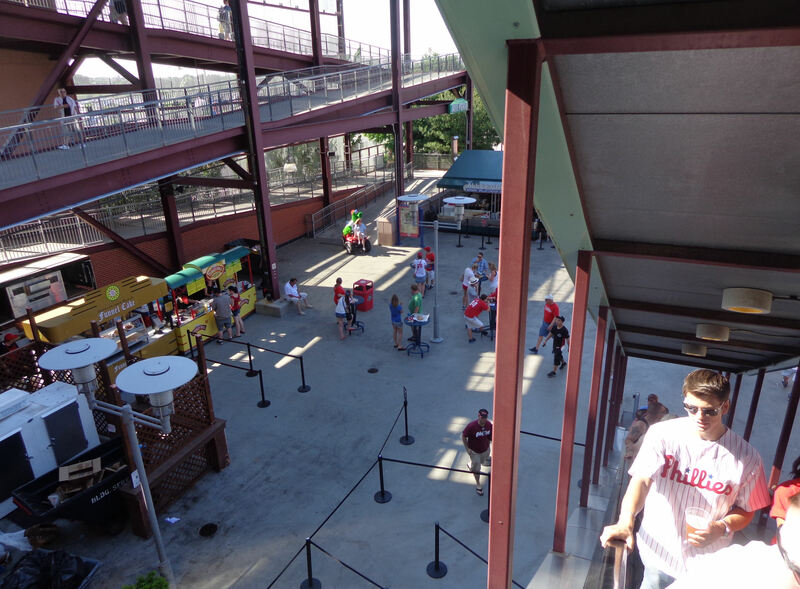 They typically open the first three gates at the LF gate 2.5 hours before a Phillies home game. But shortly after we arrived, an usher came out and opened the very first gate, which required us to relocate from first in line at the third gate and the Tishlers to relocate from first in line at the second gate. 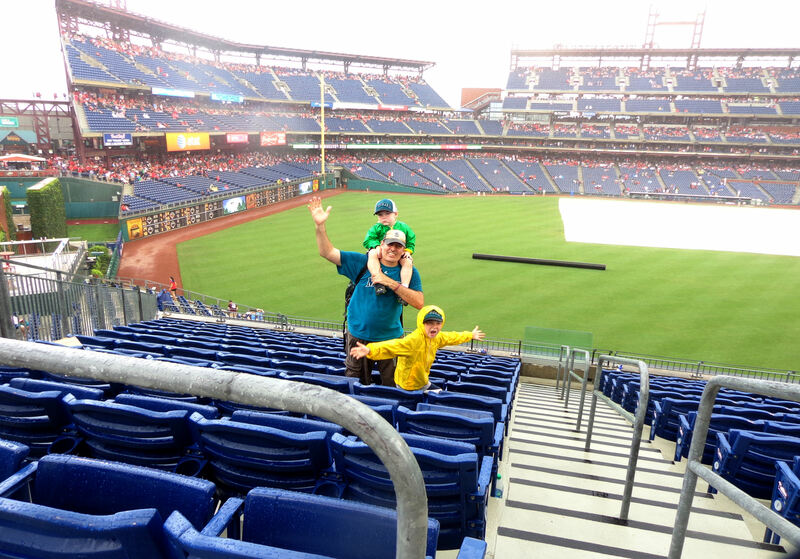 The usher said he was preparing the first gate because the Phillies were going to open the gate half an hour early…if it started raining. 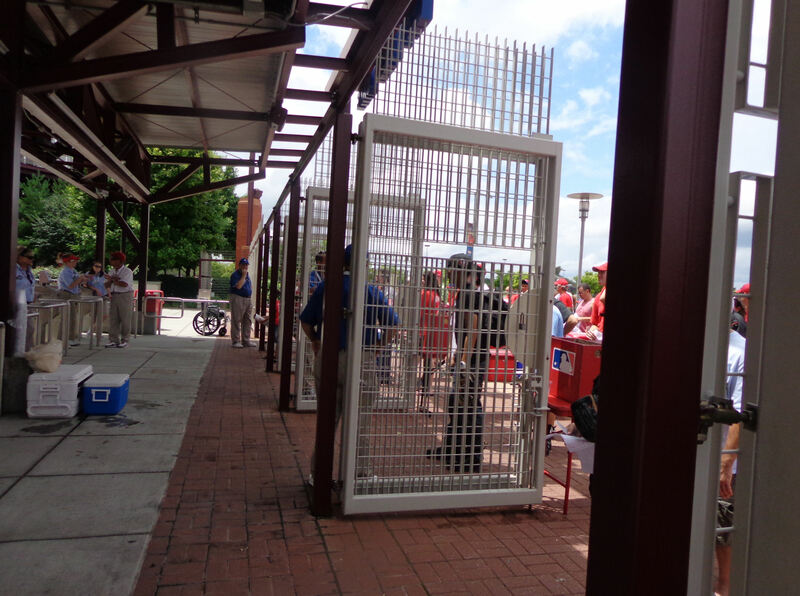 Essentially, if it started pouring rain on us, they would open the gate so we could take cover in the concourses, but if the rain held off we would simply get to stand outside an open gate for another half hour. 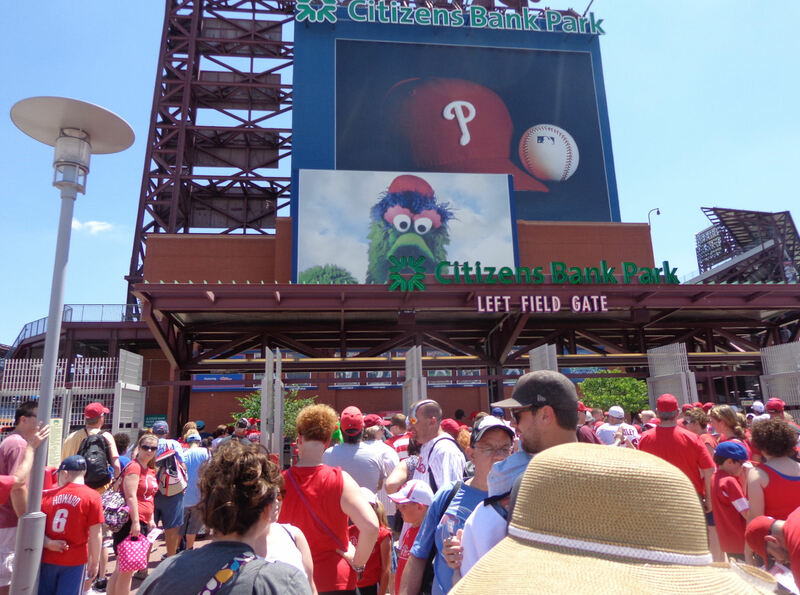 …but the sky was blue over Citizens Bank Park (in front of us to the southeast). 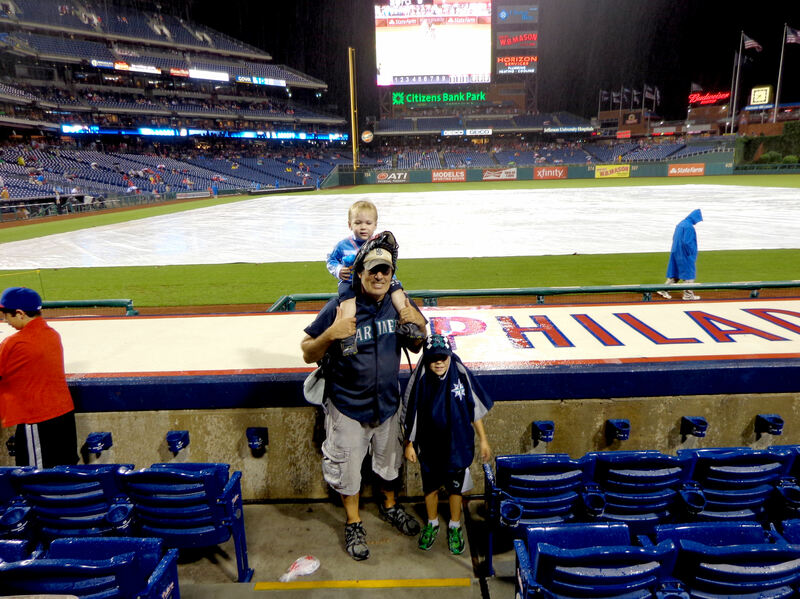 Rain usually moves from the southwest to the northeast around Philadelphia (up the coast toward NYC) so I still felt like we or, more precisely, the game could survive the weather. Oh, yeah, in addition to rain, there was 70 mile per hour wind in the forecast too. 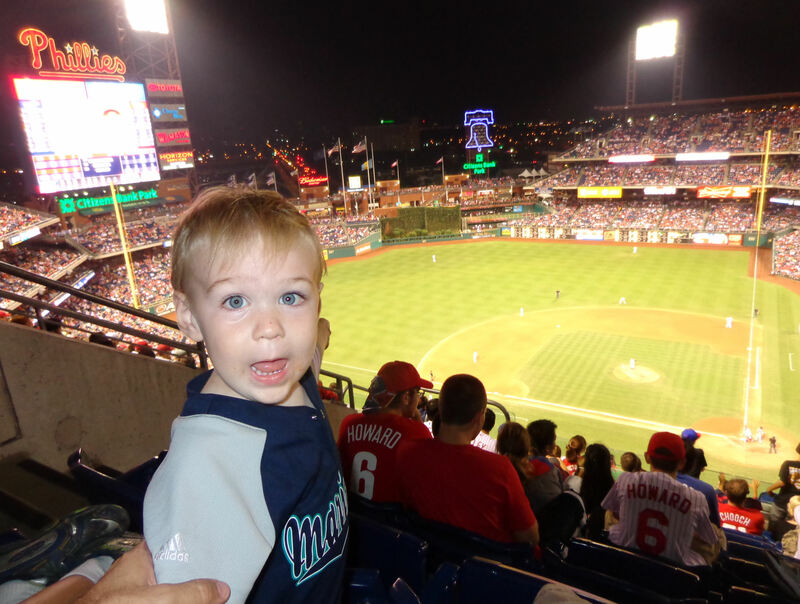 That concerned the Phillies too. But the Rockies pitchers were out playing catch. There was only a small gathering of fans out there. I figured all of the Rockies would toss their warm up balls into the crowd. There were plenty to go around for the few people out there. See that white “X” on the foul line down by the corner spot? 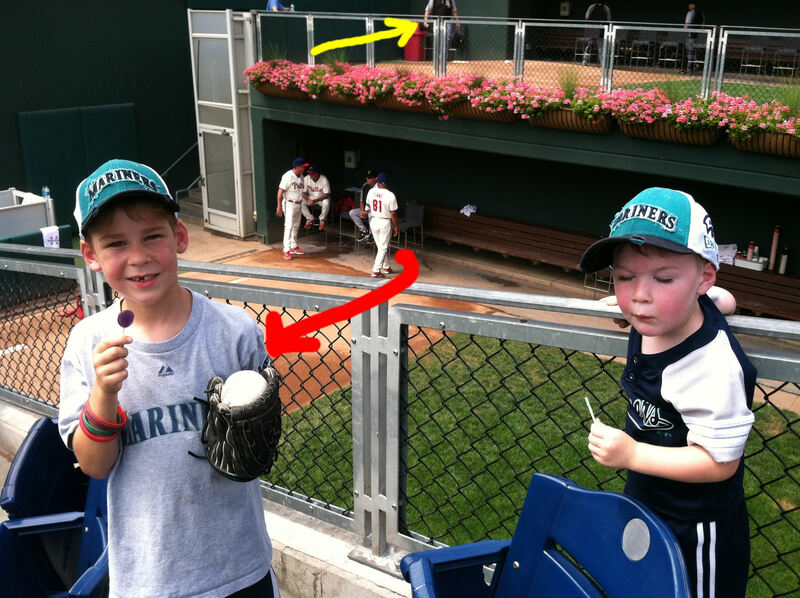 Out of the blue, Carlos Torres looked right at me from that “X” and then he tossed his baseball to me and the boys. We were right in the corner spot at the bottom edge of the section that is open for BP. To our immediate right, a yellow plastic chain blocked off access to the rest of the stadium. Torres’s throw landed just out of my reach on the “off limits” side of the yellow chain. But Bernie the very cool usher saw it all play out and came and grabbed the ball and gave it to Tim. Thanks, Carlos! And thanks, Bernie, for the assist! 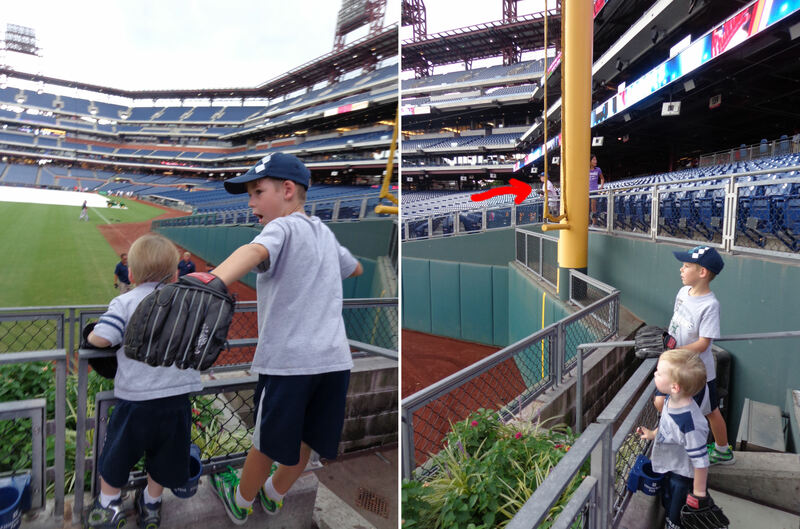 …so Harrison and his folks could be alone in the corner spot (the red arrow above is pointing to Harrison and, oh, by the way, see the young girl in the purple “Rockies” (not actually Rockies) shirt? 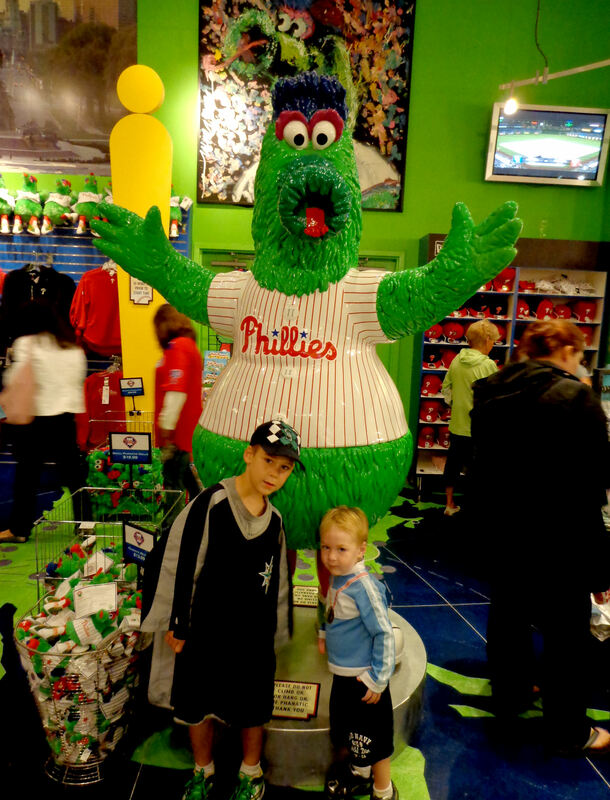 Watch for her later in this entry where you can find her wearing Phillies gear. She is a full-on pre-teen, female ballhawk with Hamplesque focus and determination and she would prove to be Harrison’s main competition the rest of the night, in very entertaining fashion, in my opinion). I was pretty amazed that he tossed us this baseball (completely unsolicited) because there were several teenagers to our left wearing (actual) Rockies gear. 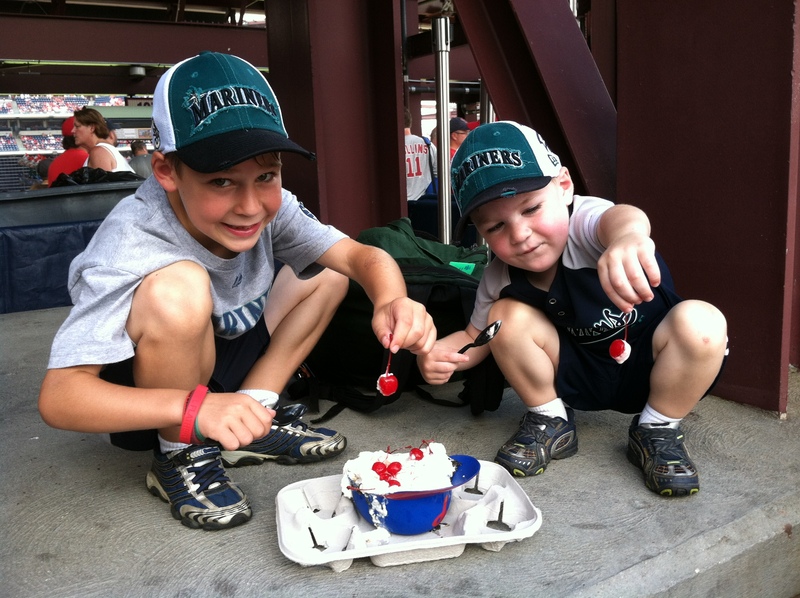 But, what can I say, ball players generally love awesome like boys like Tim and Kellan. Every other Rockies pitcher took his baseball with him back to the dugout. 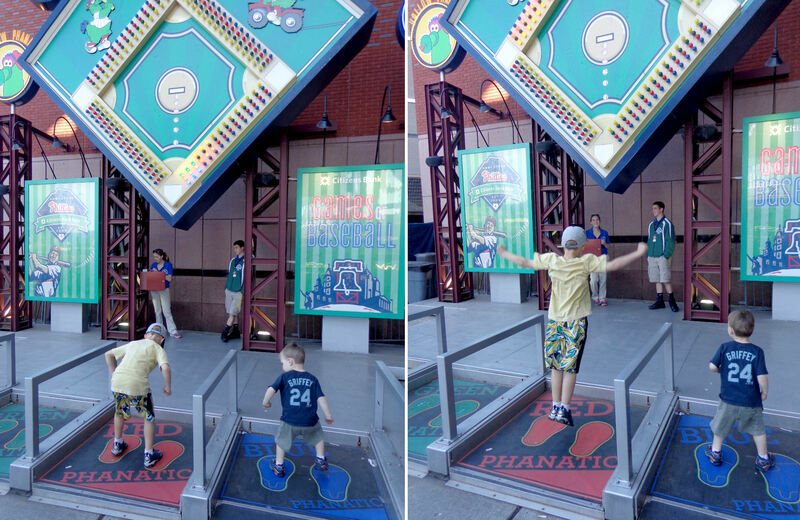 There was a grand total of two pre-game throwing Rockies toss-ups and both of them were tossed to us. And that means that Harrison got snubbed. Sorry, Harrison! I’m not sure why they don’t have one of these in RF too. They are a great idea because they look nice when they flower and they prevent fans from interfering with questionable homeruns. 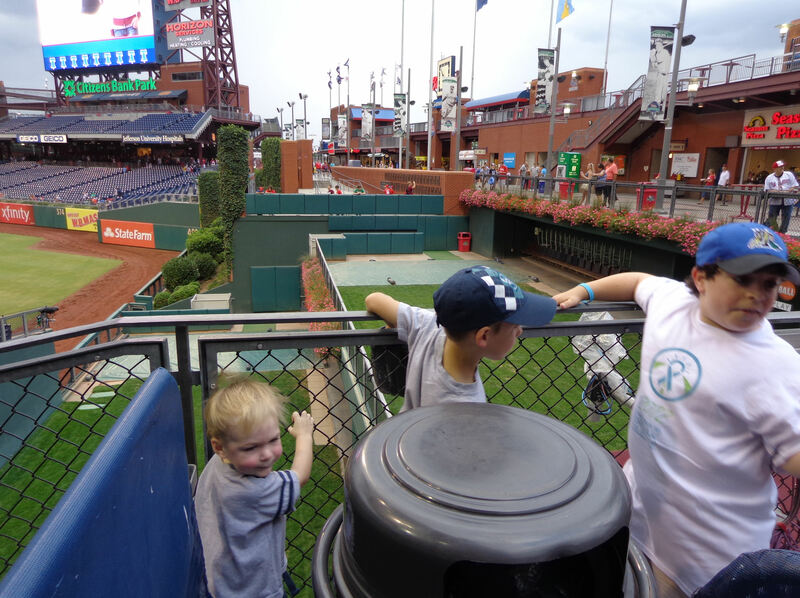 I told Harrison that I thought I had spotted a baseball in the back corner of the Phillies bullpen. 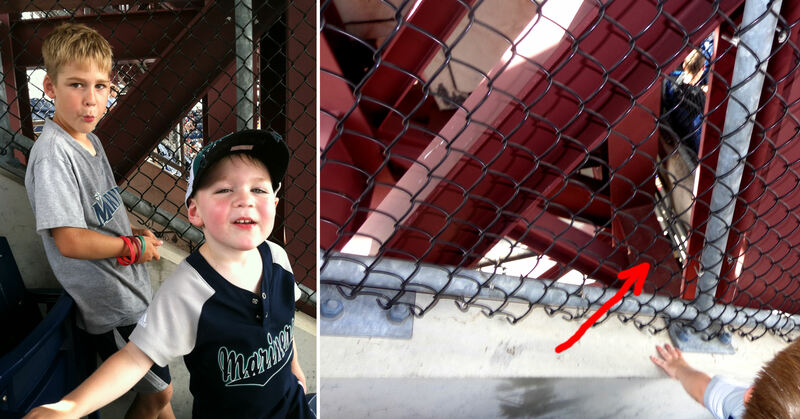 In the picture above, if it was really a baseball, it would have been right below Tim (about 20 feet below) on the other side of the fence. When we looked over the fence, we couldn’t see anything. 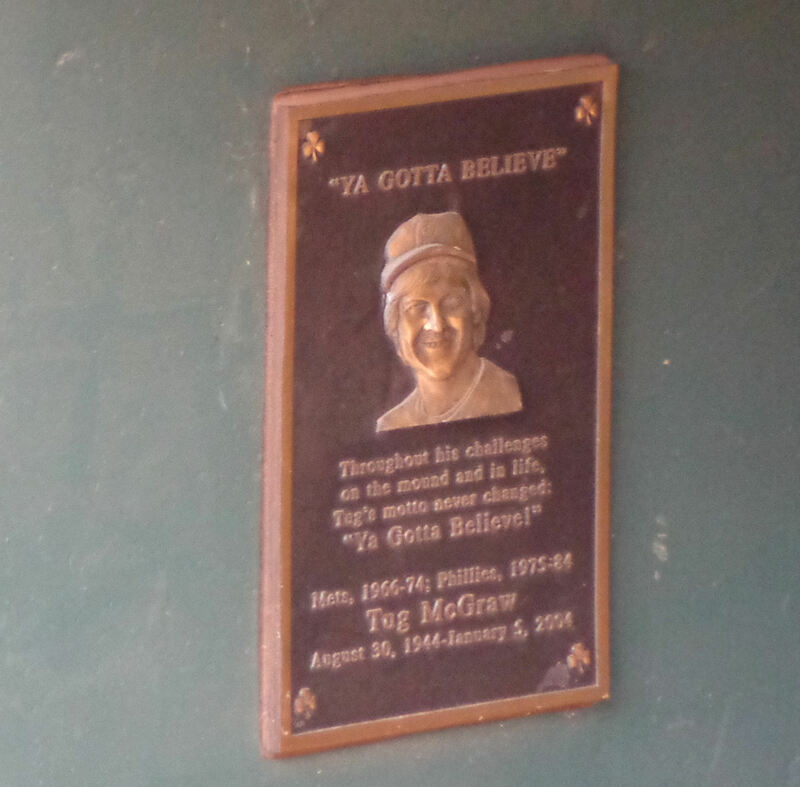 …, there it was tucked under the padding on the back/side wall of the bullpen. It was right behind the home plates . 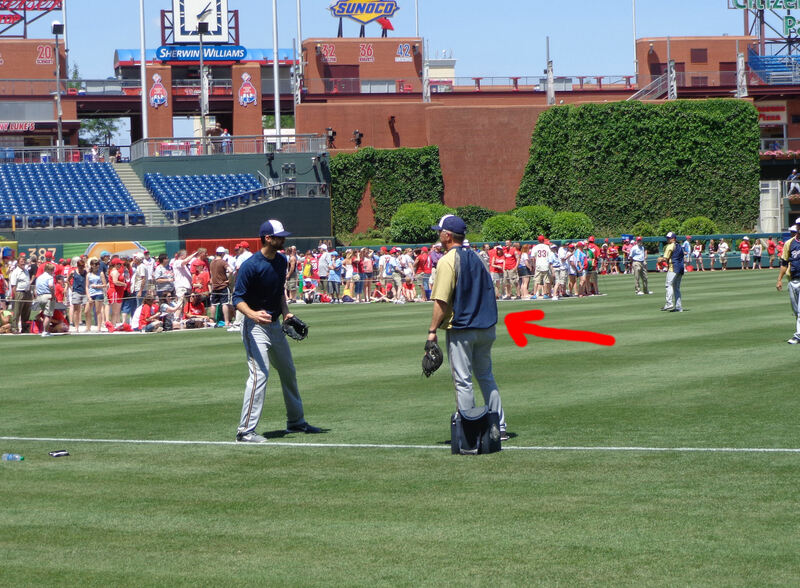 It must have trickled by one of the catchers while a Phillies pitcher was warming up in the bullpen. 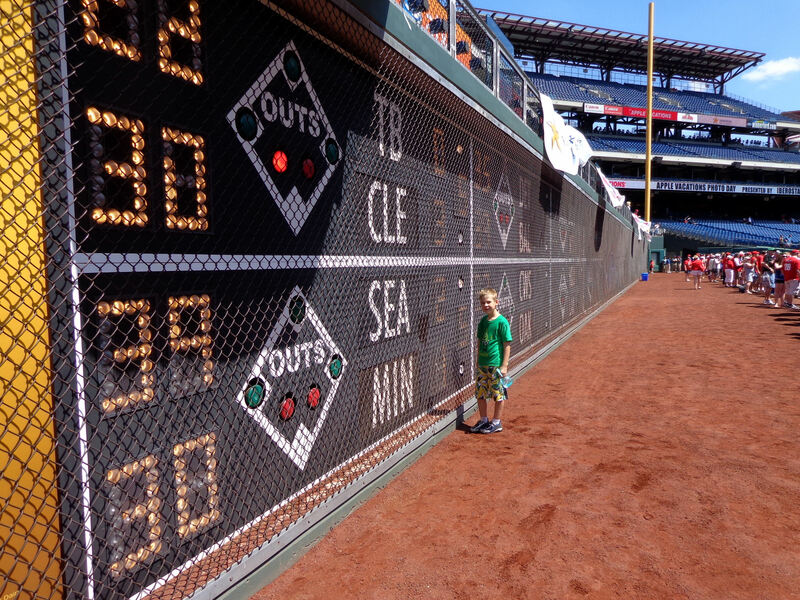 Since we already had two baseballs, we were really hoping that Harrison could manage to get his hands on that baseball in the bullpen, or the one on the RF grass. Remember that one in RF that the Rockies pitcher had thrown? Well, it was still there. There was no one on the field. We just sat around chatting awhile. It was clear that he was going to toss the baseball to Harrison. I was happy for him. But then Harrison started walking closer to RF. “No, no, no! !,” I thought to myself. See the girl in the red shirt above? That’s the same girl who was wearing purple in LF. Harrison walked down and stood right next to her because she was directly in front of the baseball. I am positive that the guy would have grabbed the ball and walked down to Harrison closer to CF to toss it to him with zero competition because Harrison is the one who asked the groundskeeper to toss up the baseball. But when the groundskeeper tossed it up to Harrison (standing next to that girl), it flew too high and went right over both of them into the second row. And guess who got it in the scramble? 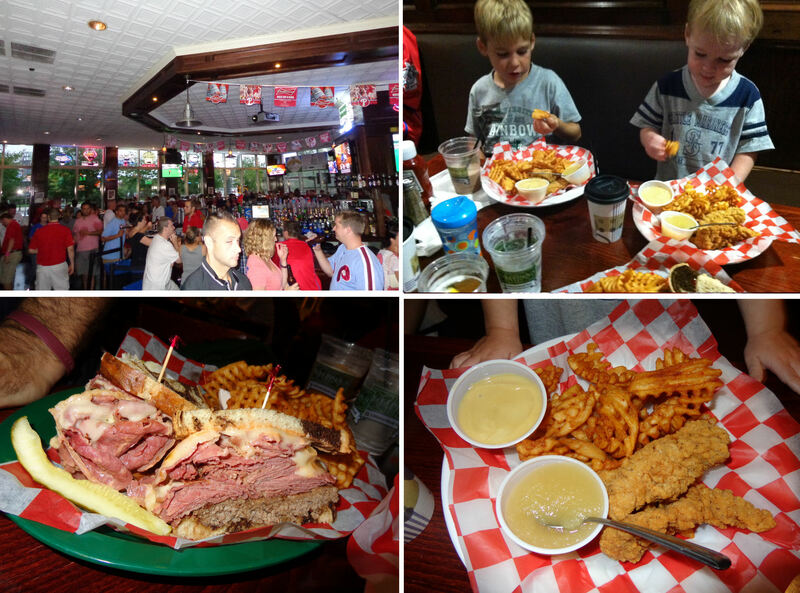 That thing I got (bottom left above) was called “The Big Leaguer” or the “Major Leaguer” and, oh, boy, it was a lot of food. It was essentially a Rueben and a burger combined. Not my healthiest meal ever, but quite tasty. 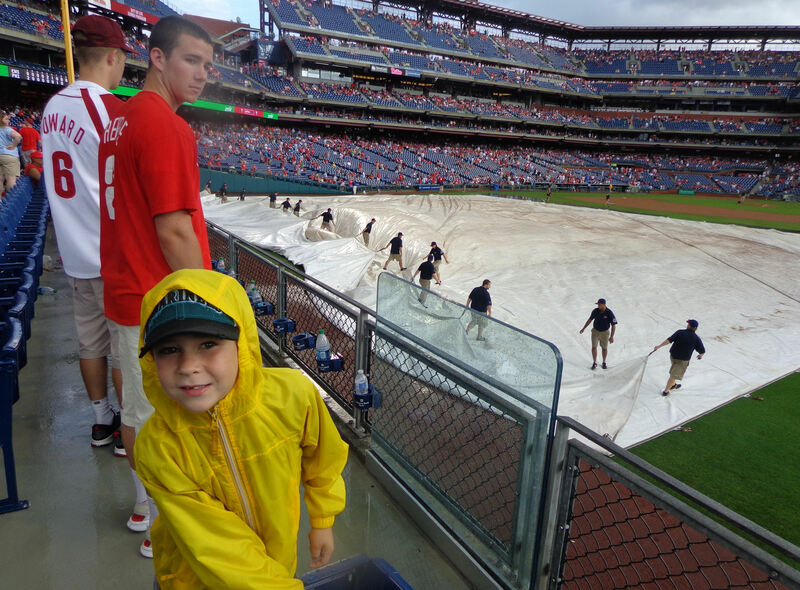 It wasn’t raining like crazy, but there didn’t appear to be any baseball in our immediate future. …an usher was standing and leaning against the SRO counter sleep-standing. Before I could snap her picture, she sat down slept some more. 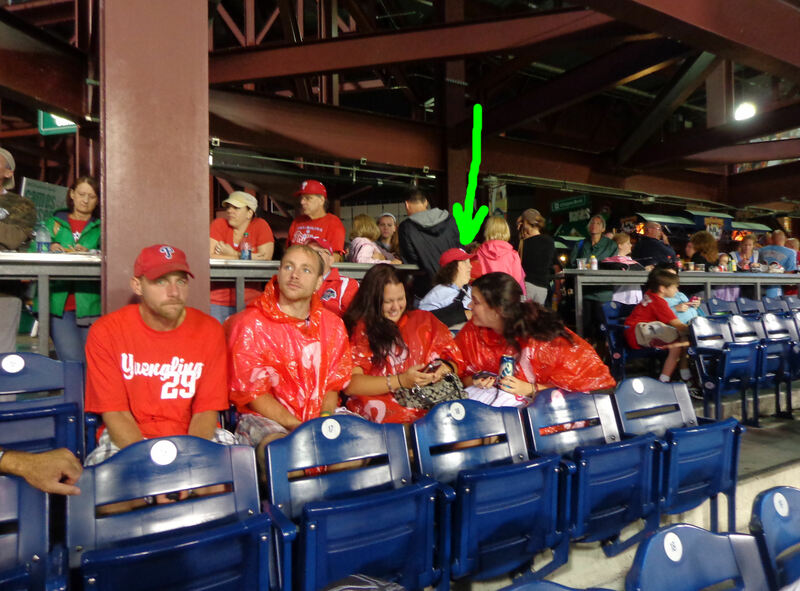 I should mention, as we sat in those seats under cover for hours, the young girl in the purple/red, was in constant movement circling the bullpen, looking at that baseball against the wall from every angle, and hoping and praying someone would come out and toss it to her. It was pretty hilarious. Meanwhile, Harrison was playing it cool waiting for his opportunity to get his hands on that baseball. It was a lot of fun, but nothing came of it. 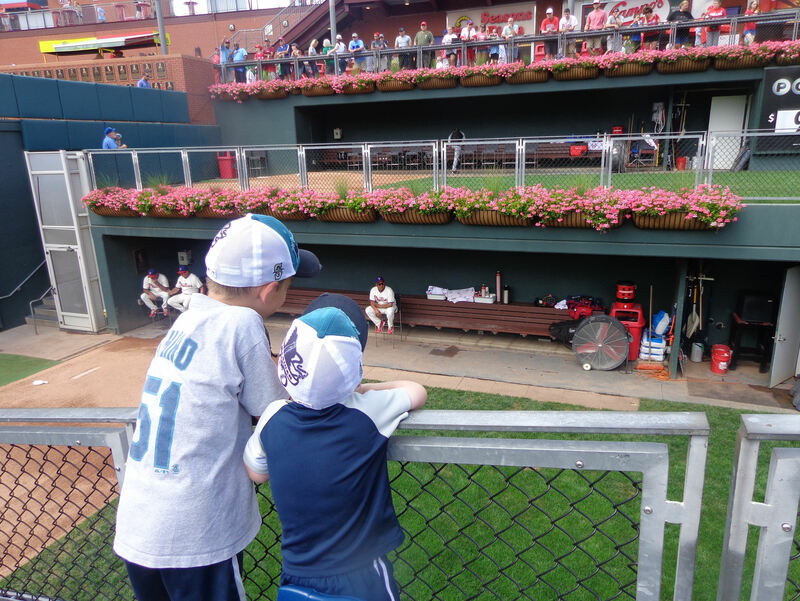 A couple groundskeepers worked on the mound a bit, but they were busy and had no interested in walking to the other end of the bullpen to grab that baseball for Harrison. The groundskeepers never took the tarp off the field. The Phillies never made any announcements. Time just kept ticking by as we made our way later and later into the baseball-less night. It was nearly 10:00 p.m. by this time. We head been inside the stadium for five-and-a-half hours. 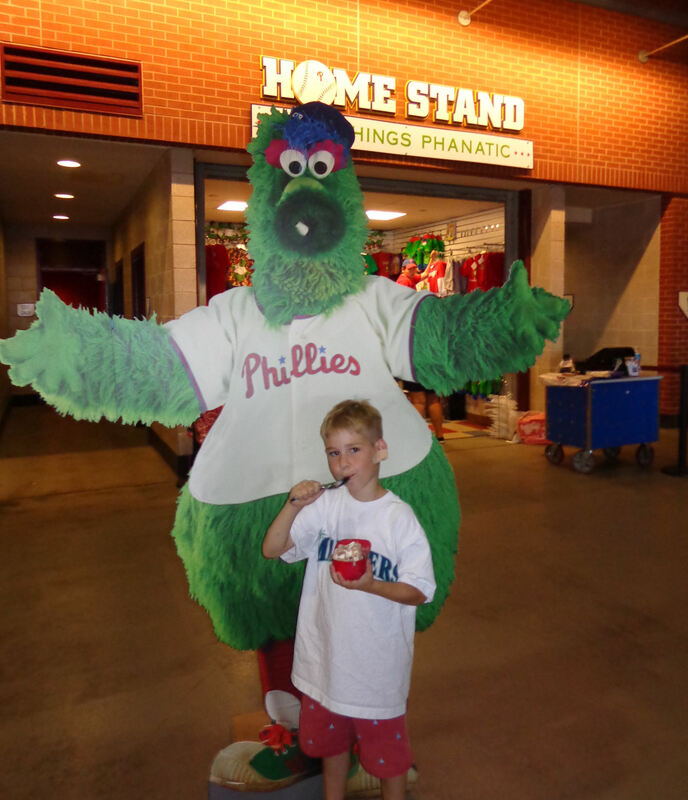 Moments after the picture with the Phanatic statue, the PA announcer announced that the game had been postponed due to rain. 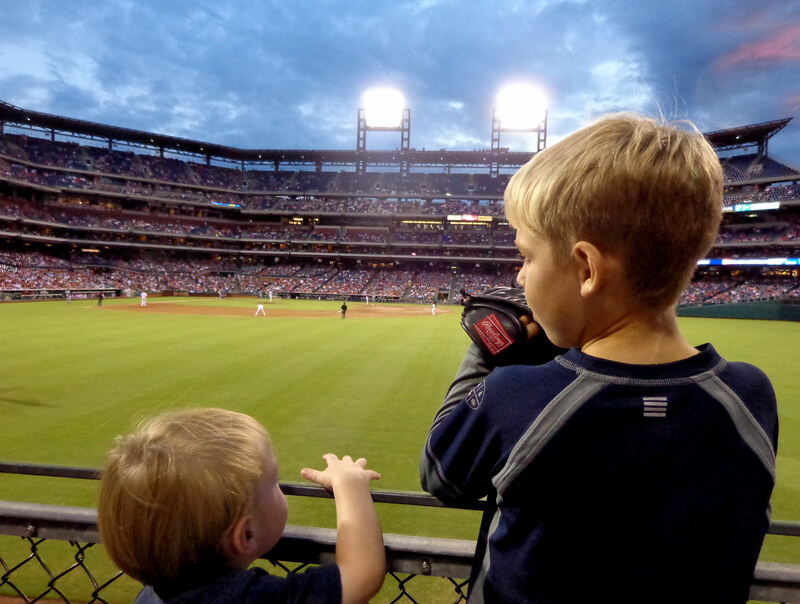 It would be played the next day as the second half of a double-admission doubleheader. We decided we’d waited around so long already that it couldn’t hurt to wait around for a couple minutes more. After the guy stopped to chat with that other guy in the blue rain jacket, guess where he walked? 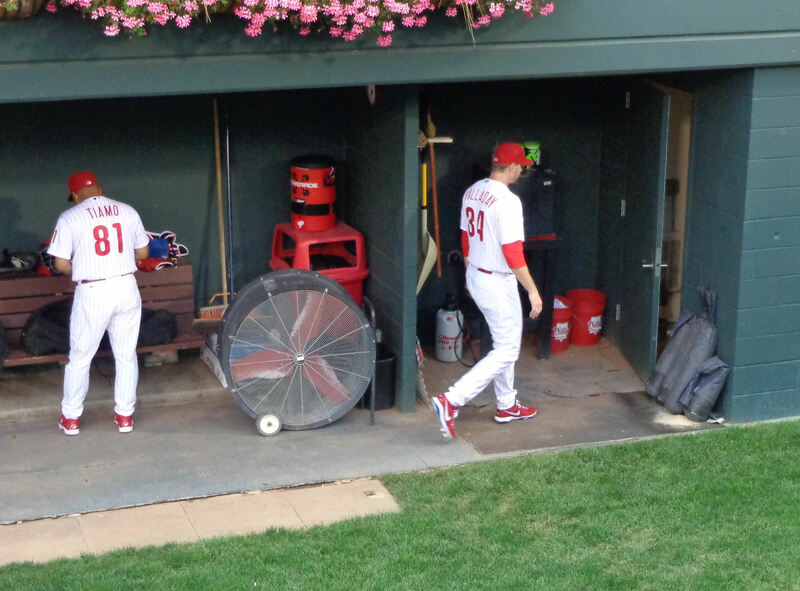 That’s right, right to the Phillies bullpen. 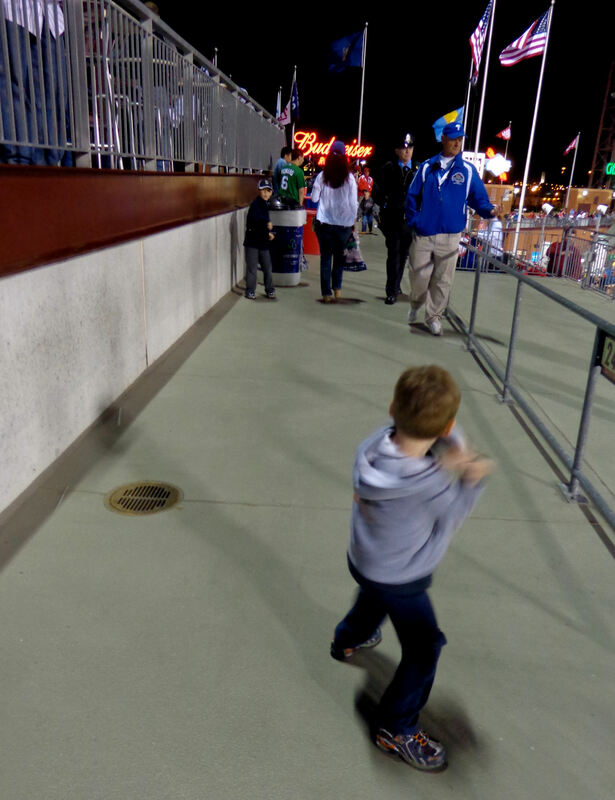 …he ran over to the corner and grabbed that elusive baseball and tossed it up to us. Holy cow. I couldn’t believe it. And as they were posing, we heard a yell from below. 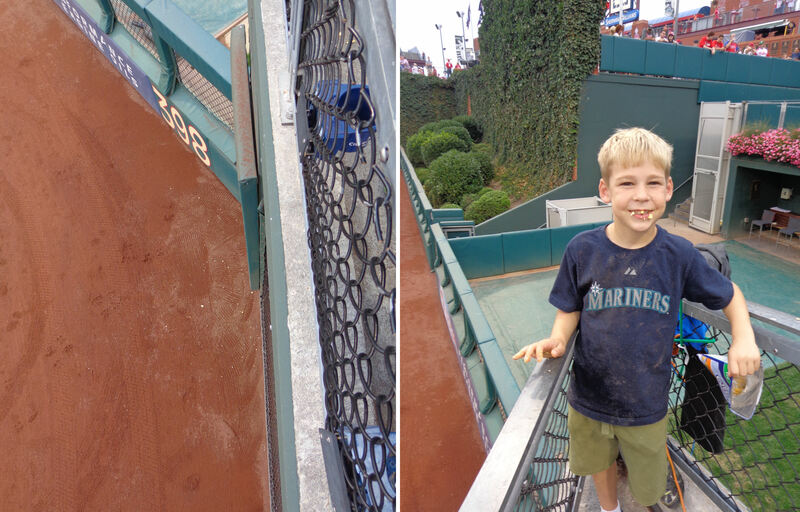 I looked down into the bullpen and it was the ballboy. 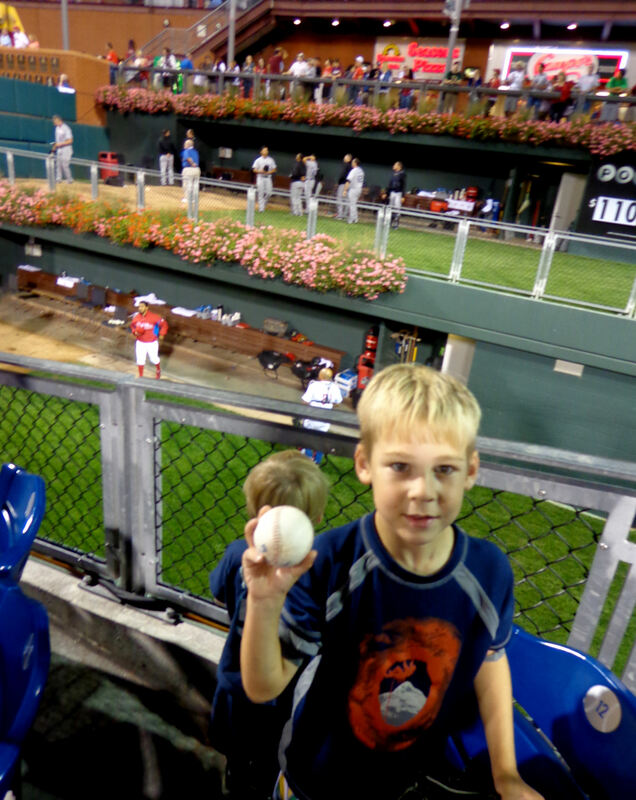 He had found another, completely dry, baseball on the bullpen bench (or maybe sitting on one of the chairs), and he tossed it up to us too. By the way, the ball has dried out just fine. And with that, we called it a night. On the rainy drive home, we discussed whether we should make the trip back to Philadelphia the next day for the make-up of this “game.” Tim was all for it. We didn’t have any other plans. 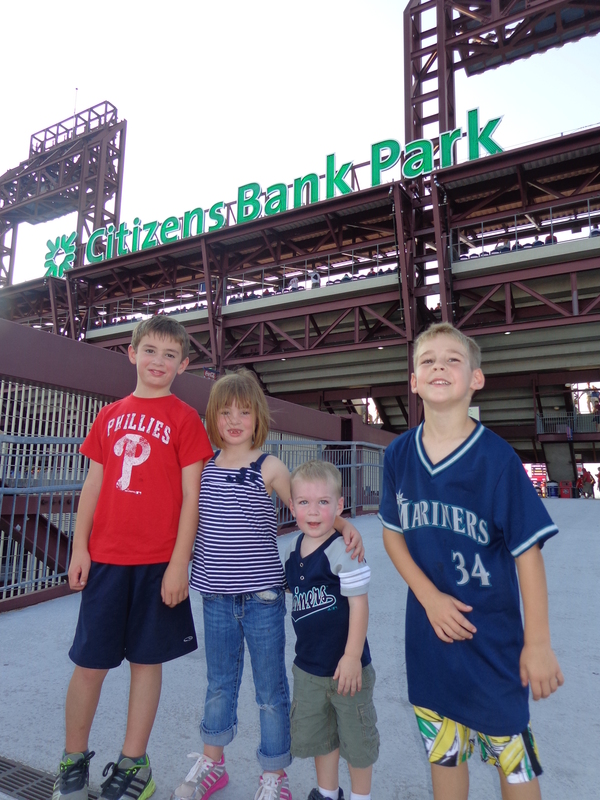 So…..on September 9, 2012, we made our way back down to Philadelphia hoping to see a baseball game. There was a 1 o’clock game. Our game was supposed to start at 6 p.m., and the gates were supposed to start at 5 o’clock. 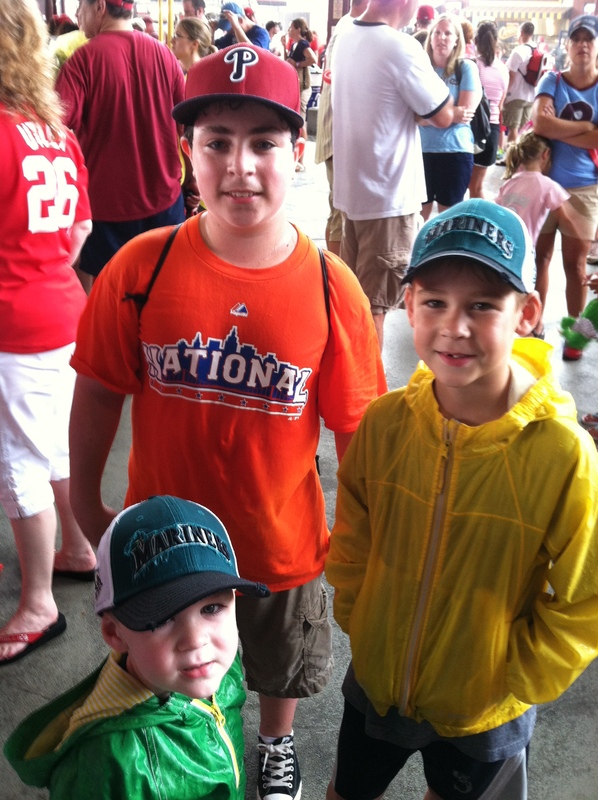 We went to another rain out in 2009 at Nationals Park and it was a nightmare trying to work with the Nationals to figure out how the make-up game would work. 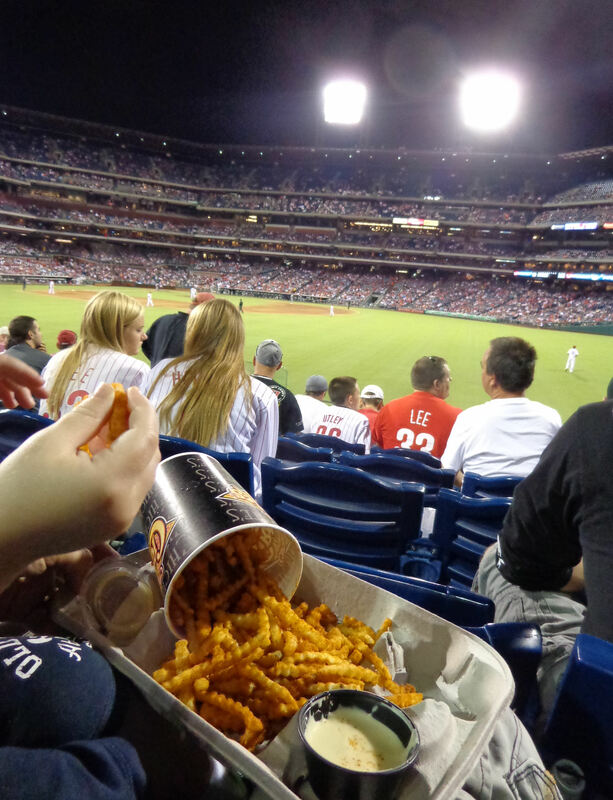 But it was completely different with Phillies. 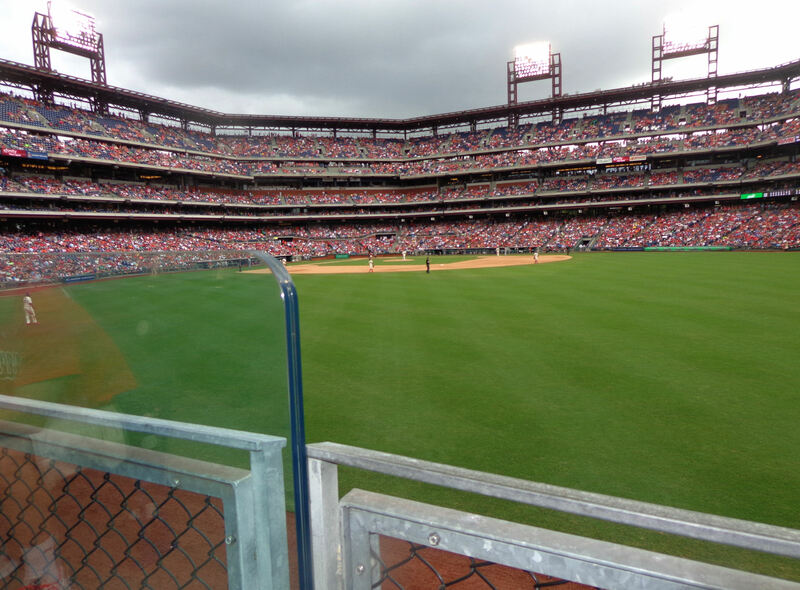 I called the Phillies in the morning to see if we could exchange our tickets for better seats. I was hoping for something in the front row in the outfield. They told us we could exchange tickets at the first base ticket office. So we planned to arrive around 4:30 p.m. to work out an exchange. It took some work, but he managed to get us into the parking lot. We were able to exchange our tickets in row 14 of section 104 for two tickets in the first row of section 103. I was pretty excited about that. 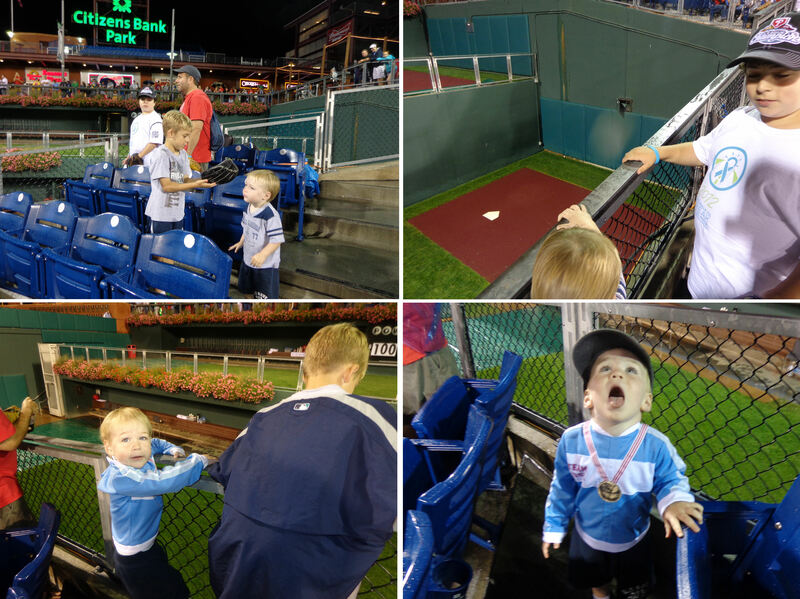 We had never had front row seats at Citizens Bank Park. We had plenty of time to kill before the gates opened. Since I knew there would be no BP and no early BP gate opening time for the LF gates, we decided to switch things up and get in line at the 1B gates right by the ticket office. But then they made us wait 10-15 minutes more before they finally let people inside the stadium. Luckily, we had lots of practice sitting in the seats and relaxing from the night before, so we were pretty good at it! 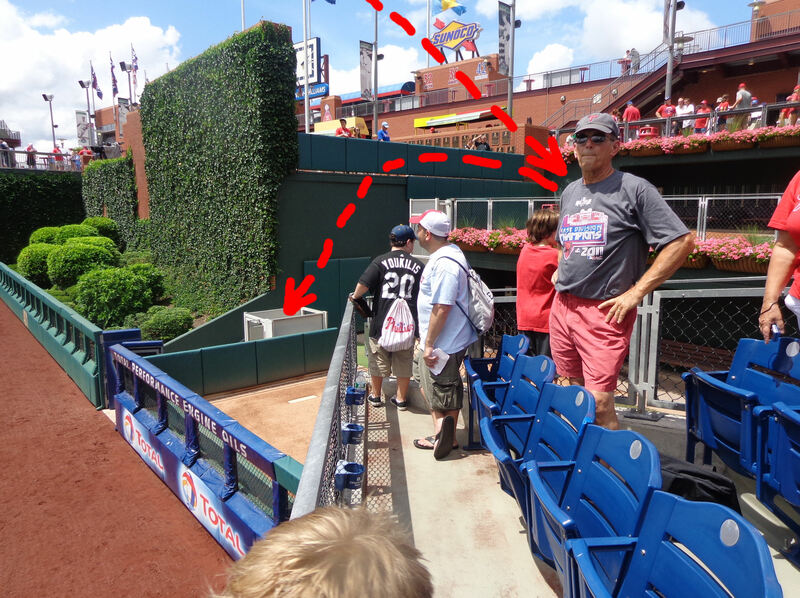 …and Phillies bullpen catcher Jesus Tiamo followed not too far behind. 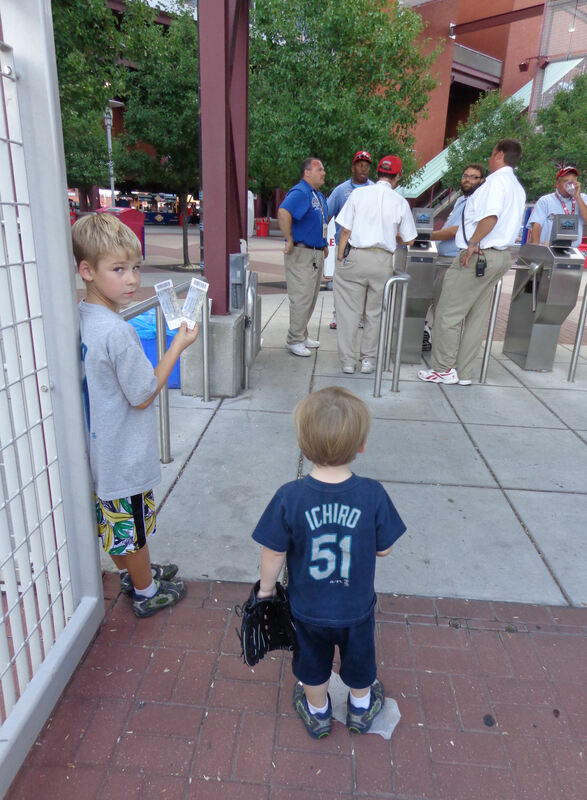 …before he turned around again and tossed probably five baseballs into the stands. 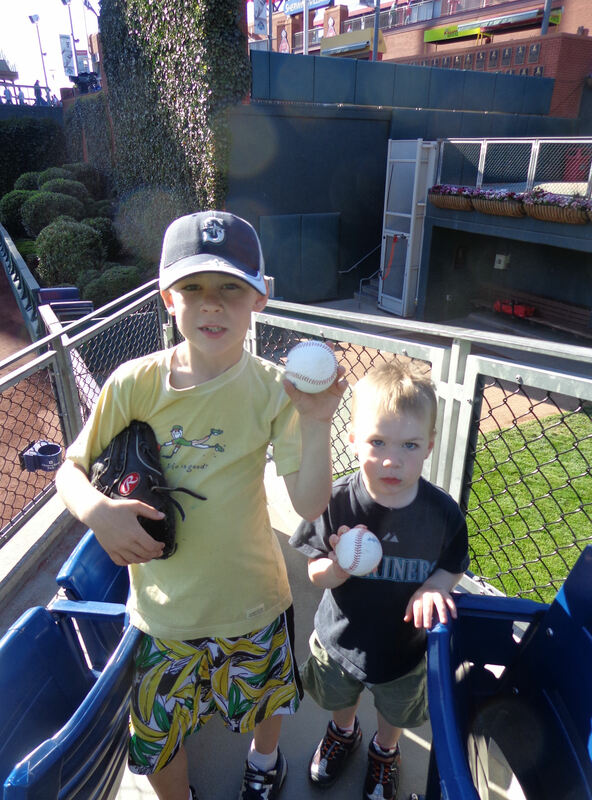 Tim got one, Kellan got one, that same girl from the night before (whose arm you can see as she stands behind Tim in that last picture) got another, plus a few other kids at the other end of the bullpen. …and then they shared the little peanut butter cup. …and collected a few game stamps. The one and only bad thing about the seats is that we were trapped in the middle of a row sitting next to a mom and dad who had two kids that were obviously of ticket-needing age, but didn’t have seats of their own. So we were packed in like sardines down there. Those pictures don’t do it justice. Tim looked and felt like he had been dipped in a huge bowl of melted ice cream. 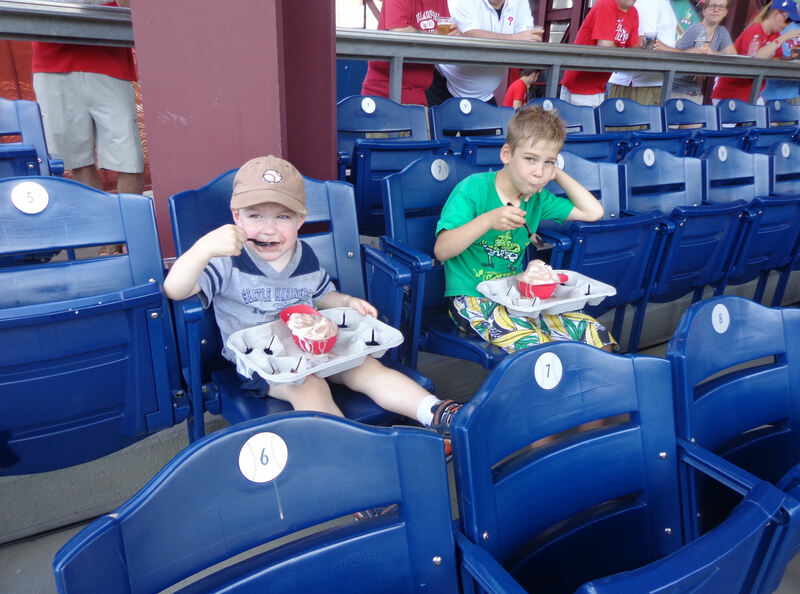 While both boys still manage to make a message while eating an ice cream helmet, the ice cream helmets really help cut down on the mess. Just before Brown’s strikeout, Ty Wiggington hit a double. Immediately after Brown’s strikeout, Michael Martinez hit a single to CF to score Wiggington. …and be right on top of the action. 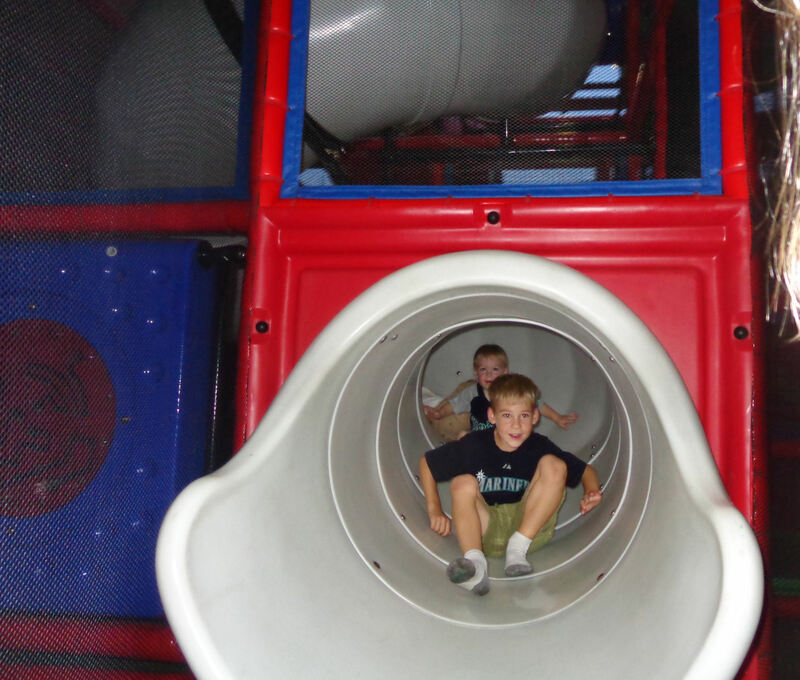 Once again, Tim did a great job chaperoning Kellan through the big kid playarea. If you get enough stamps in your stamp book (they had out a little paper stamp book when you play your first game of the day), you get to cash the stamps in for a prize. 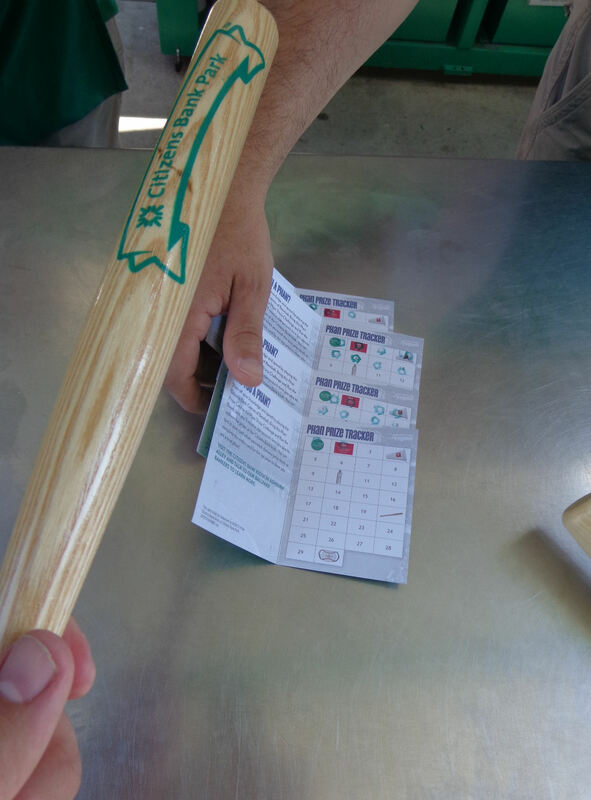 Tim got enough stamps to get a bunch of Citizens Bank Park pencils and that Phillies megaphone shown above to the right. 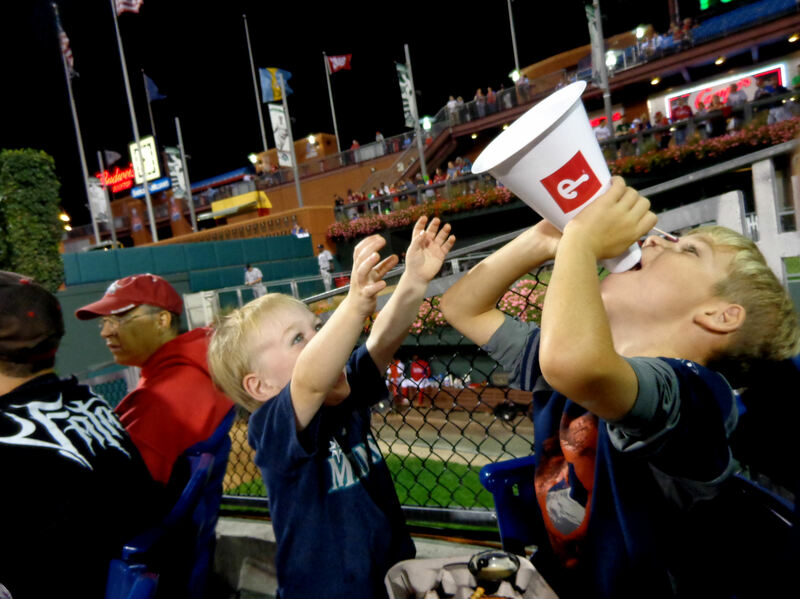 And that megaphone would provide a lot of entertainment over the course of the rest of the game. The fries were super salty with the special seasoning, and they were mighty tasty. 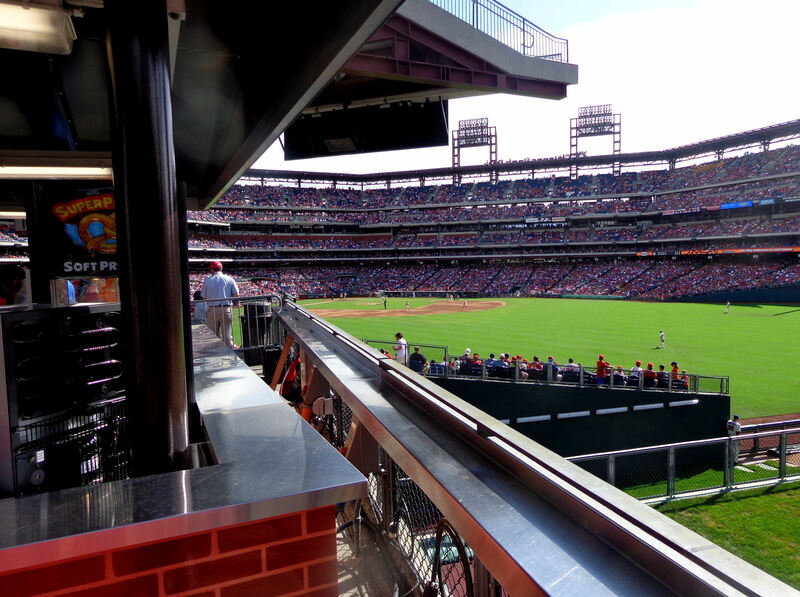 We were in line at Chickie’s & Pete’s when Ryan Howard hit 2-unearned-run-RBI single that hit the RF wall right below our seats. It would have been very exciting had we been sitting in our seats instead of standing in line for fries. 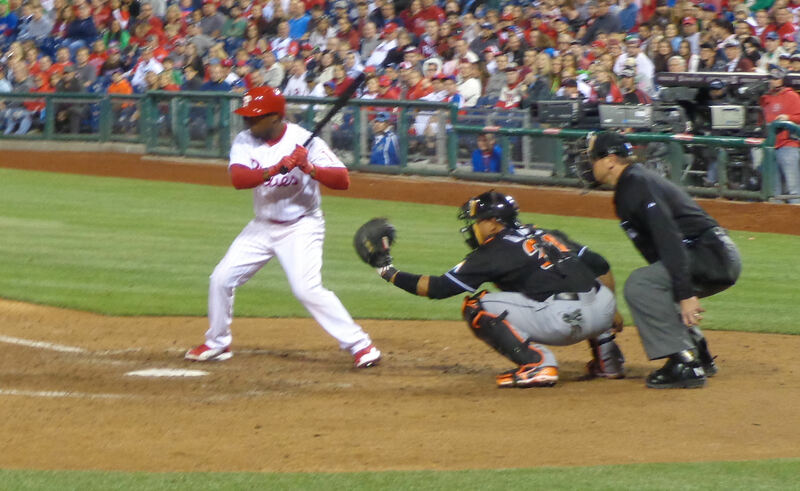 Anyway, Howard was thrown out at second trying to stretch his hit into a double. That ended the inning with the score 4-3 Rockies. Even though our seats were amazingly awesome, we never returned to them. 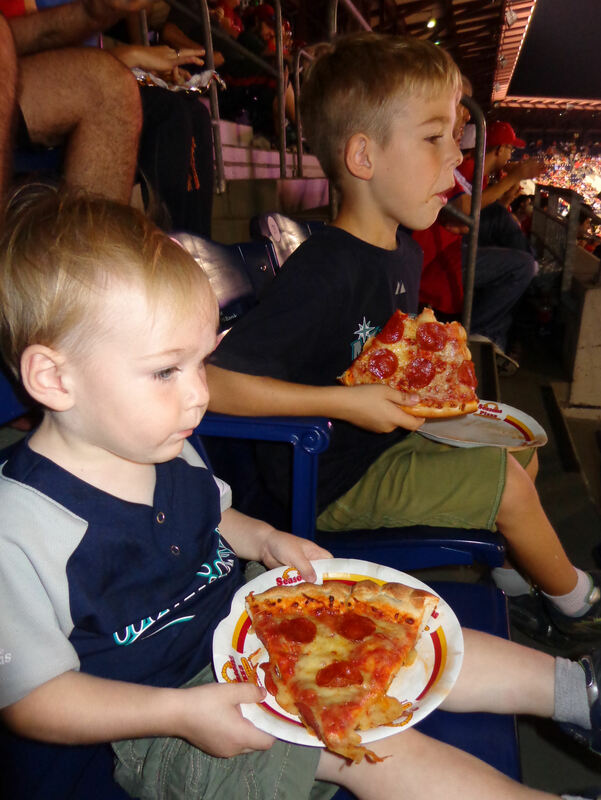 You see, the crowd was thin in the RF seats and this was our first and best opportunity ever to sit in section 101 (or, as we call it, the pizza wedge). 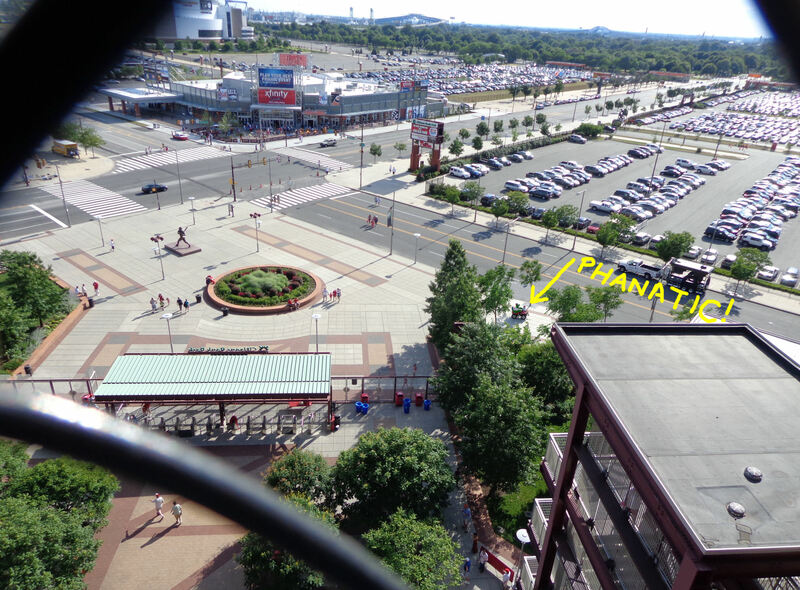 Section 101 is really cool because it is a little pizza wedge shaped peninsula between RCF and the Phillies bullpen. Row 6 is only four seats across. I sat in the first seat in from the aisle, Tim sat in the seats on the fence (on the bullpen) and Kellan primarily sat on my lap, stood next to the fence, or sat in my arms as stood watching the game (including a period of several minutes during which I held Kellan and puffed up my cheeks so he could repeatedly smash my cheeks are hard as he could). It was pretty hilarious. 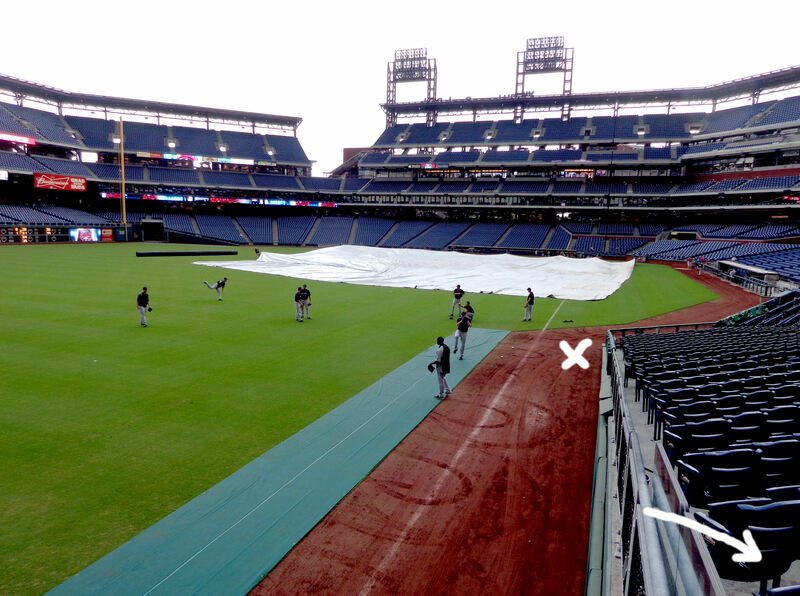 From the home plates in the Phillies bullpen, it is impossible to see anything happening on the field. 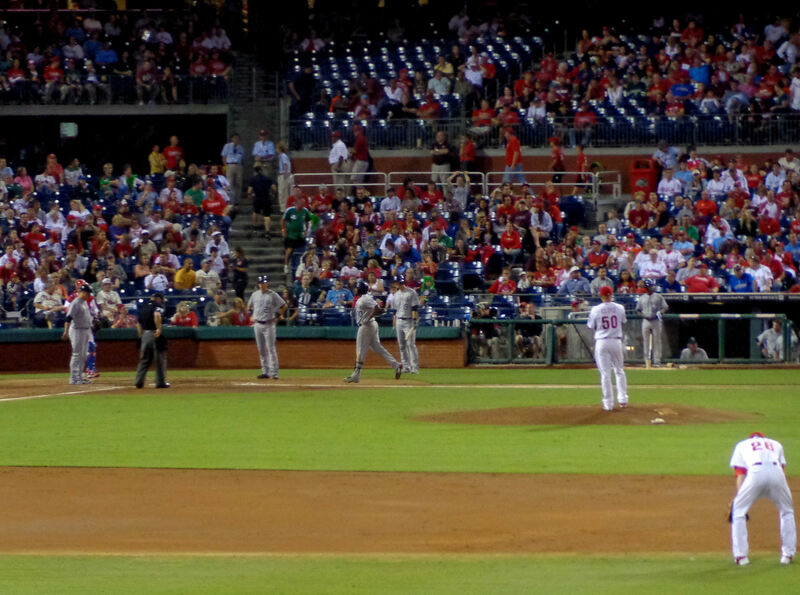 The Phillies used seven pitchers in this game and it seemed like Tiamo was constantly warming up the next reliever. It was pretty hilarious. And, while you might think it would have annoyed Tiamo (as my wife later suggested), that was far from the case. It was really amazing. I am estimating that Jesus waved and smiled at Tim and Kellan at least twenty times. AT LEAST! At times, it seemed like he was waving at them between every pitch he caught in the bullpen. 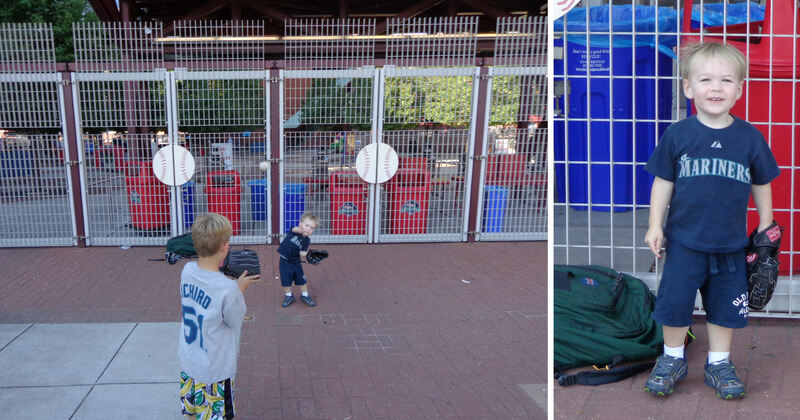 And when Tiamo finished catching Phillipe Aumont in the bottom of the seventh inning (just before the former-Mariner Aumont pitched a 1-2-3 eighth inning for the Phillies), Tiamo tossed Tim Aumont’s warm up baseball. And that resulted in another cool moment. Tiamo’s toss was a high looping lob. I thought it was going to sail over and out of Tim’s reach so I came in behind him to catch the ball for him. But Tim reached up as high as he could and our gloves came together in the air, high above Tim’s head, and Tim came down with the ball in an absolute snow-cone catch. It was pretty awesome! Thanks again and again and again, Jesus! 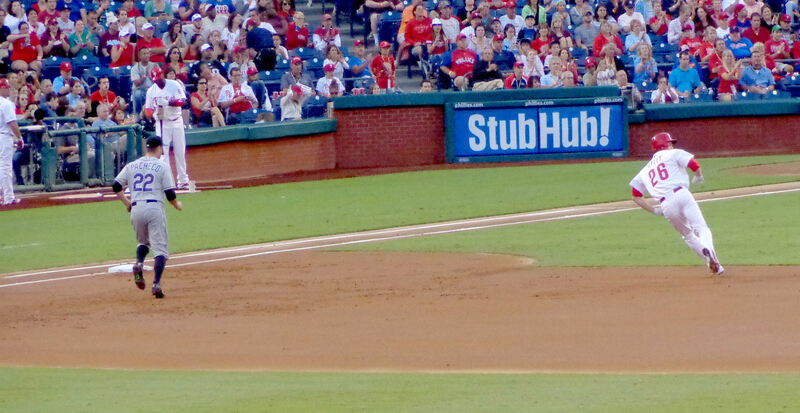 Papelbon was the winning pitcher in the first game of the doubleheader. So he was gunning for a rare 1 win, 1 save day. Papelbon gave up a 2-out souble to Dexter Fowler, but otherwise had no trouble shutting the door on the Rockies. As the team celebrated and the few remaining guys in the bullpen headed out to the field to join in the victory celebration, Jesus Tiamo turned back and gave Tim and Kellan a final smile and wave “good-night!” Jesus and the megaphone definitely made it a unique fun night. Our plans for Saturday, June 23, 2012 changed several times leading up to the day of the game. 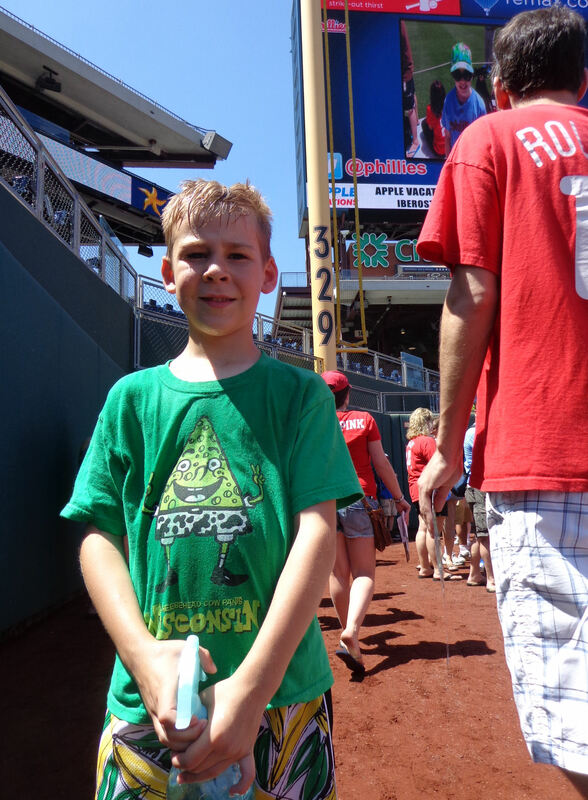 After several years of just me and Tim going to games together, Kellan had been to the last 11 in a row with us. I was thinking it would be good for Tim to get some one-on-one time and do an old school Tim-and-Dad game. 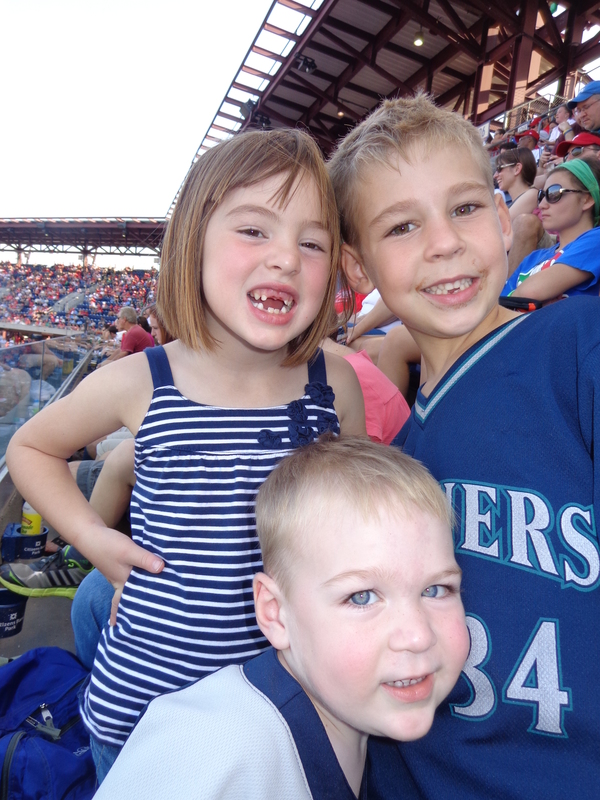 We were going to go to see the Rockies and Phillies mid-week and then bring Kellan with us again to this weekend game. Then Tim got sick. 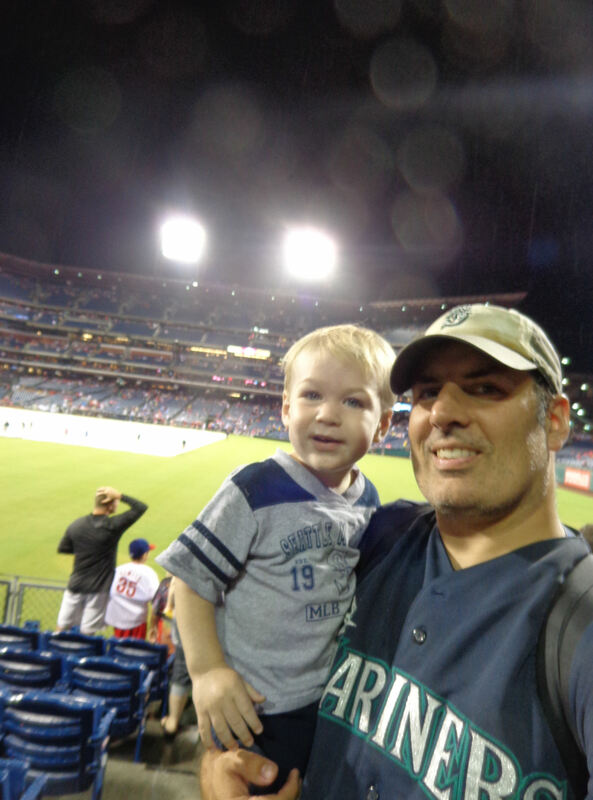 The mid-week game was out and I thought I would just take Kellan to the weekend game. Then Tim gave his germs to Kellan and started feeling better, although he still had the remnants of a rash that went along with his sickness. 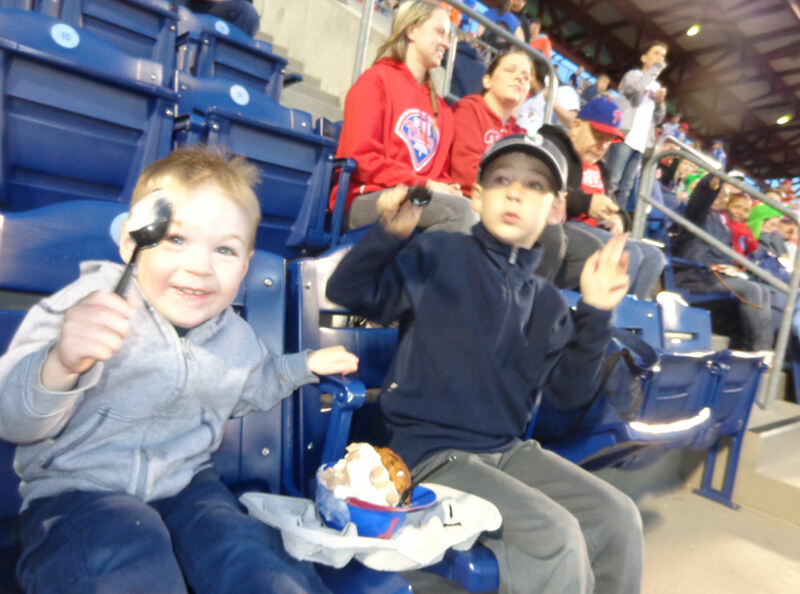 So the final plan was to just take Tim to the weekend game while Kellan stayed home with mommy and rested up and recovered. 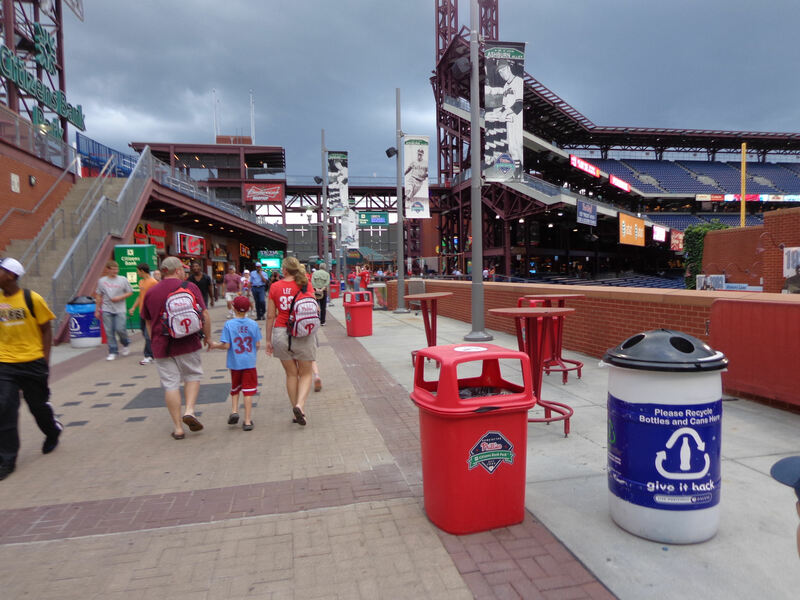 It was interleague play and the Phillies were hosting the Rays in an afternoon game set to start at 4:05 p.m. We headed down in time for the gates to open. We were probably 15-20 people back in one of three lines at the LF gate, but somehow when we stepped down into the LF seats, we were literally the first fans in the OF. It was pretty strange. Probably 45 people beat us into the stadium, but I had no clue where they’d all gone. We ran down to the first row and did two things. First, I asked Juan Pierre if he could toss a baseball to Tim when he eventually got one. He said yes. And he tossed the very next ball he got to us…although, for some reason, he threw it to me instead of Tim. He is doing a little “heart” shape with his hands. Apparently, Justin Bieber does that. Although, I should note that I only know that from watching Jimmy Fallon’s hilarious parody of Bieber. Big thanks to Dan Sauvageau in Denver. He got Tim this shirt for the myGameBalls.com photo scavenger hunt while we were in Denver. But there was no BP the day he gave it to Tim so we didn’t get the picture. 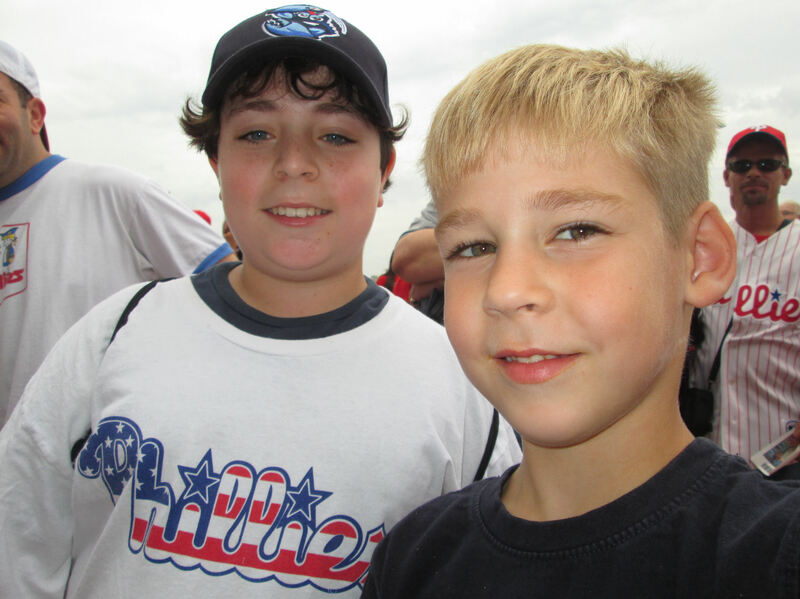 I have carried this shirt to every game since that day and always forgotten to get the picture. To stop that trend, Tim put the Bieber shirt on at home before leaving for this game so we wouldn’t forget again. We covered up that shirt within minutes of getting the picture. 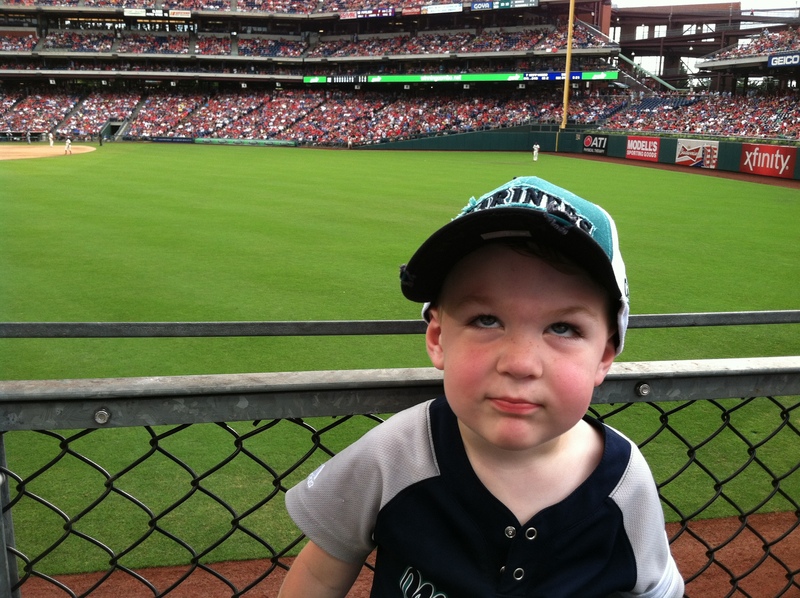 No knock on Kellan, I love going to games with that little guy. But, wow, it is so much easier to do BP (and the entire game) with just me and Tim. For starters, I don’t have to carry Tim at all. After getting the baseball from Juan Pierre and getting the Bieber picture, we headed out to RCF. 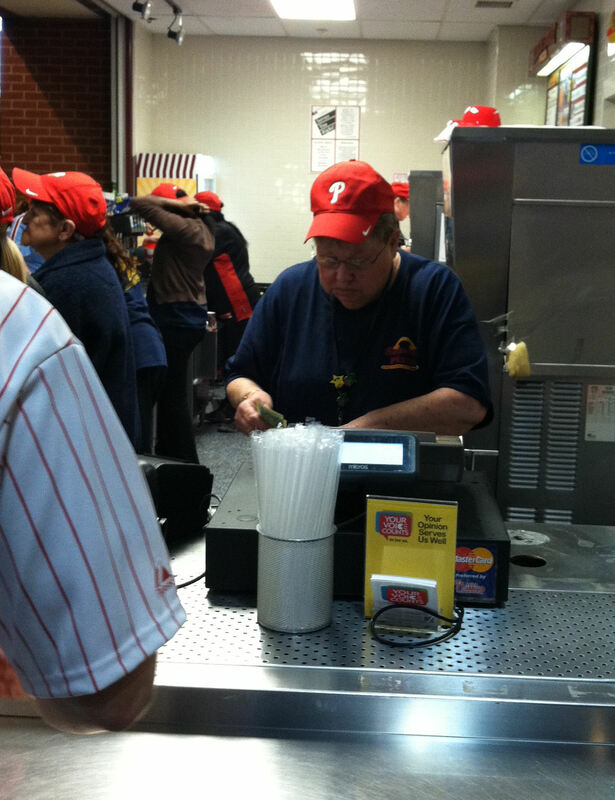 I wanted to see if Michael Stutes was around – frankly, I don’t even know if he is still on the Phils rosters. I didn’t see him. 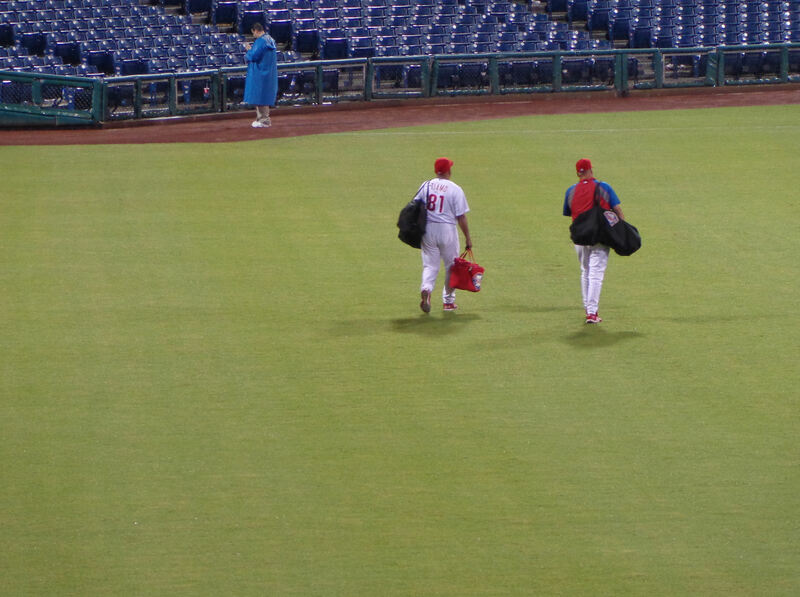 Most of the Phils pitchers were still running in RF. Eventually, Joe Blanton broke off from the pack and walked along the warning track retrieving baseballs that had been hit out there while no one was there to shag them. 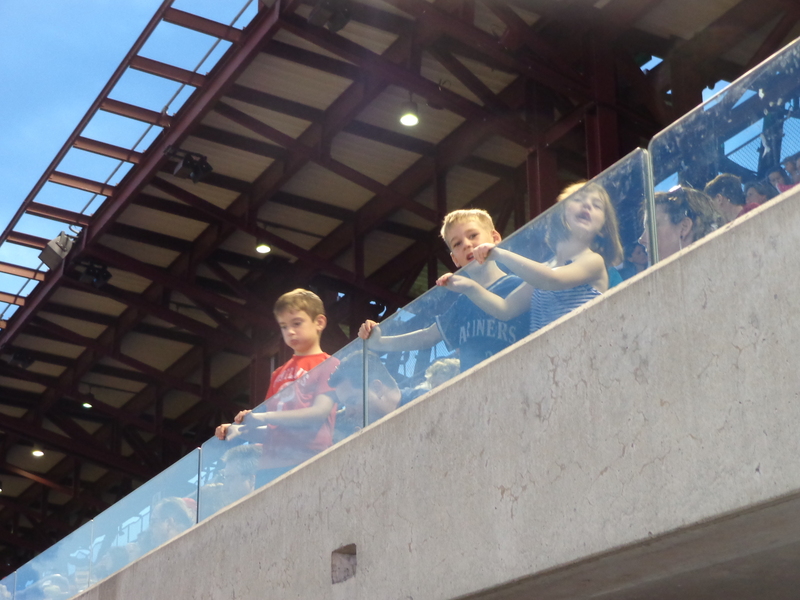 There were 2-3 baseballs on the track directly below us. …and Tim gloved it with no problems. It was time to find some shade. We headed to the back of section 140 where some shade was reaching the seats. 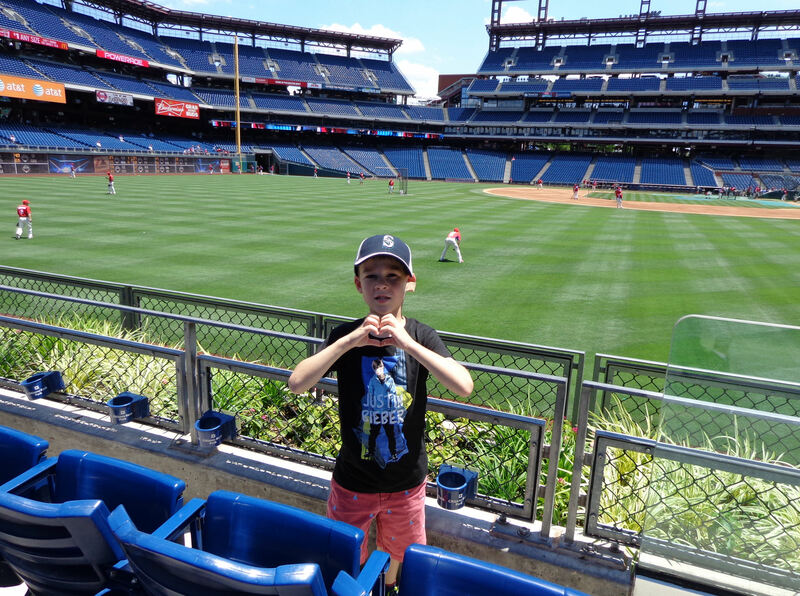 At our last game at Citizens Bank Park, we headed over to section 140 and an usher (who I am told is named Bernie) gave Tim a baseball. Well, as we were a full section away from section 140, I could already tell that the exact same thing was going to happen at this game. Tim LOVES taking pictures. I gave him my old camera to use since I had the new one. And he snap, snap, snapped pictures…until he finished the job of sending that camera to the junk heap. I stood in the aisle next to Tim (sitting in the second seat) and ran around trying to catch a homerun. But nothing came anywhere near us. 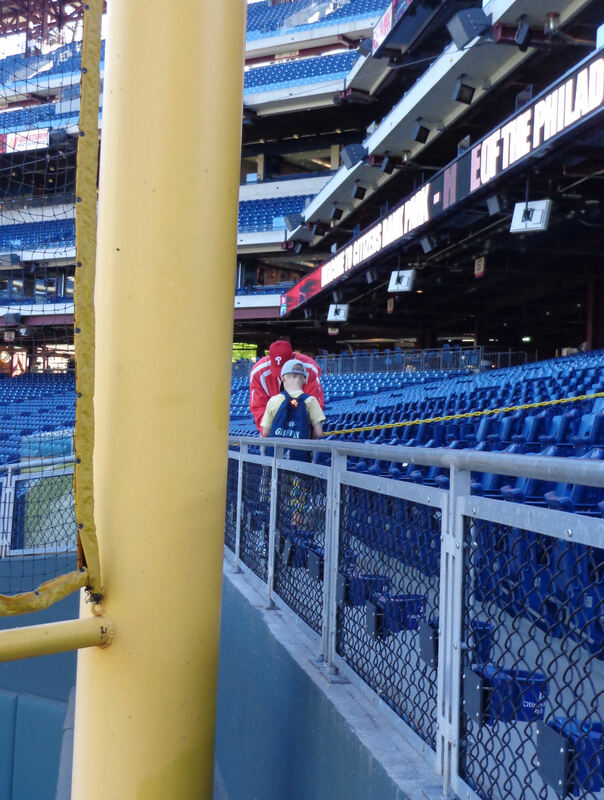 Nothing came near us during the rest of Phillies BP. 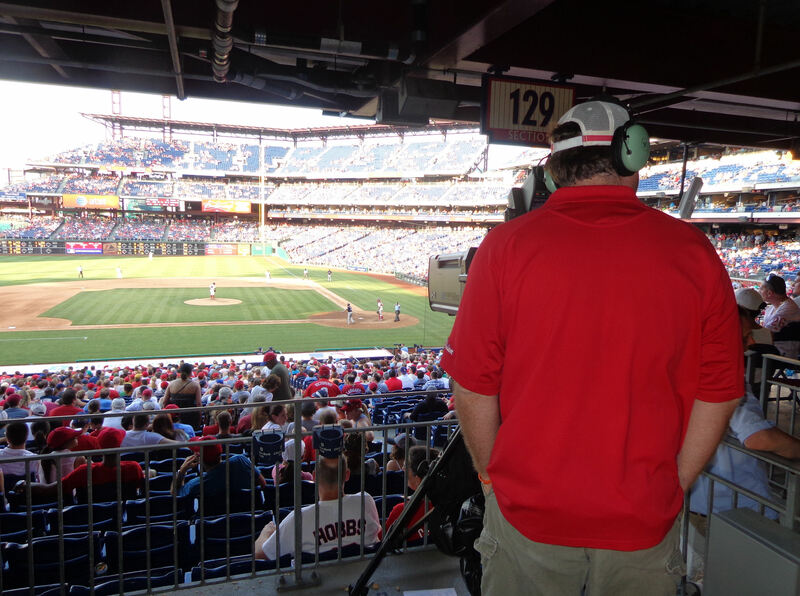 I wondered if it was an MLB Network ballpark cam. 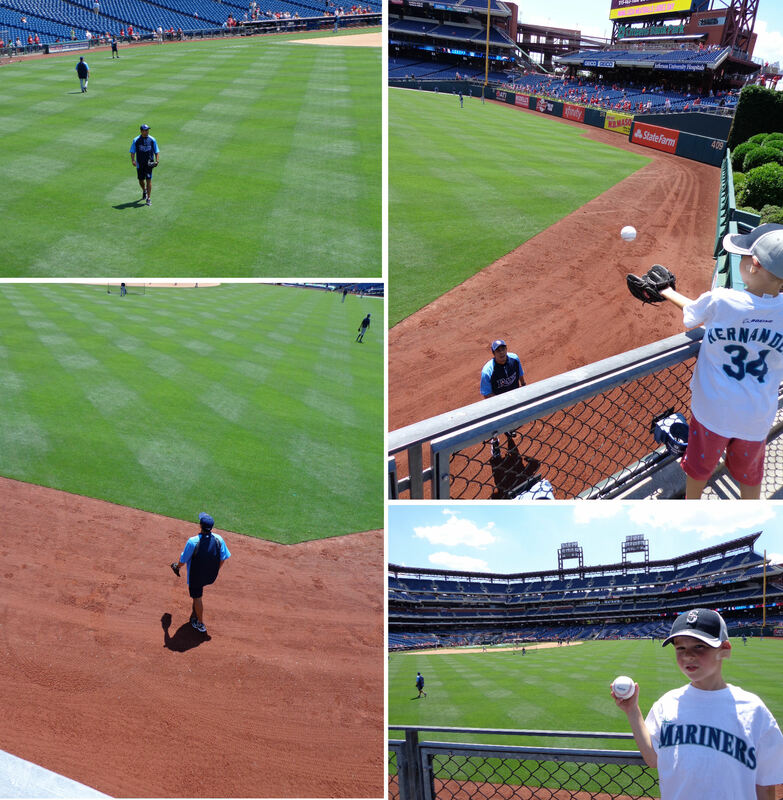 The transition from Phillies BP to Rays BP was odd. The Rays were still stretching by the dugout when the Phils headed to the clubhouse. They just kept stretching and stretching. There was a lot of dead time before the Rays really started hitting. …and one of his hits rolled to a stop directly below Tim (and directly below the “399” sign on the wall). There were zero people in the OF shagging baseballs. I had a feeling that we would end up getting that baseball once the Rays took to the field. 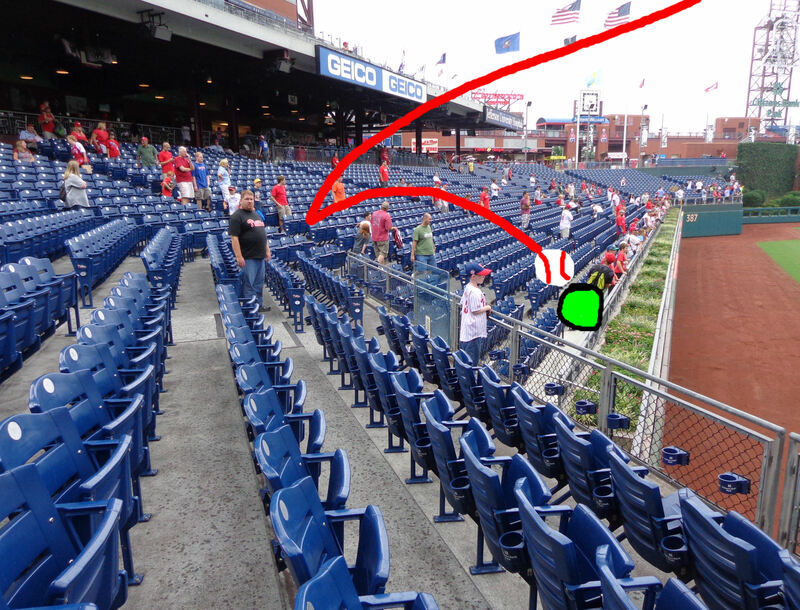 …and tossed the baseball up to Tim. Again, Tim made a nice catch. After getting that baseball from Kahlon, we decided to resume the picture taking and homerun-catch-attempting. We moved over to section 103. Tim sat in the shade toward the back of the section and I stood in the aisle a couple seats down from Tim. …this guy with no glove standing in the aisle completely boxed me out as I tried to walk past him. He didn’t realize he was doing it. The ball was hit to the RF side of the aisle. He moved to that side right as I was trying to pass him. He literally pushed me right into the row and made it so I couldn’t pass. He made no effort to walk down a few rows to make the catch. 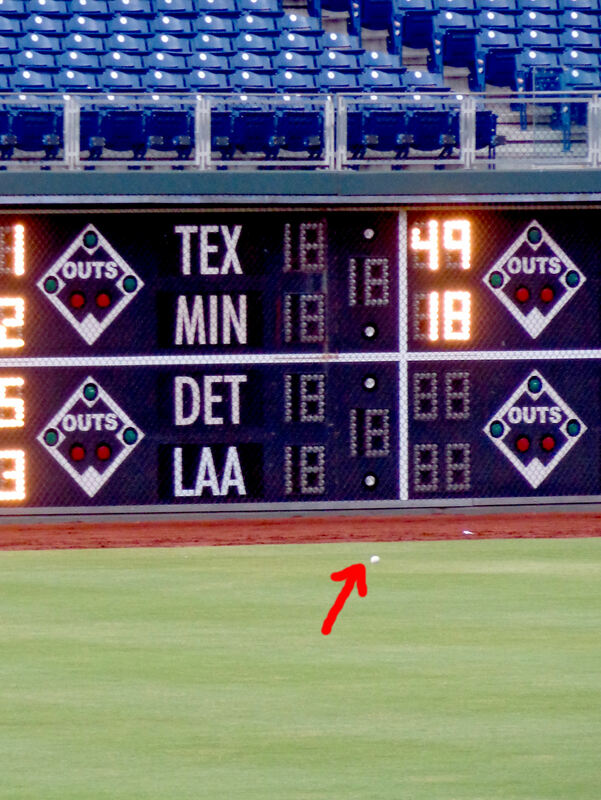 While I was trapped in the row, another fan ran over and caught the ball on the fly. That was my chance. I didn’t come anyway near another homerun. 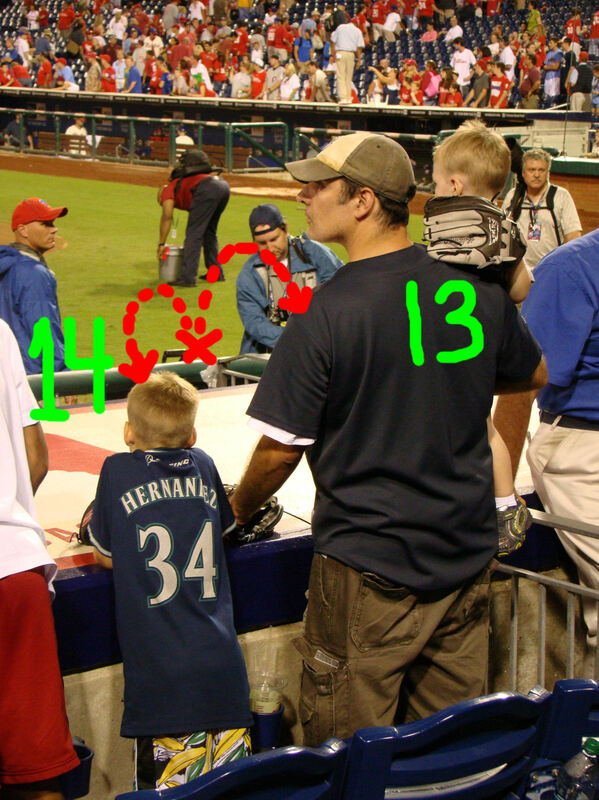 As you can see, we also did a little sub-amateur birding in the bullpen. 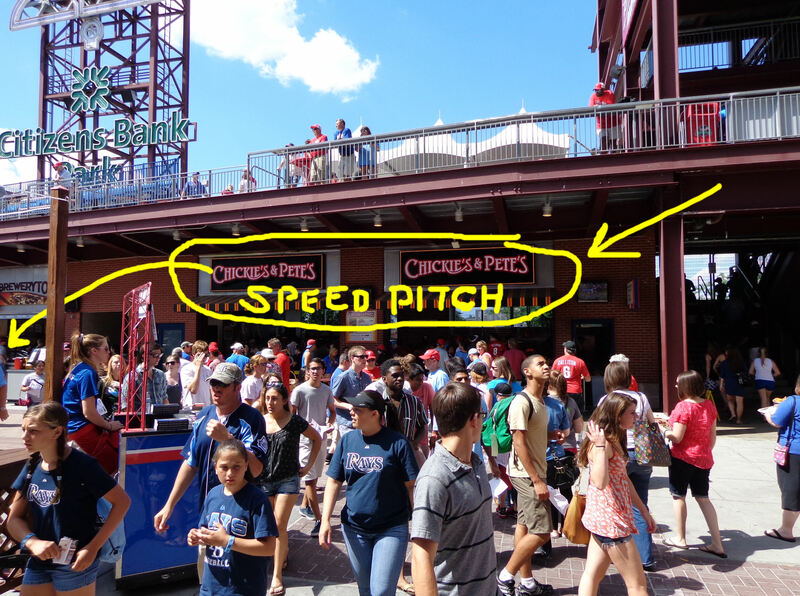 …is gone and a Chickie’s and Pete’s is no in the location of the old speed pitch area. 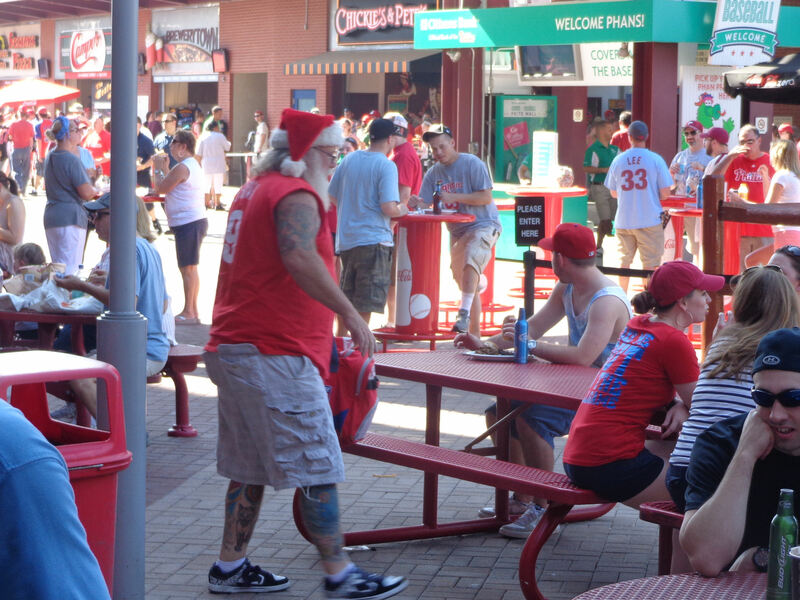 Chickie’s and Pete’s used to be in the concourse above the RF end of the bullpens. This Chickie’s and Pete’s was not here at the first game we went to this season (neither was the speed pitch). It’s too bad. That speed pitch was pretty cool. 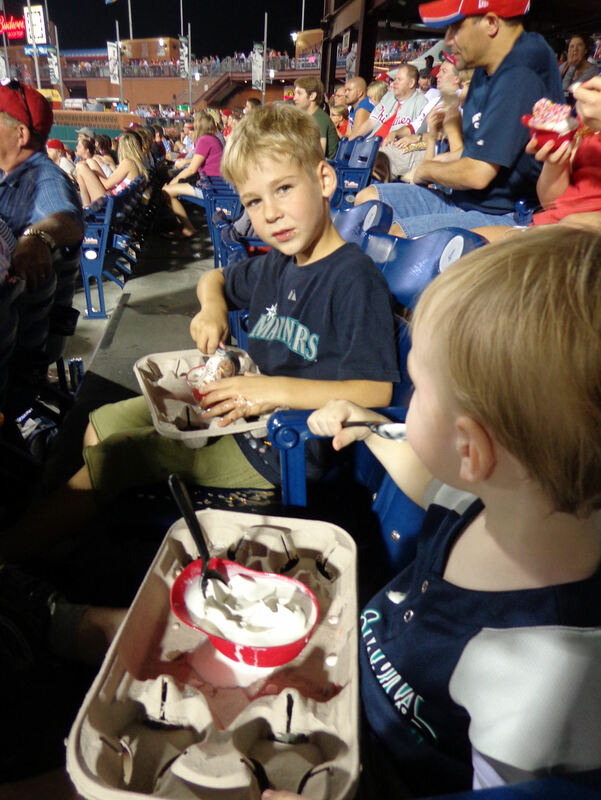 Our original post-BP plan involved getting some pizza and heading to the upper deck above the “pizza wedge.” But then Tim asked if we could pull the old switcheroo – one of his favorite moves of the season – where we get ice cream first and dinner second. So, we just walked around for the time being. I like them both, but I prefer the old-fashioned method. 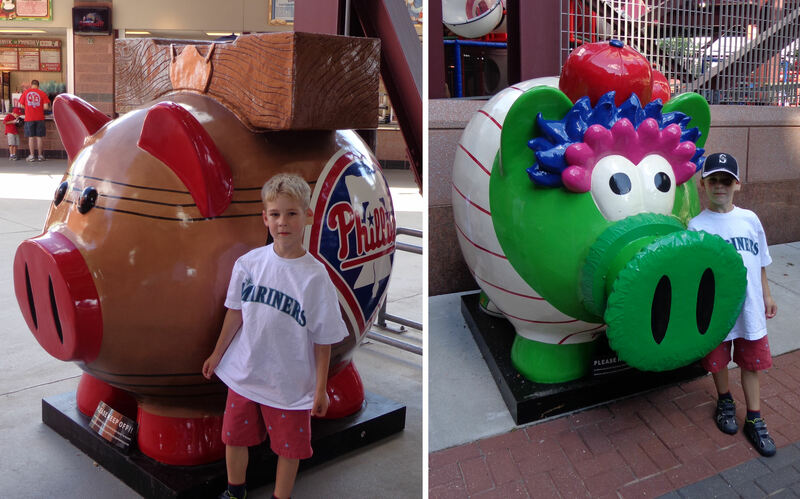 We found the other Phanatic pig (shown out of sequence) down by the kids’ play area during the game. That wall of baseball runs almost all the way from foul pole to foul pole on the Hall of Fame suite level. It is a whole lot of baseballs!!! 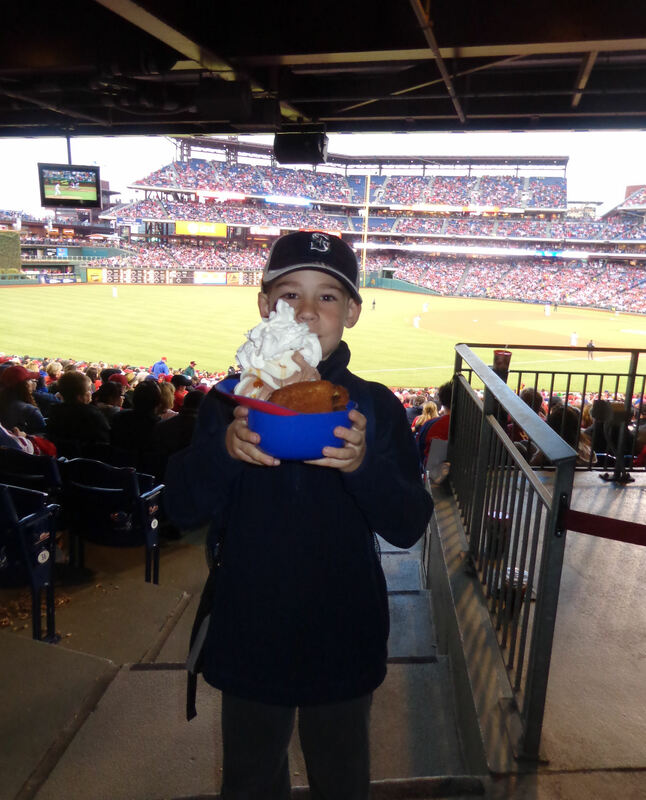 When we reached the field level, we grabbed Tim’s ice cream helmet, exchanged some tickets to a future game, and then walked to our seats for the start of the game. …, I knew we had to find somewhere else to sit. Our seats were awesome. But they just wouldn’t work for Tim. After Tim finished his ice cream, we ditched RF. 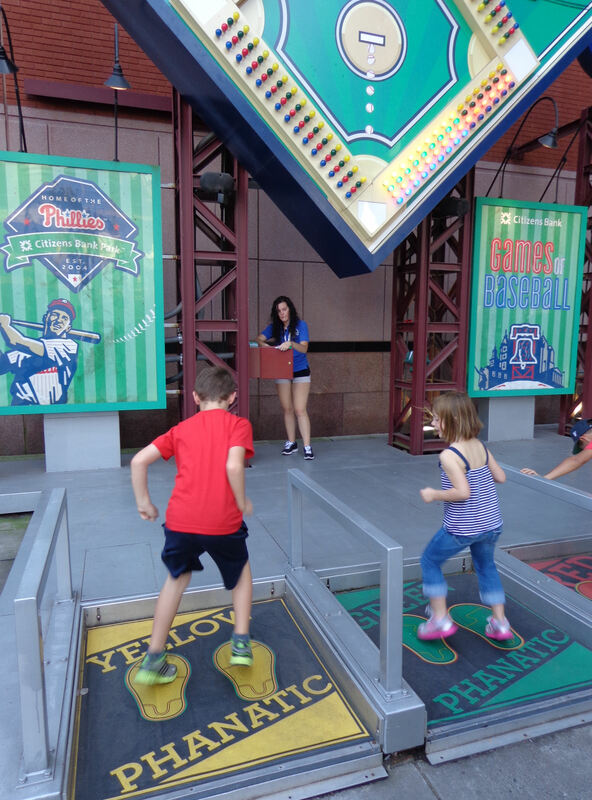 On our way to the upper deck, we stopped by the kids’ play area. While we were there, the Rays scored 3 runs on a Ben Zobrist single, Jose Lobaton walk, Jeff Keppinger 2RBI double, Elliot Johnson walk, and James Shields RBI groundout. 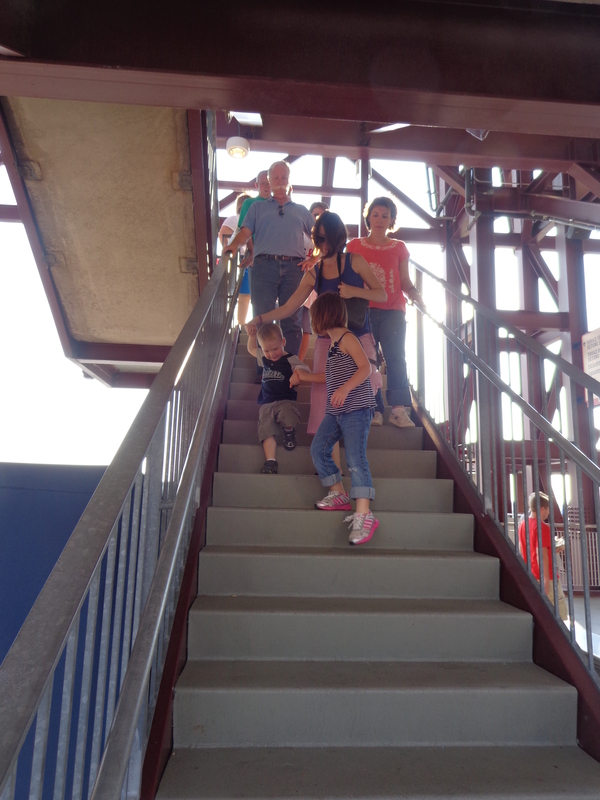 …stood in front of some mist-blowing fans in the second deck, and then headed up to the upper deck. …the High & Inside Pub. 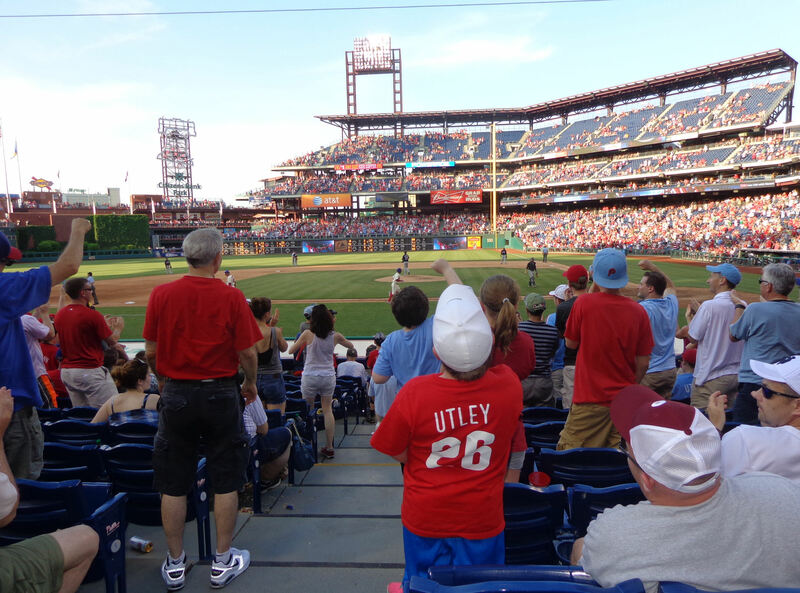 While we were en route to our new seats, Jimmy Rollins hit a 2-run homerun to bring the score to 3-2 Rays. We couldn’t see the homerun from where we were walking, but we could hear the crowd going crazy for J-Roll. It was a 3-run jobber that gave the Phils a 5-3 lead. 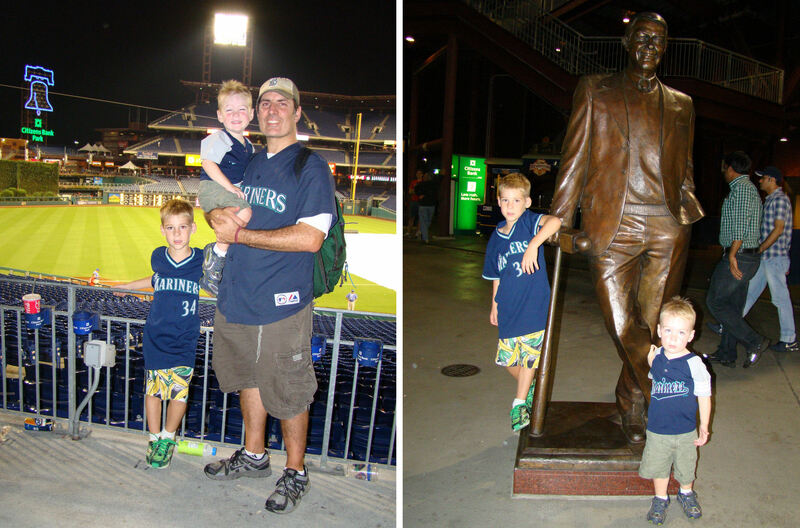 …we saw a cute father-son scene going down out front by the Michael Jack Schmidt statue. Pretty cool scene. 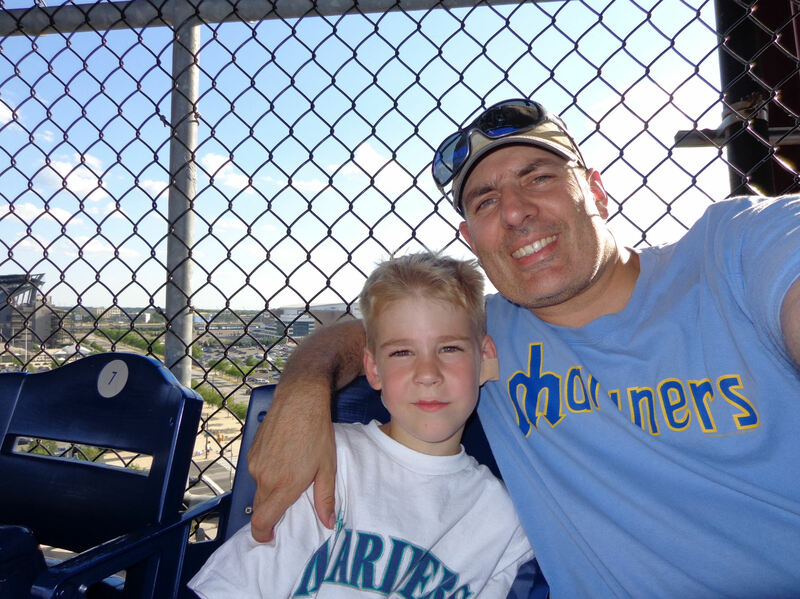 The funniest part was that this father-son combo were leaving the game in the fourth inning! But they were obviously have a great time together, so it was pretty cool to spy on their good time for a few seconds. So we were having a great time in the upper deck. The shady seats were really great. But we couldn’t stay put for too long. At one point, I noticed that the shadow of the upper-deck was reaching across the field from LF all the way behind home plate. We stood up and tried to see if we could find ourselves in the shadows on the field. But we couldn’t. Then I realized how we could find ourselves in the shadows. We had to go to the far end of the upper deck out by the LF foul pole. 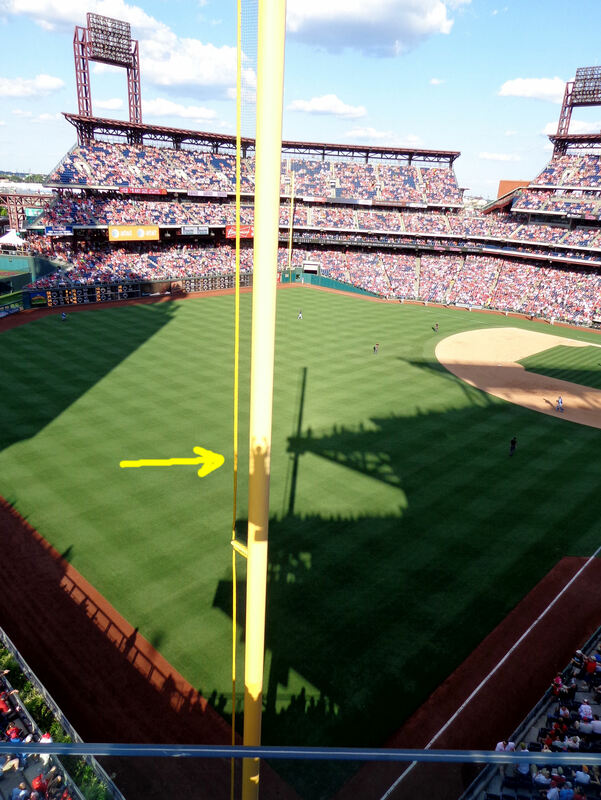 Check out Tim’s shadow on the LF foul pole. 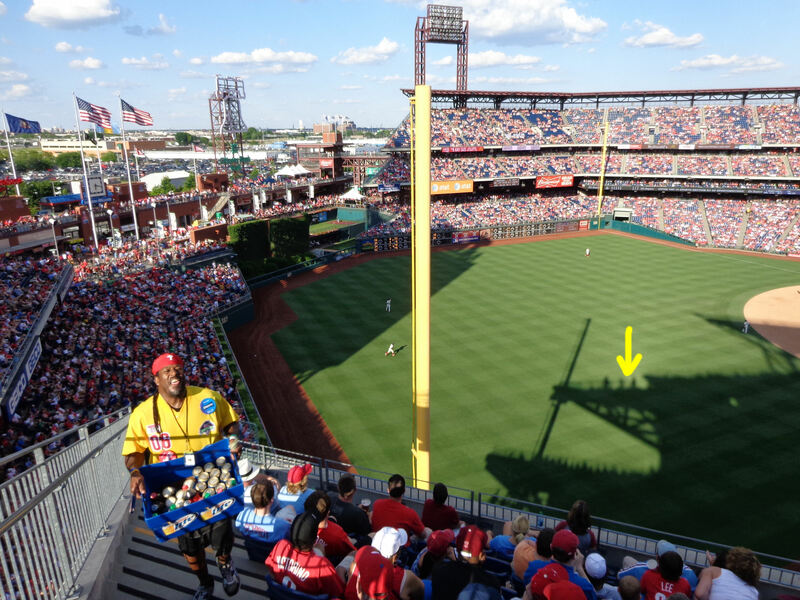 My shadow is in the LF grass just to the right of the shadow of the foul pole. 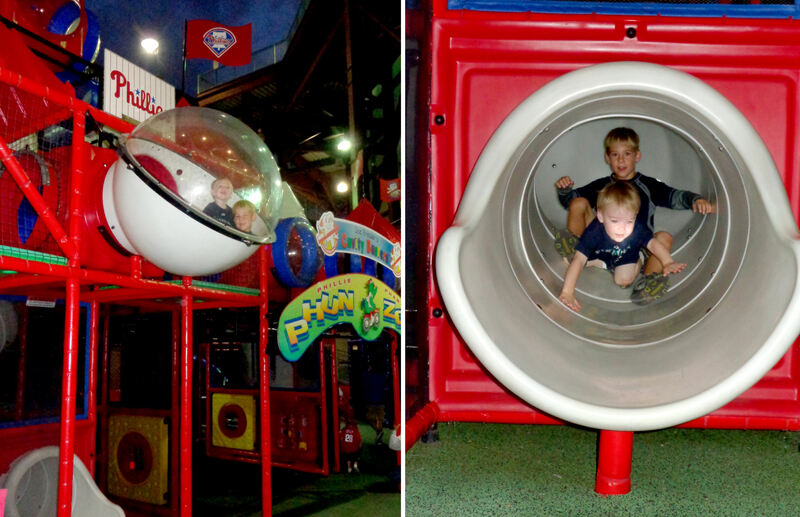 The kids’ play area closes at the end of the 7th inning. So quickly headed over there so Tim could play for about 5 minutes. And then headed back to the SRO area behind the 3B side. We wanted to make an attempt at getting an umpire baseball. It was going to be near impossible because the seats were still packed behind the 3B dugout and, of course, we weren’t even down there. 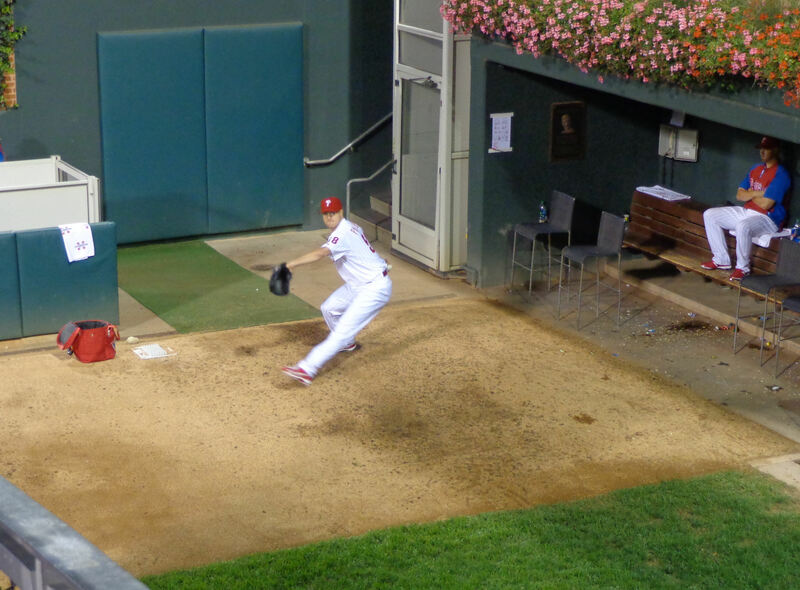 Papelbon had not blown a single save opportunity this season…until this game that is. 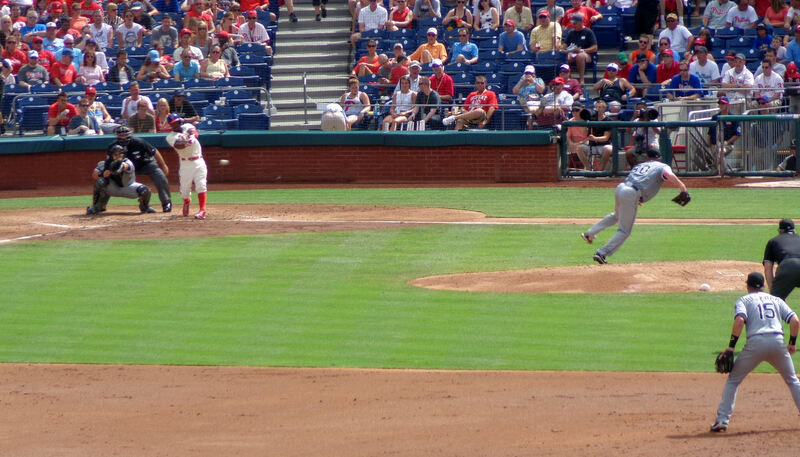 Starting with a 2-run lead, Papelbon twice had the Rays down to their final strike. The crowd was on their collective feet. 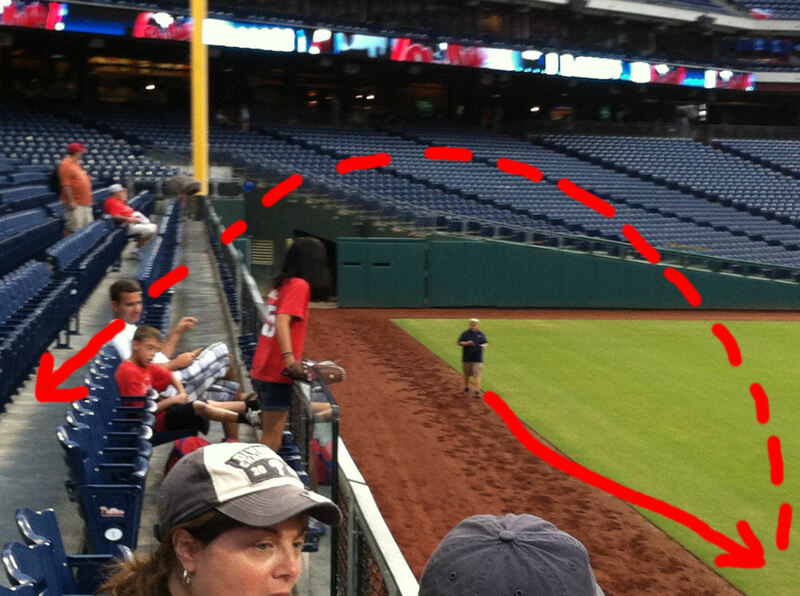 We were inching down toward the third row where there was a decently clear path to the umpires’ tunnel. 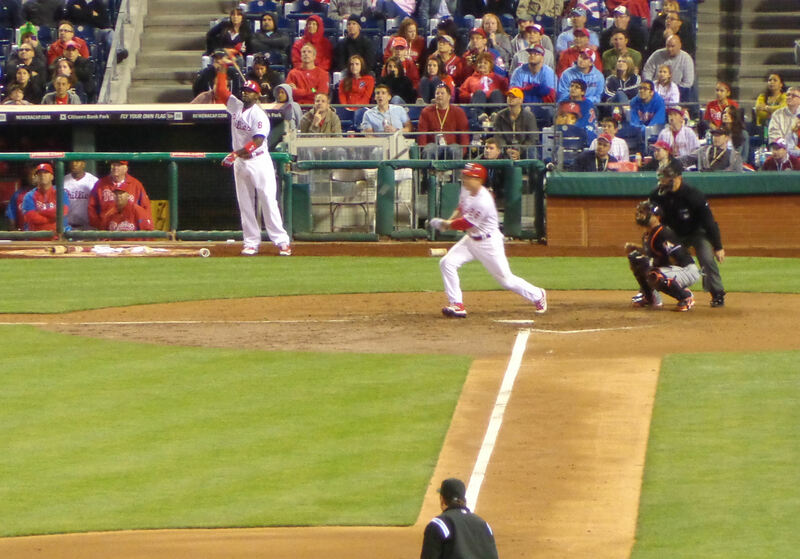 And twice Papelbon gave up RBI singles instead of recording the final out of the game. The save was blown. And we were heading to the bottom of the ninth. …pinch hit to lead off the inning. And he hit a walk off homerun to end it. I hate when closers blow a save and are then awarded the win minutes later when his team picks him up. Well, that’s what happened with Papelbon. He vulture the win from his teammate, Raul Valdez. I should note that Thome’s homerun was a historic blast. It was his 609th homerun, bringing him into a tie with Sammy Sosa at seventh on the all-time career homerun list. Let’s hope Thome passes Sosa, but doesn’t climb any higher on the list (next would be the undisputedly better than Thome, Ken Griffey, Jr.). But that’s not the sum total of the historic value of the Thome blast. It was also his 13 career walk-off homerun, breaking a tie with Mickey Mantle and making Thome the undisputed all-time career leader in walk-off homeruns. 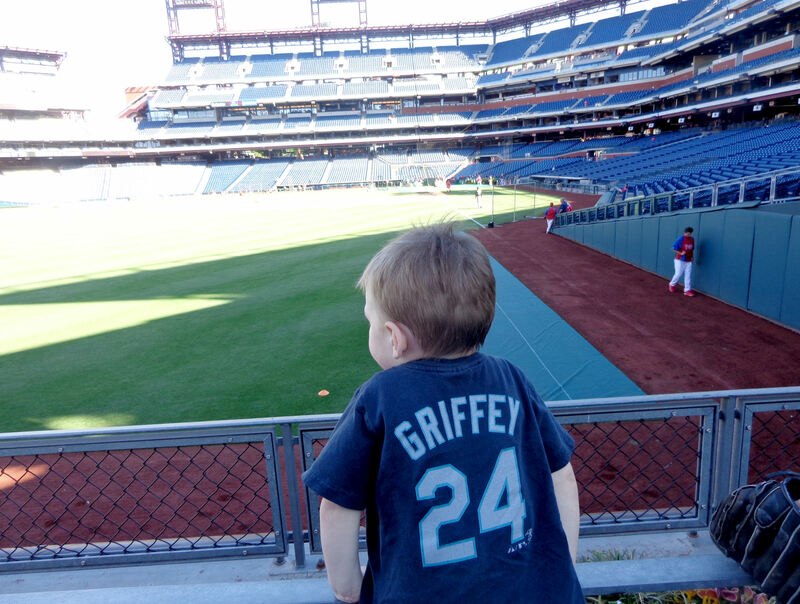 (Note: Like Griff, Mickey Mantle was also undisputedly better than Jim Thome). 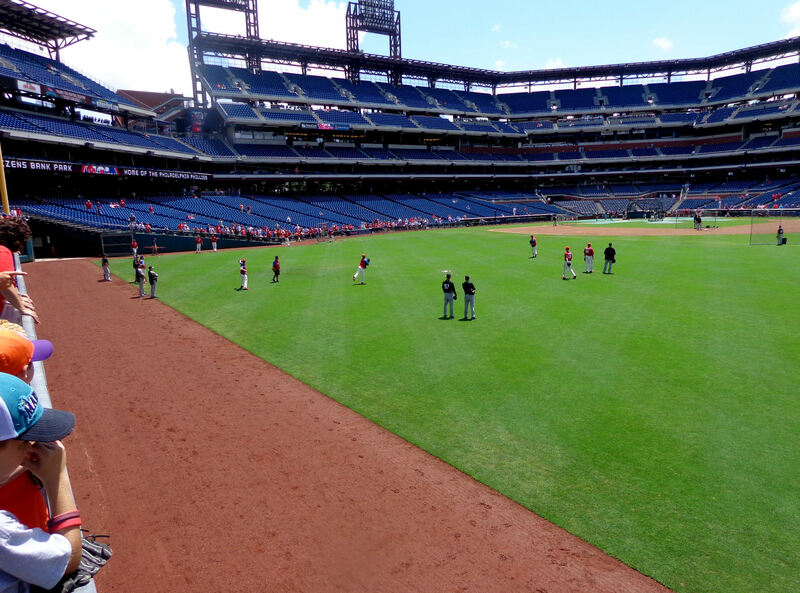 Anyway, we got into pretty decent position for an umpire baseball, decent for a non-Diamond Club attendee at Citizens Bank Park. But Jim Joyce tossed all of his extra baseballs into the Diamond Club. But we didn’t leave empty handed. As the Rays relieves and bullpen staff made their way into the dugout, Rays bullpen catcher Scott Cursi tossed Tim our final baseball of the day. By the way, in an interesting side note: we have been to two Rays games this season. 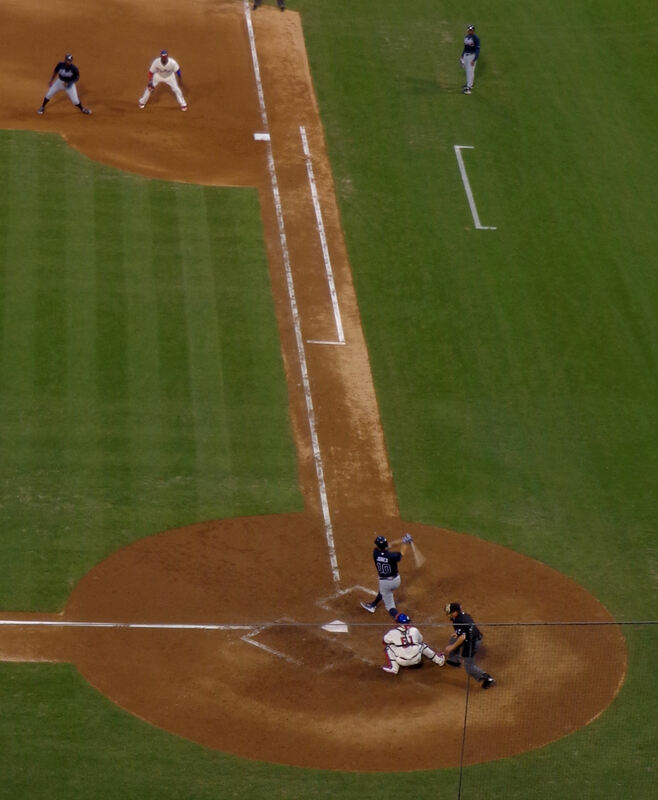 The Rays lost both of them on walk-off homeruns in the bottom of the 9th. And Scott Cursi tossed us a ball as he entered the dugout both times. It was a great reprise our 2-man team for this game. Kellan will be back with us for our next game. But I think I’ll definitely do at least one more *just Tim and Dad* game this season. We’re a great 2-man team!